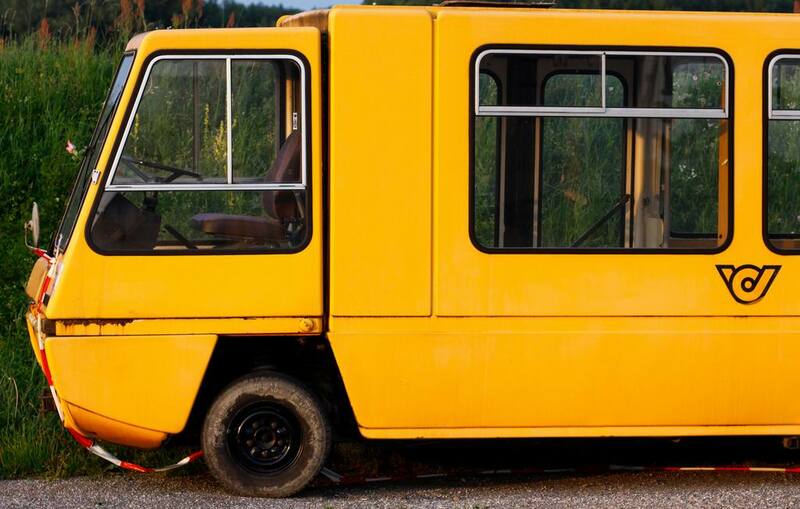 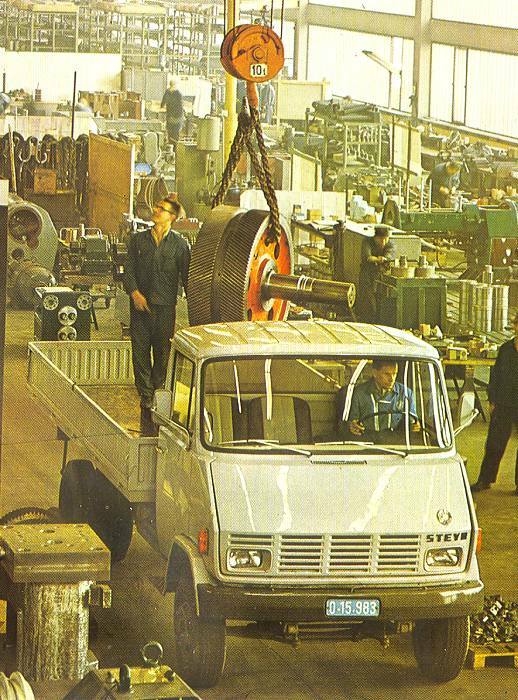 Steyr-Daimler-Puch was a large manufacturing conglomerate based in Steyr, Austria, which was broken up in stages between 1987 and 2001. 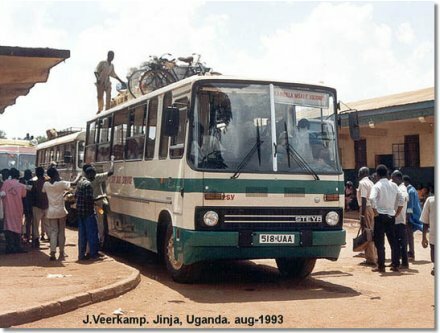 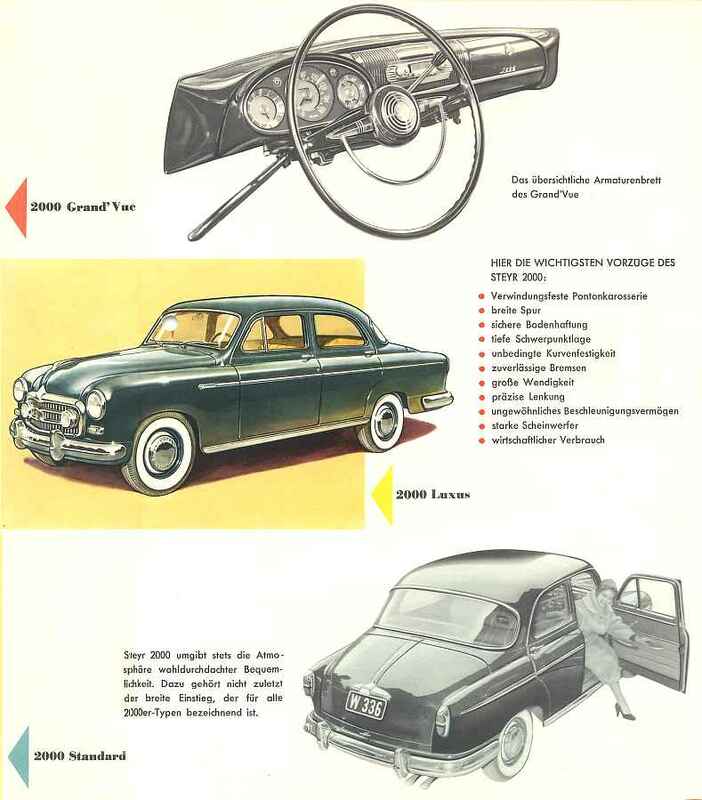 The component parts and operations continued to exist under separate ownership and new names. 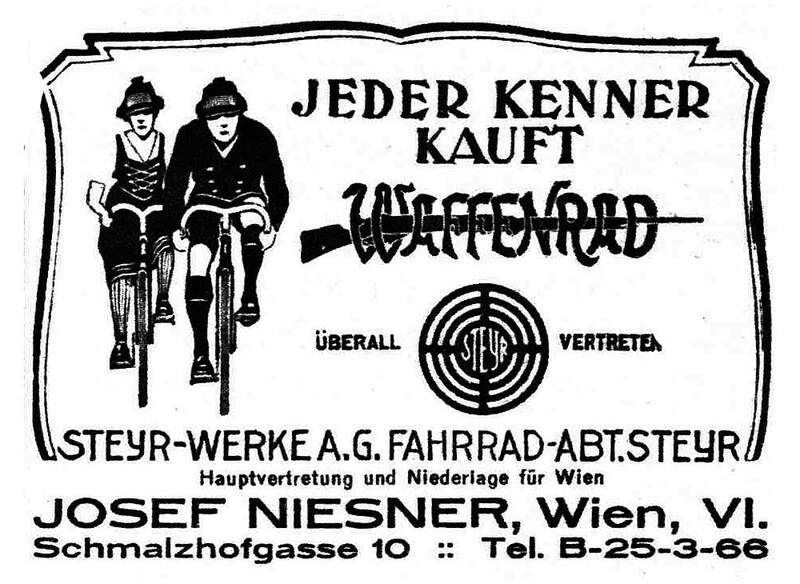 The company, initially known as Josef und Franz Werndl and Company was founded in 1864 as a rifle manufacturer. 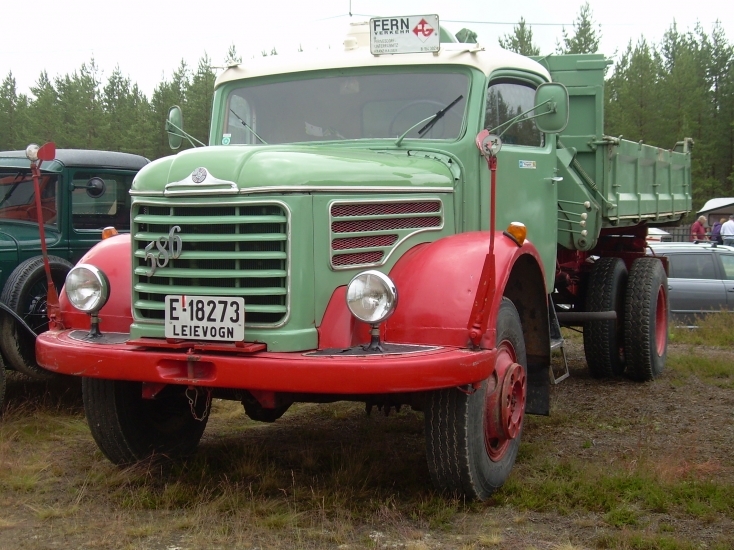 It grew rapidly during the First World War, by the end of which it employed 14,000 people. 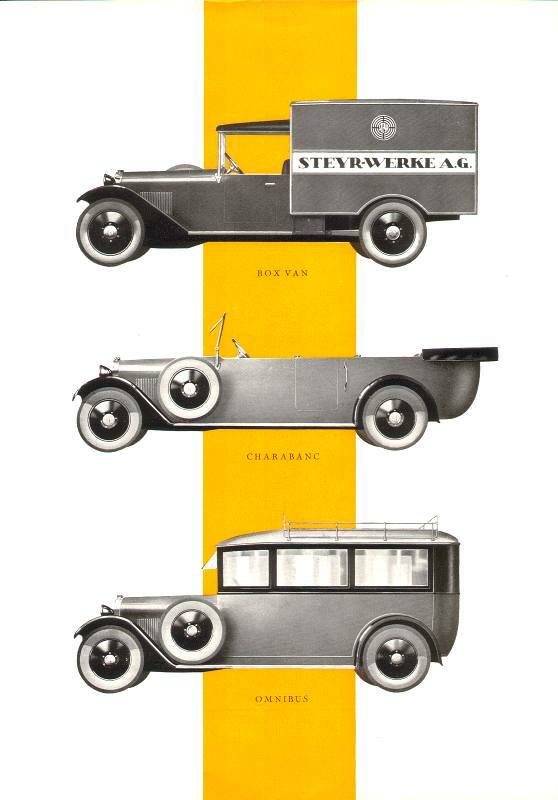 The company began producing bicycles in 1894, and Steyr automobiles after 1918. 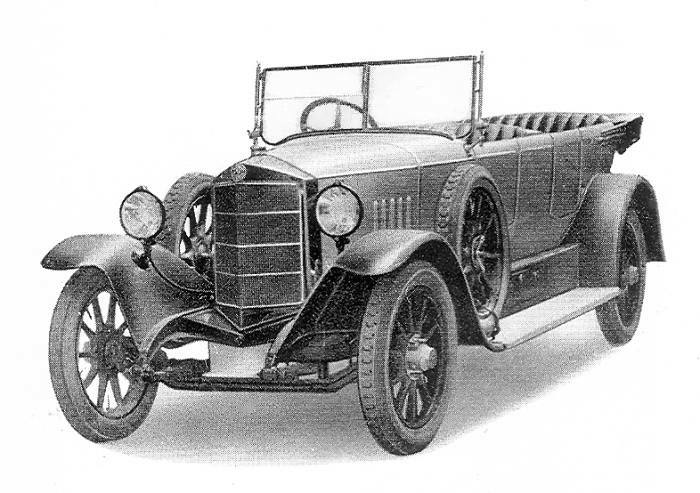 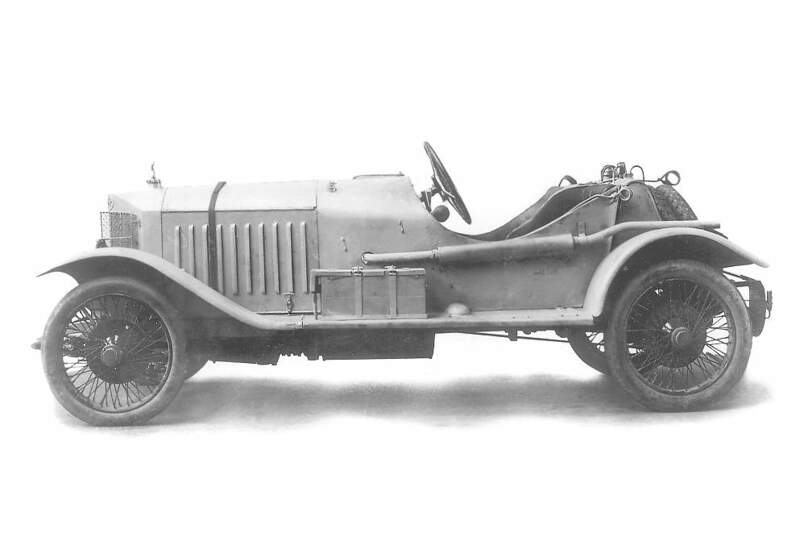 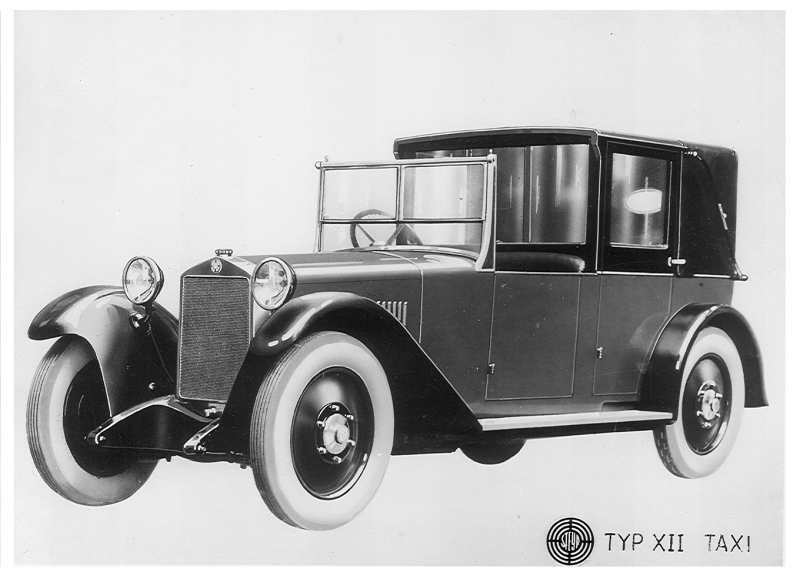 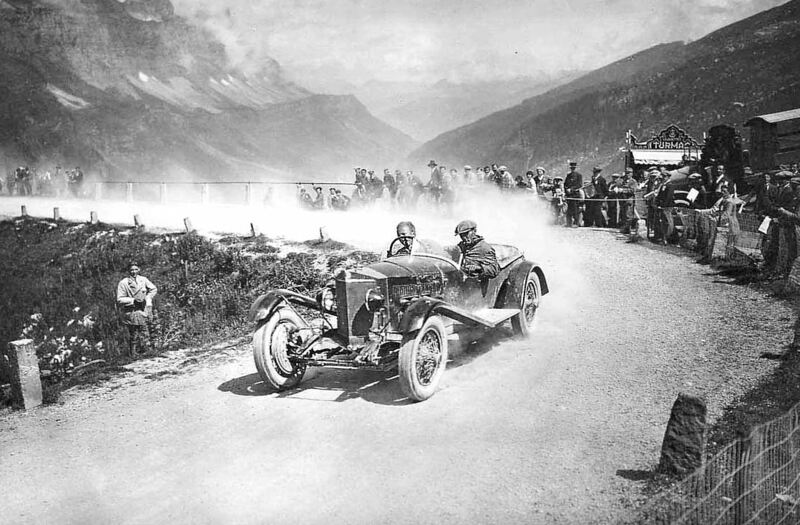 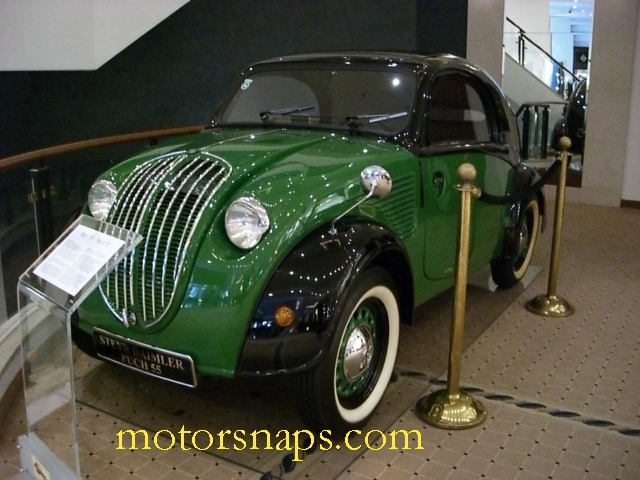 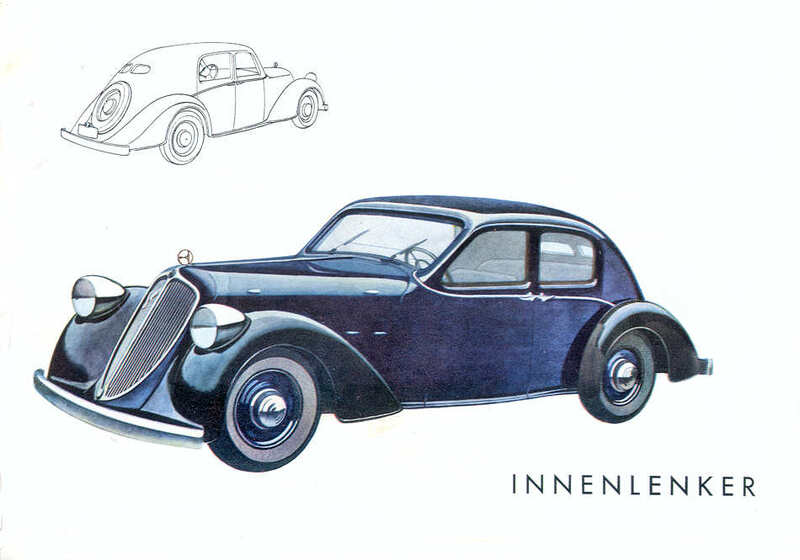 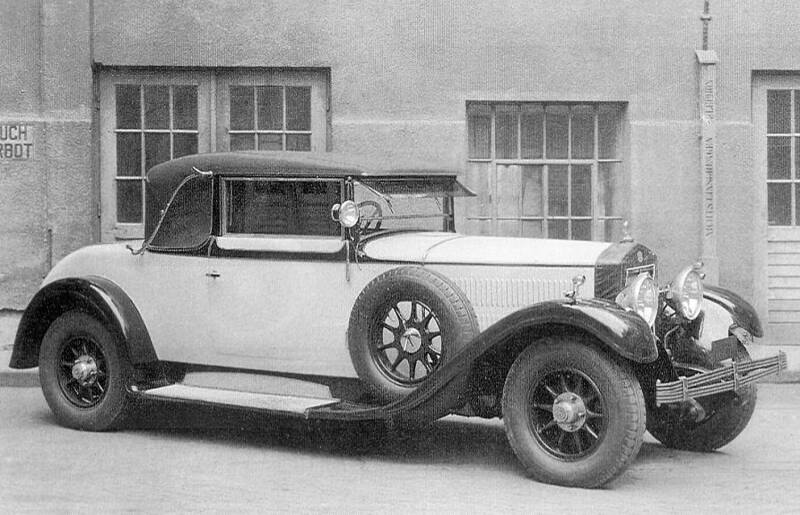 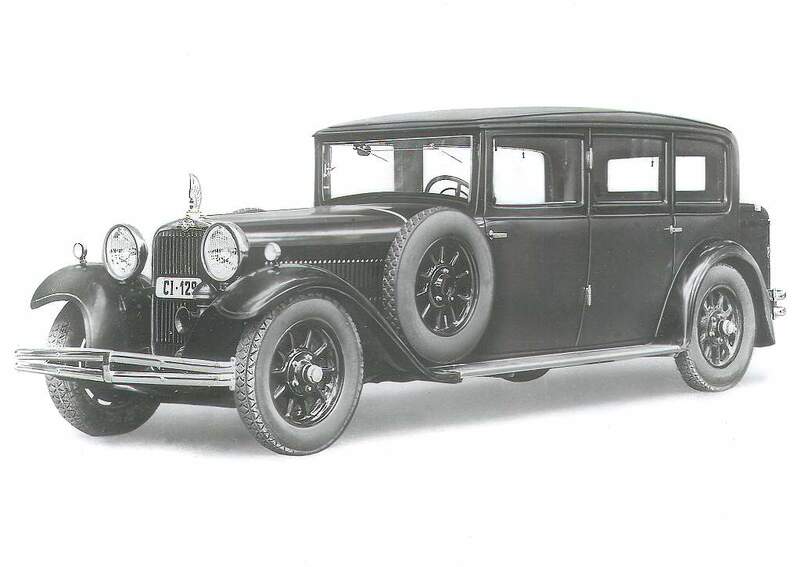 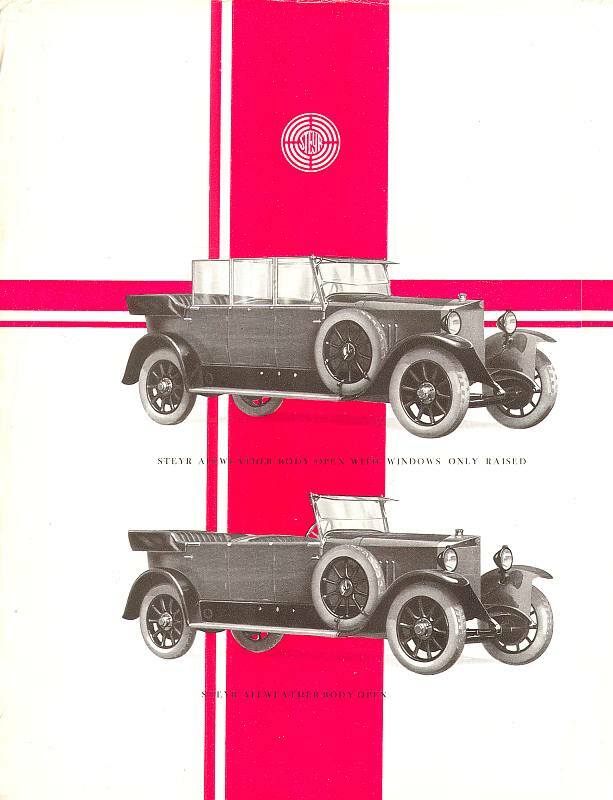 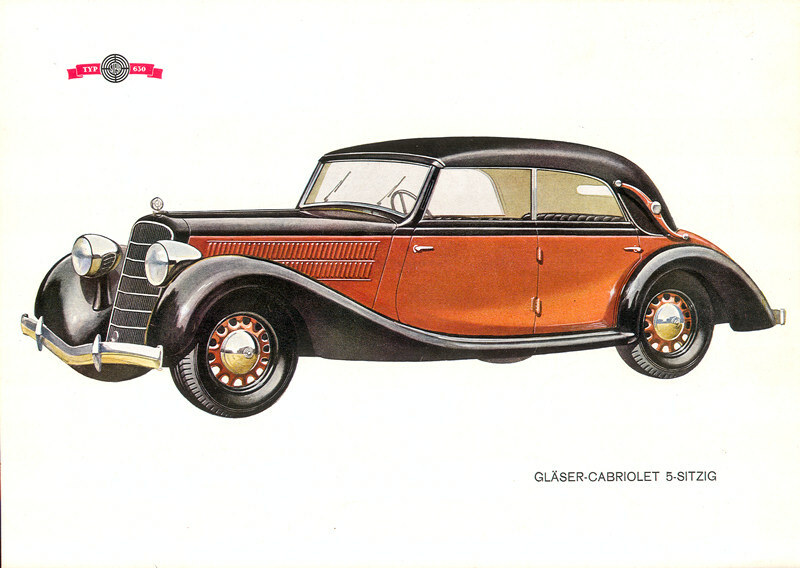 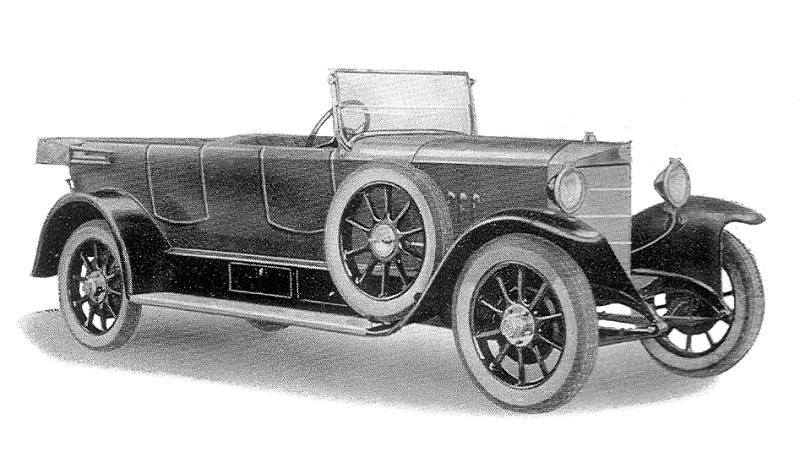 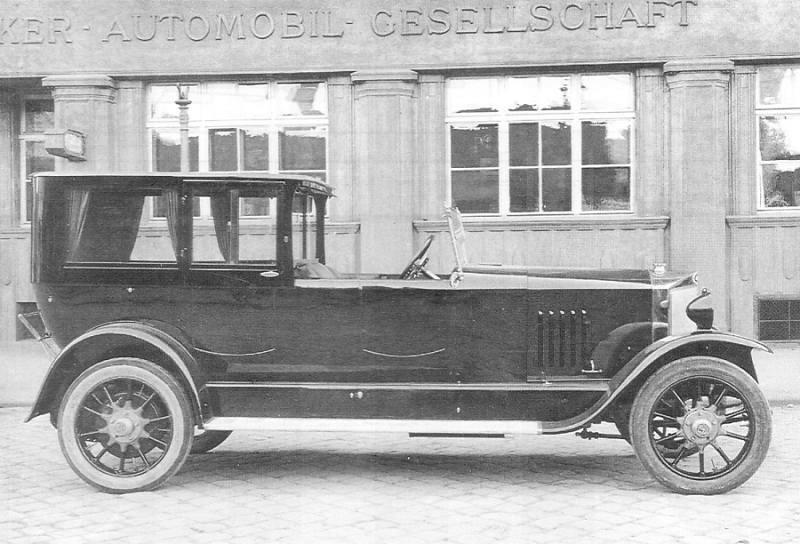 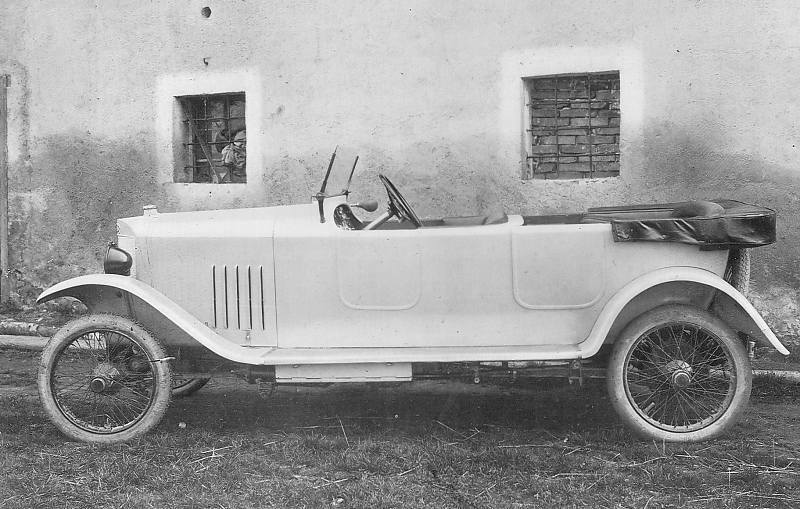 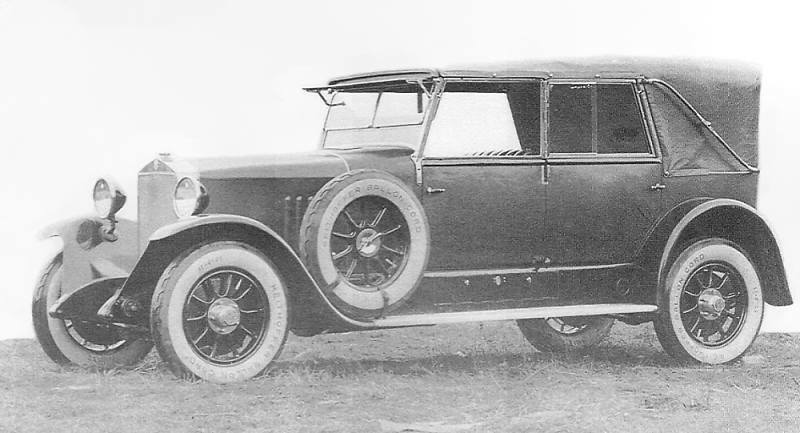 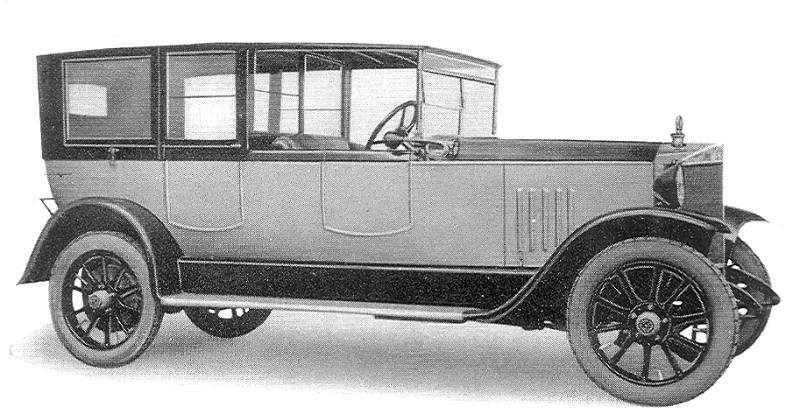 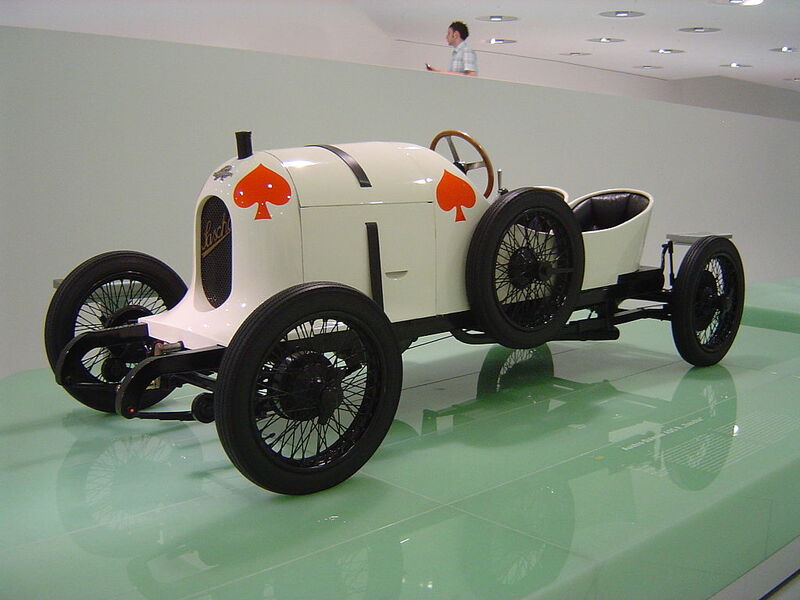 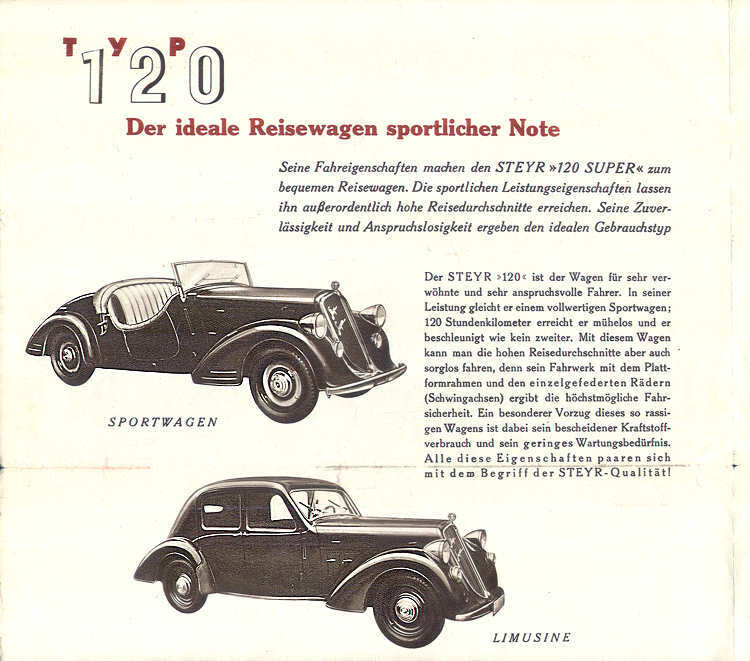 In September 1917 Steyr recruited Hans Ledwinka, now remembered as one of the great automobile engineers of the twentieth century, but then relatively unknown, to the position of “Chefkonstrukteur”, to lead the creation of their automobile manufacturing businessThe first Steyr car, the six cylinder Type II “12/40” appeared in 1920. 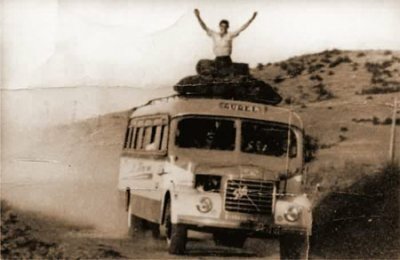 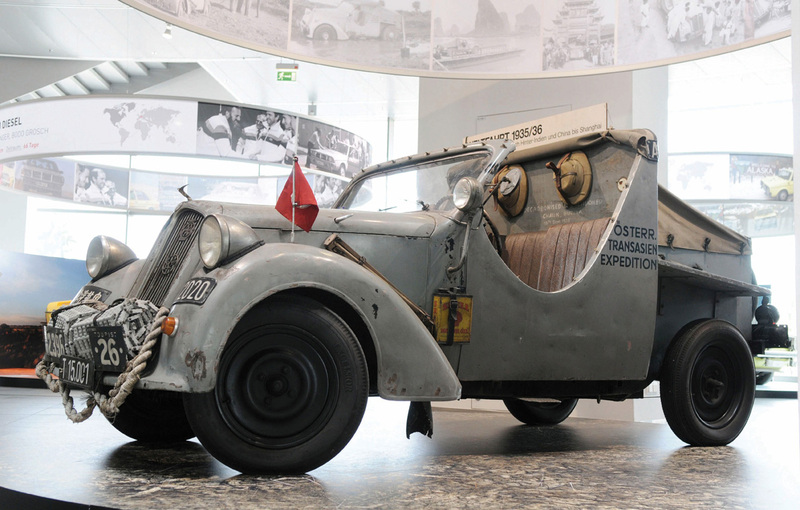 It was heavy and well-built, if a little cumbersome; soon, however, it spawned sports versions with an impressive list of international achievements. 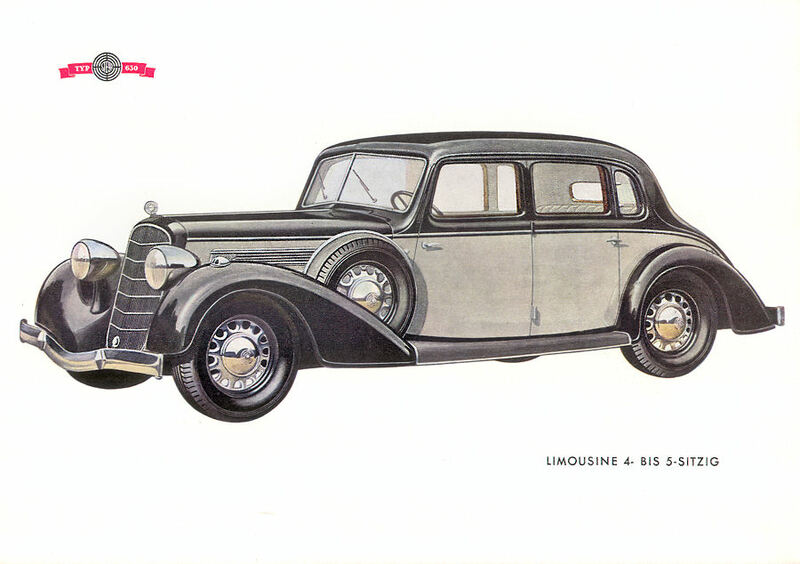 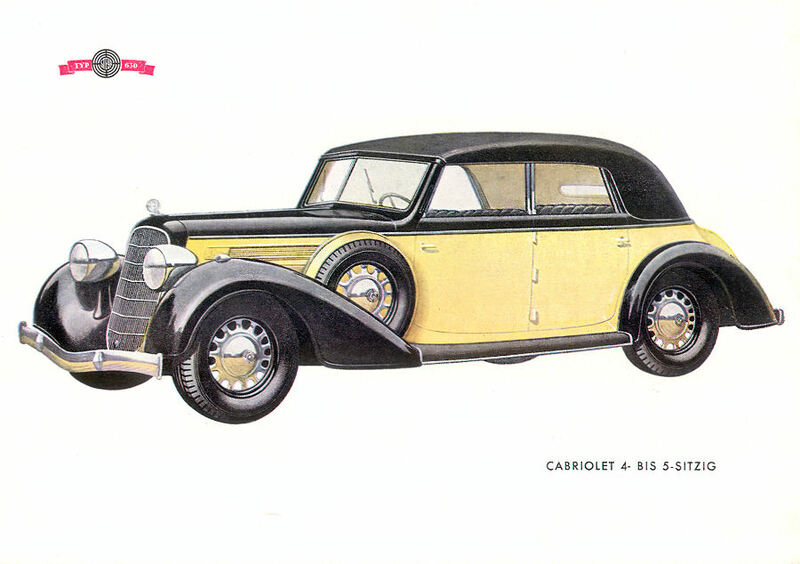 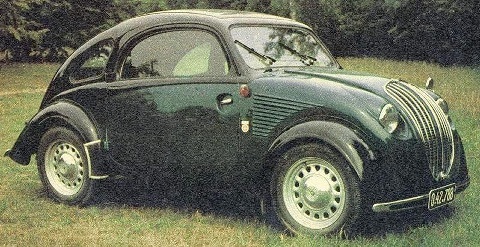 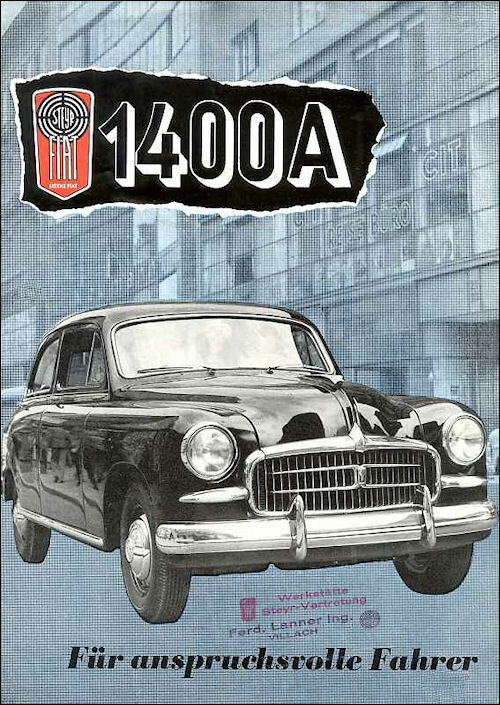 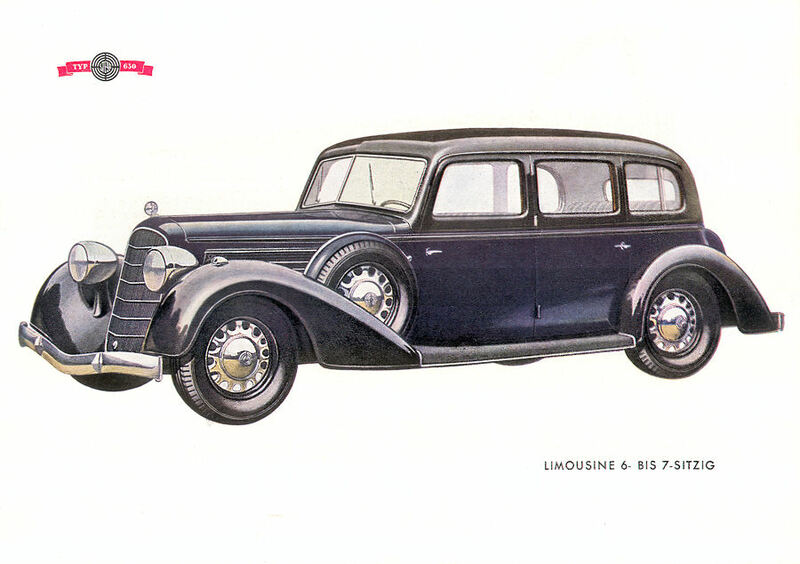 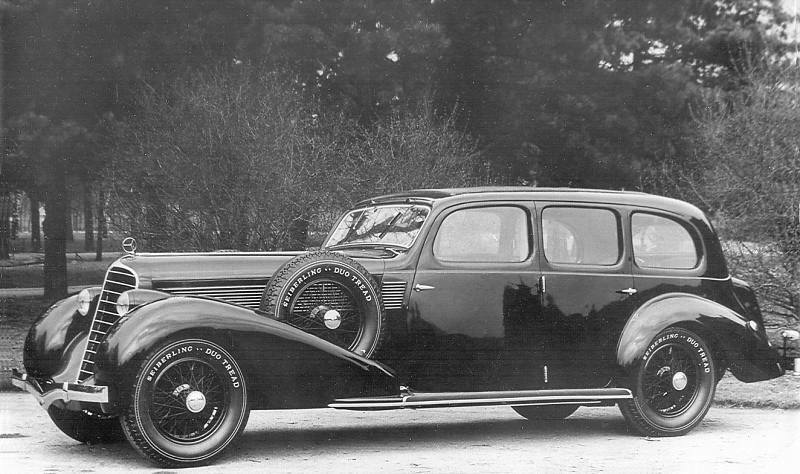 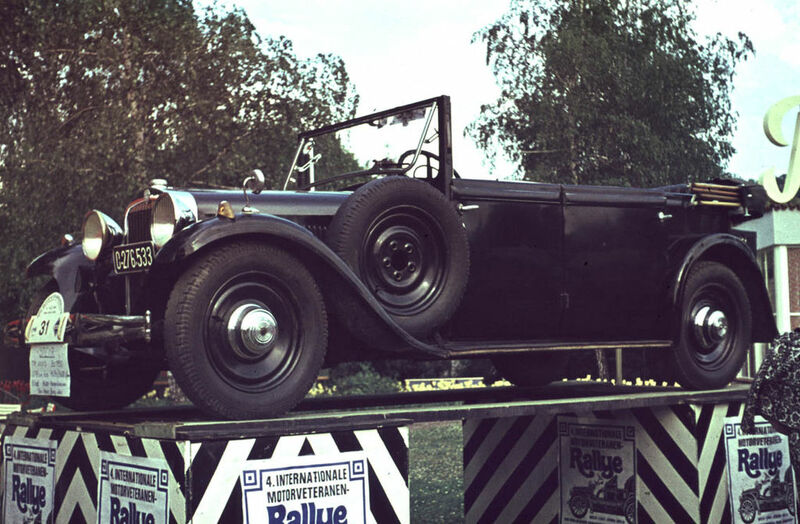 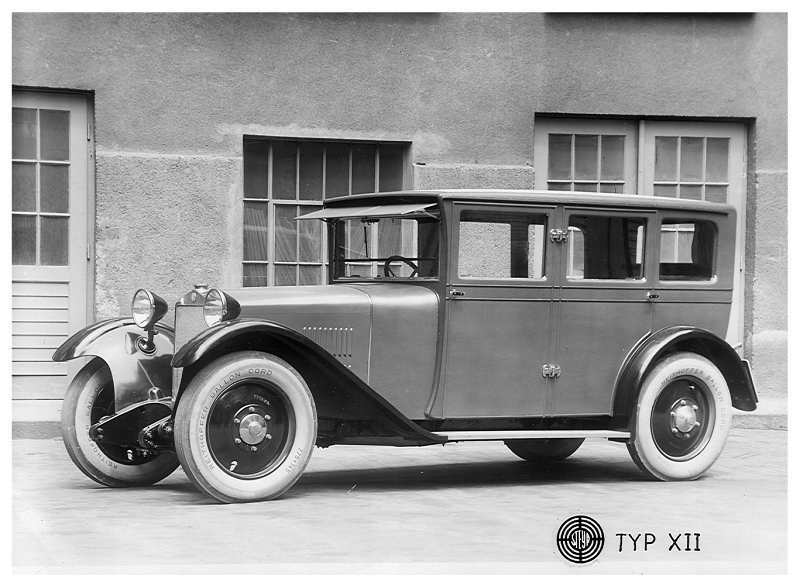 The small but luxurious 1.5 L six Type XII of the late twenties won international motor press acclaim. 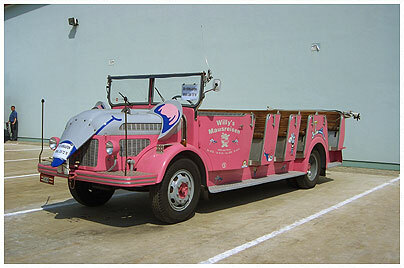 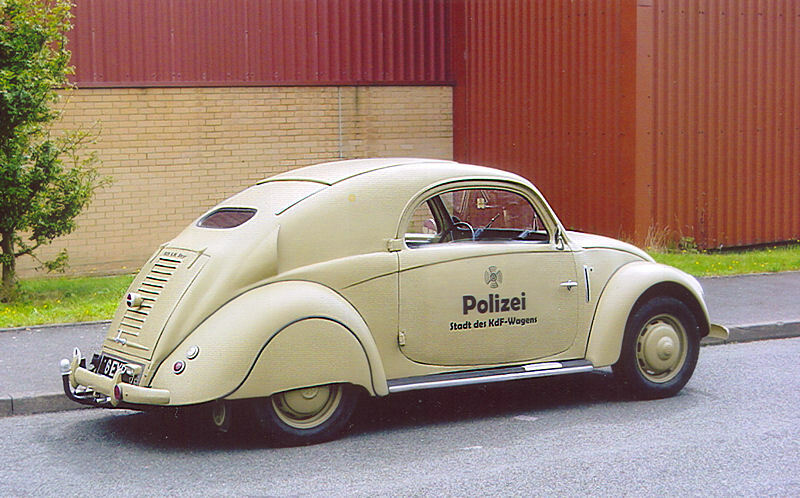 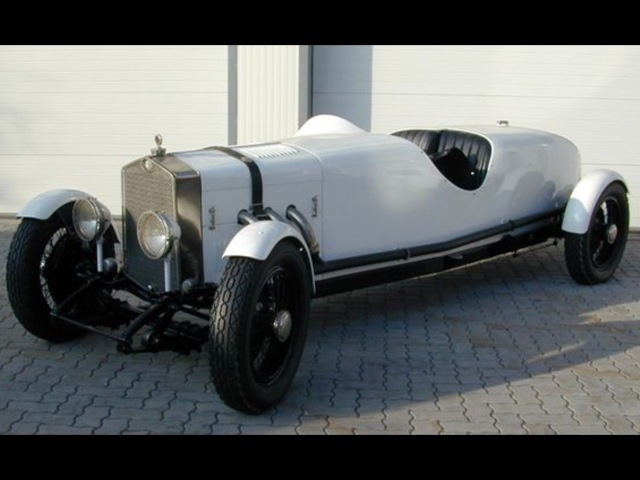 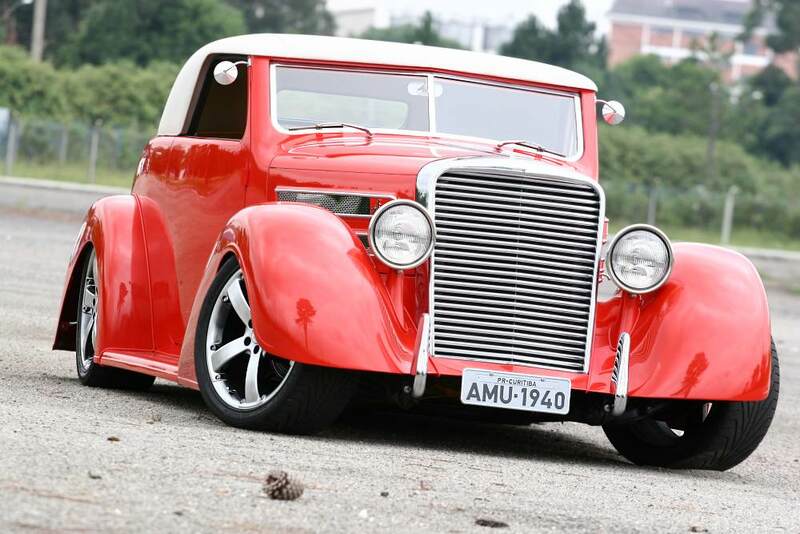 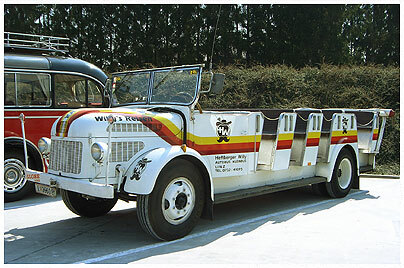 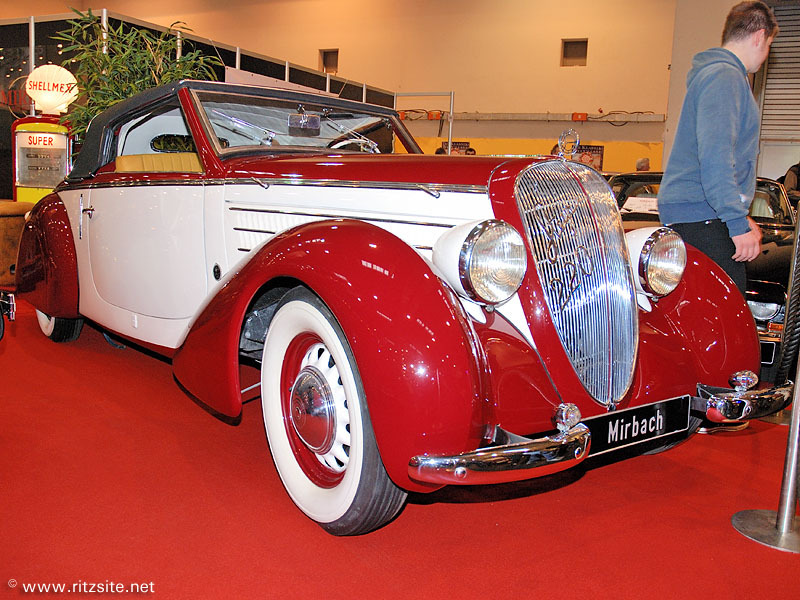 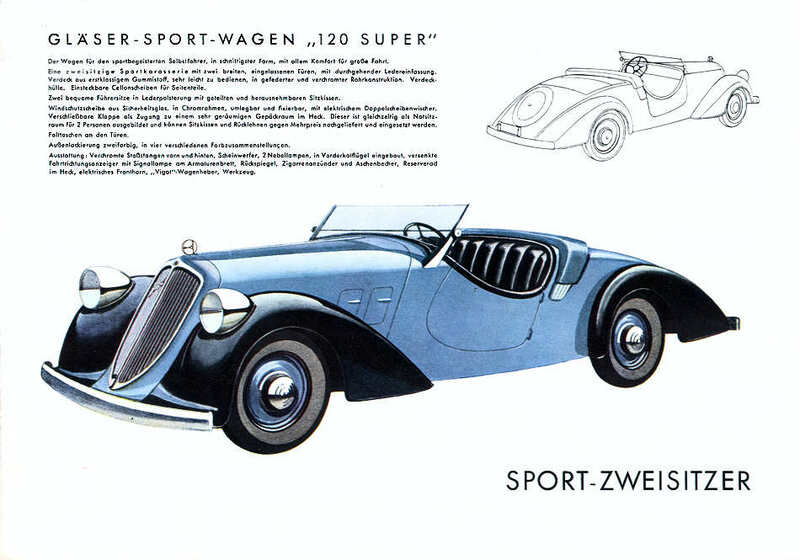 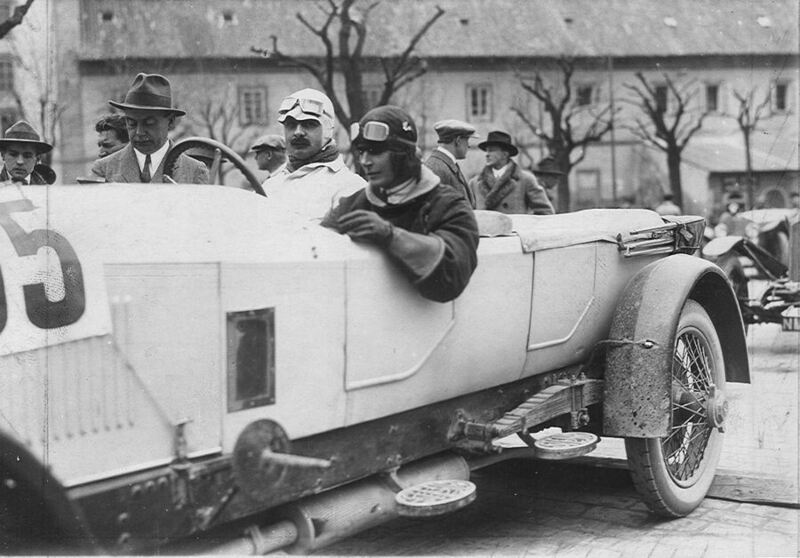 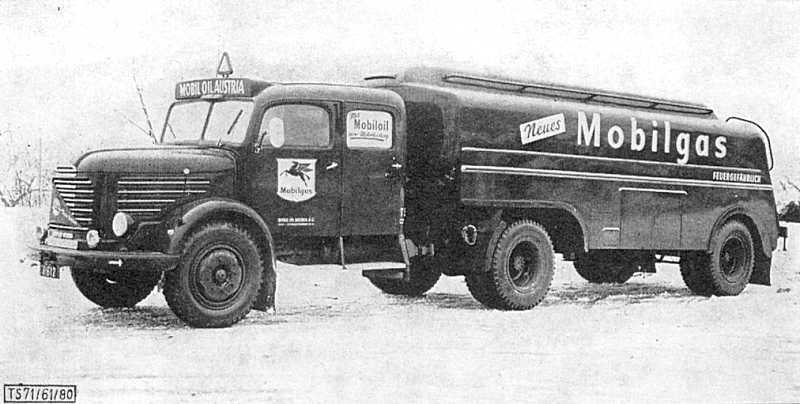 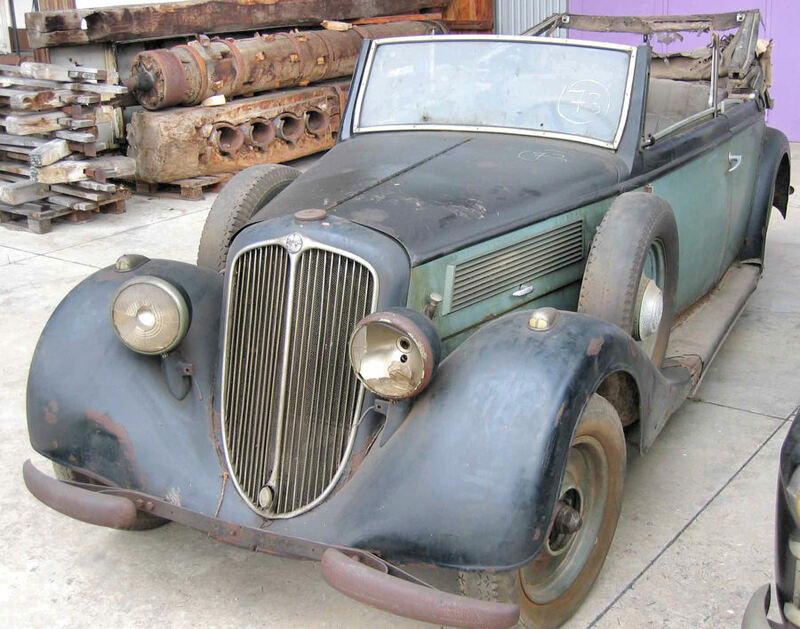 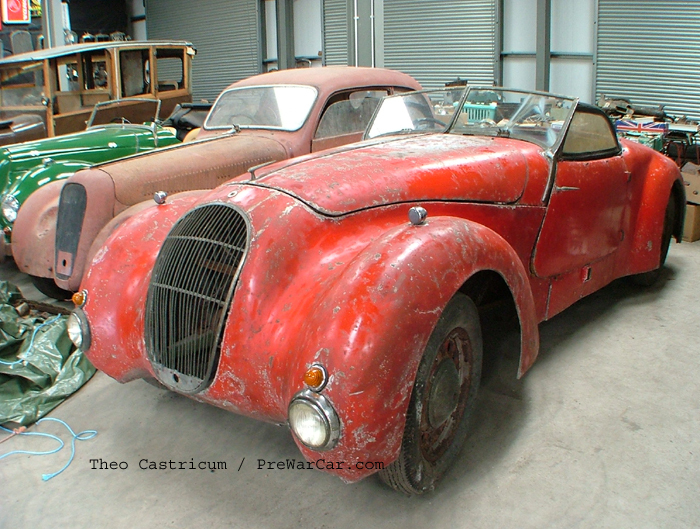 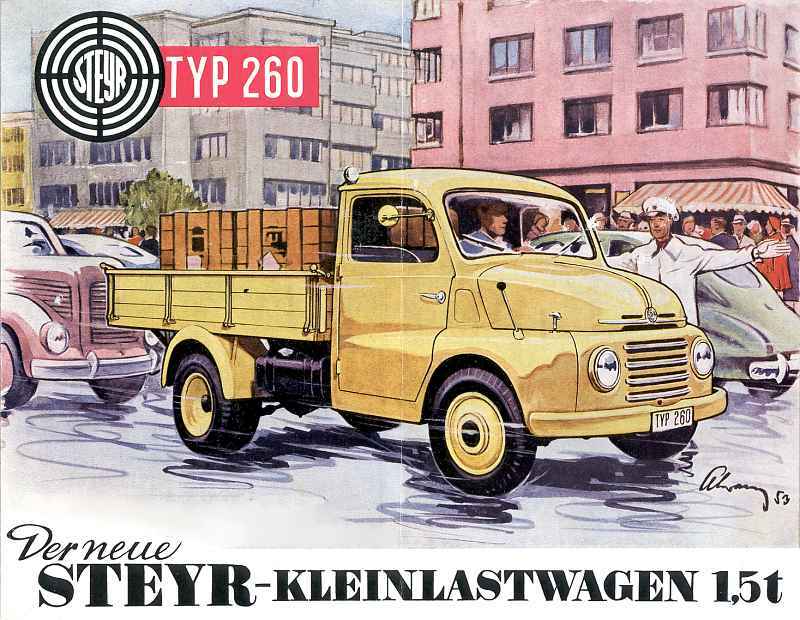 The company changed it name to Steyr-Werke AG in 1924. 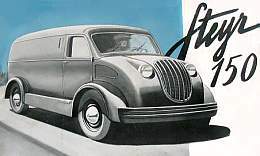 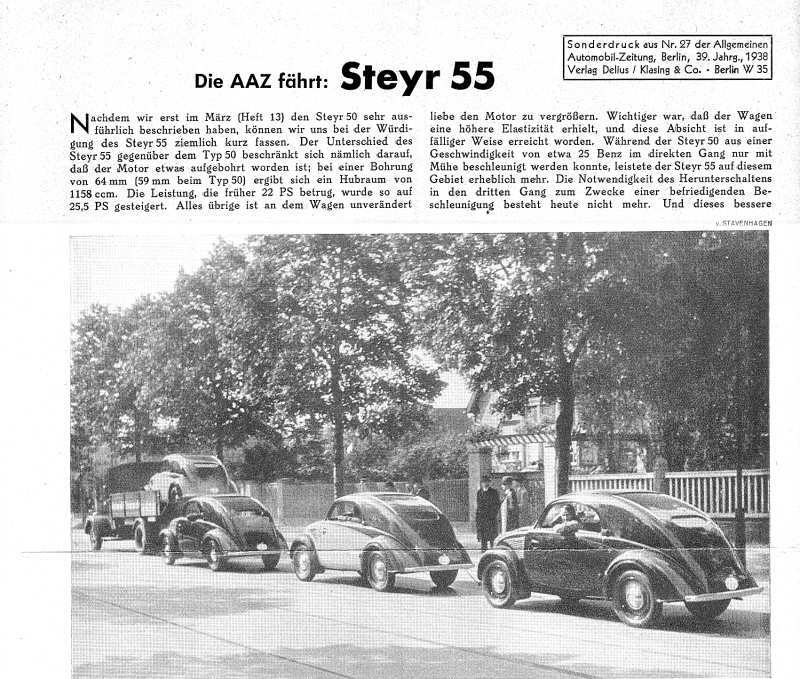 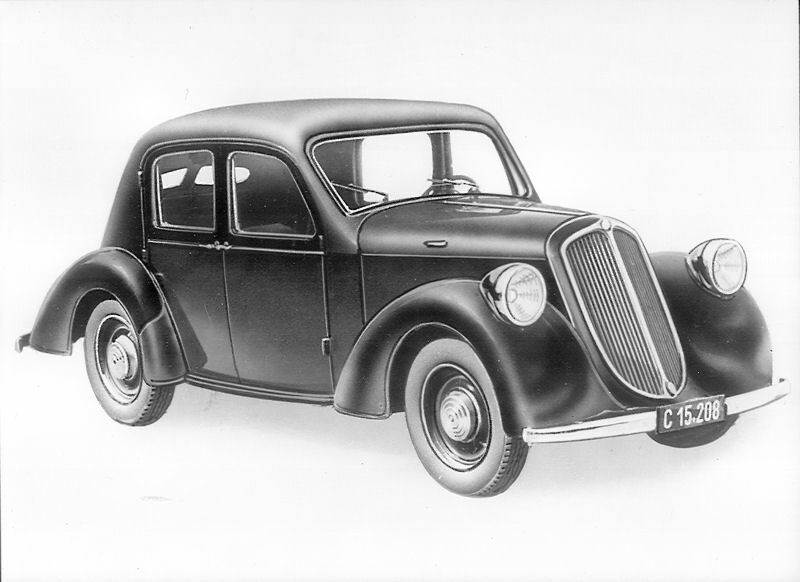 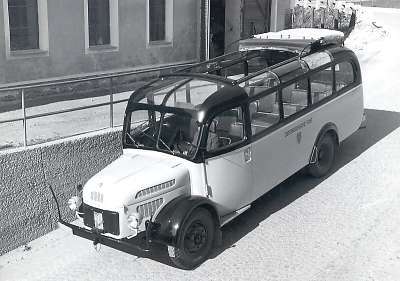 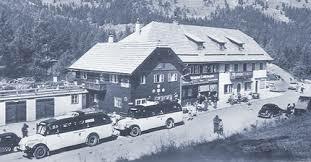 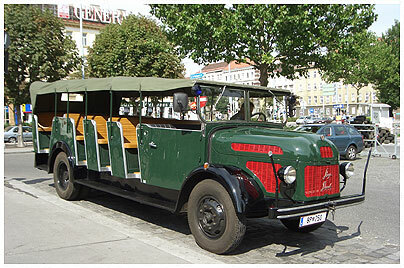 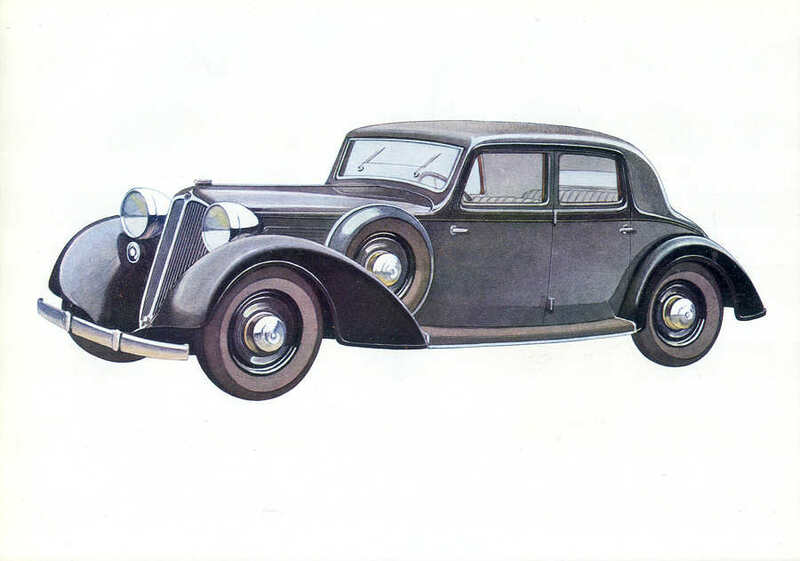 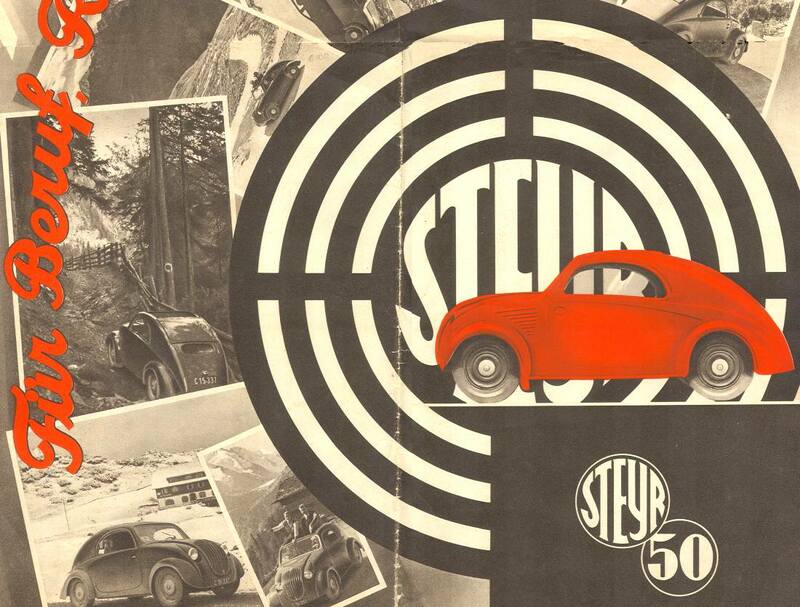 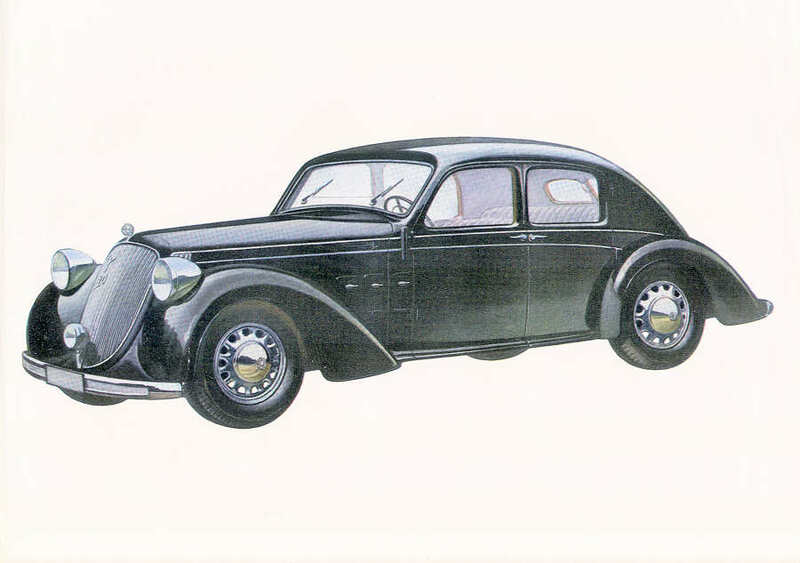 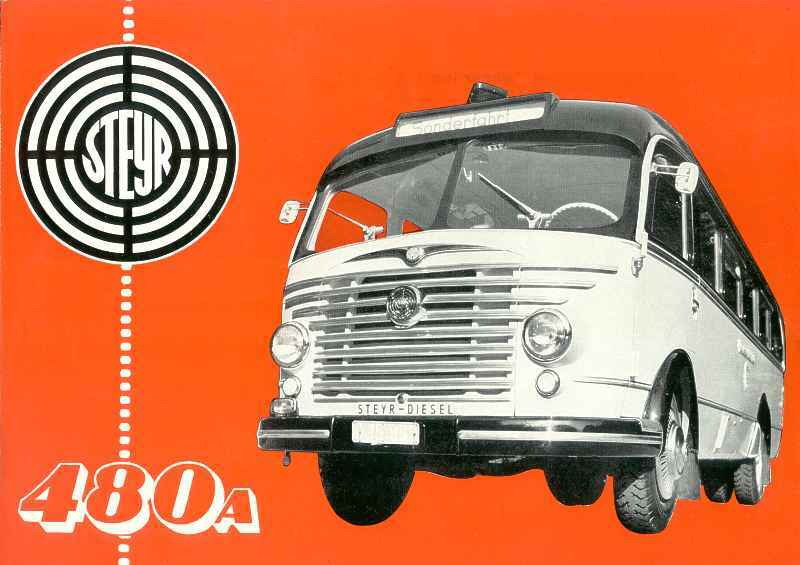 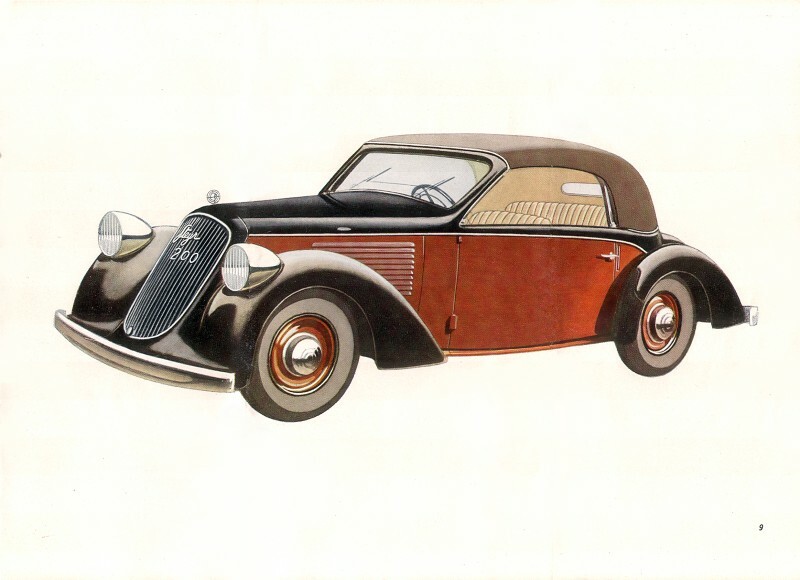 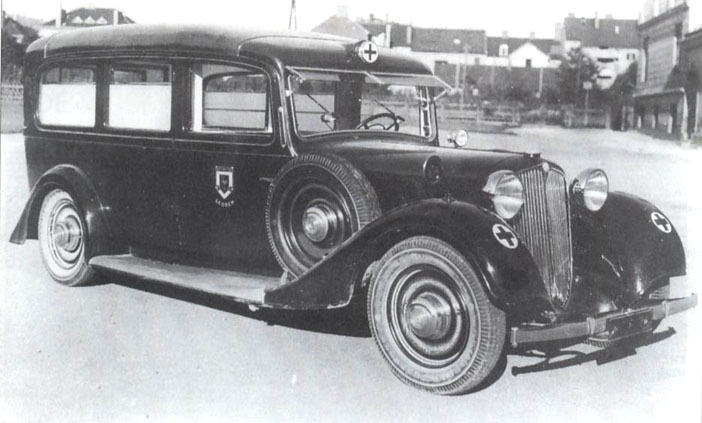 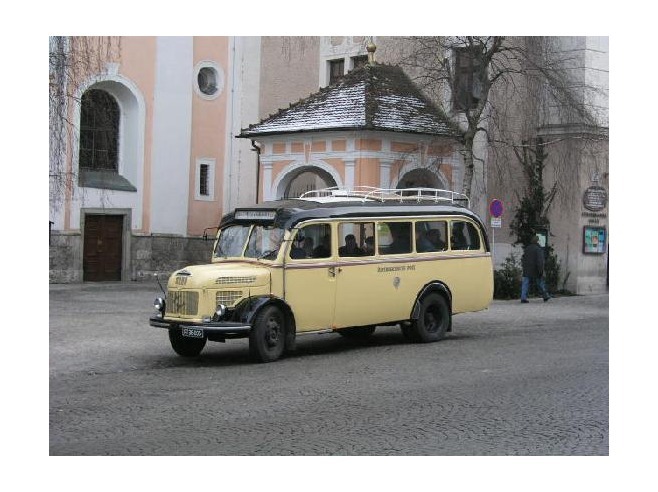 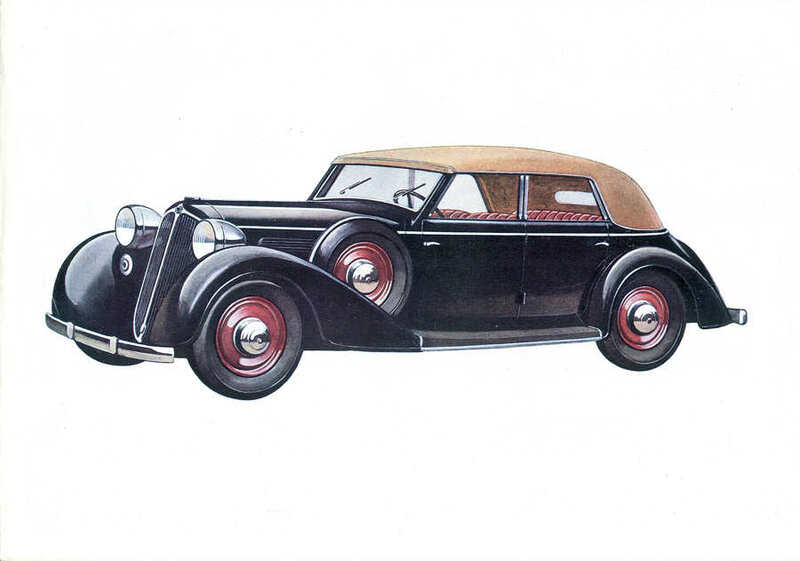 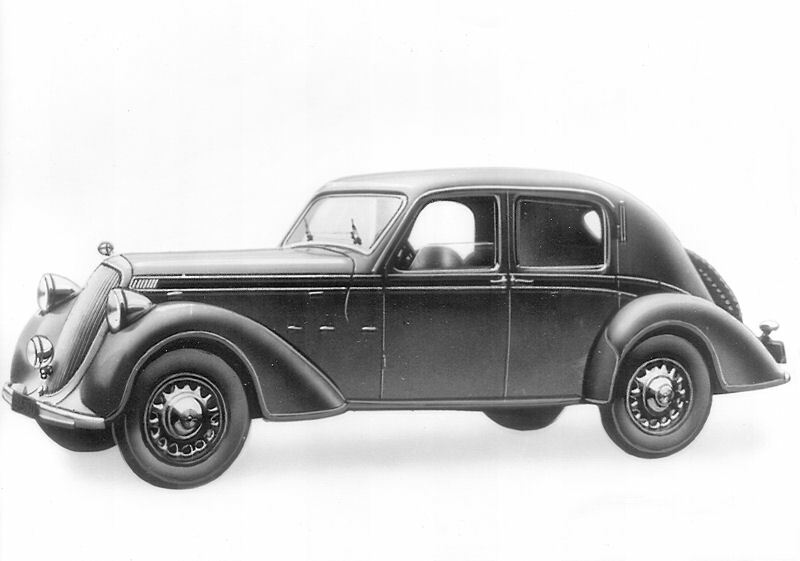 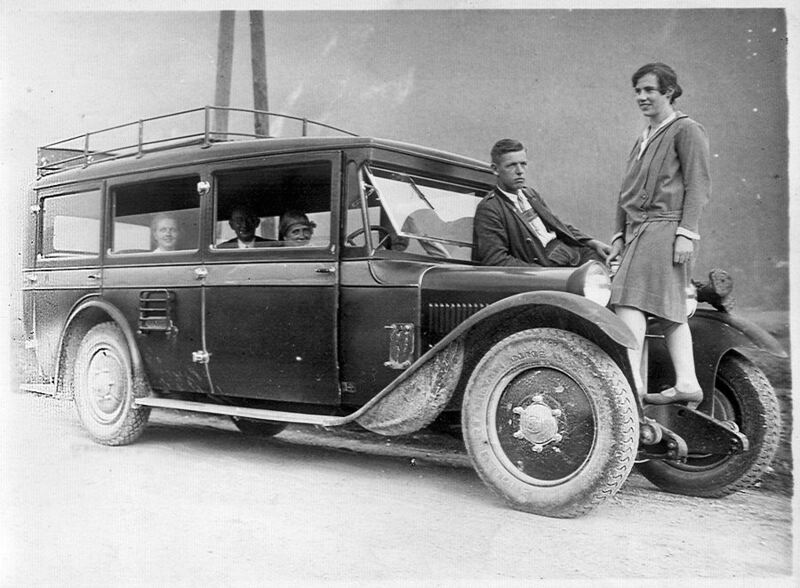 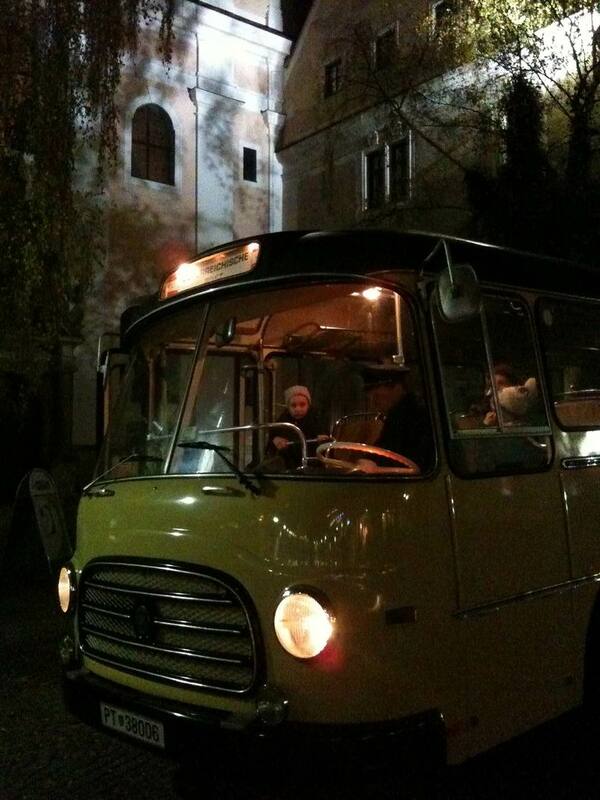 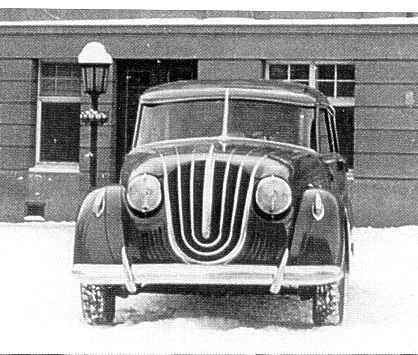 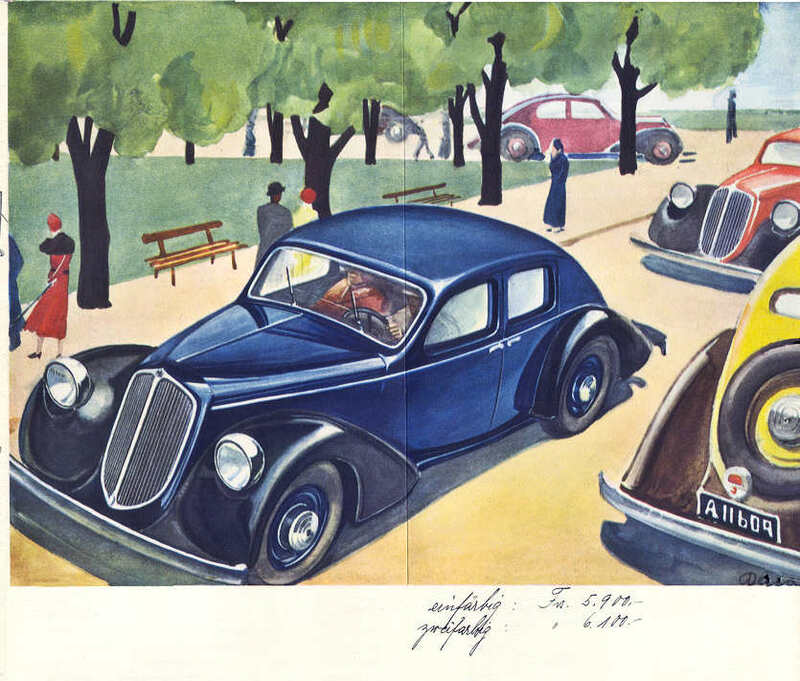 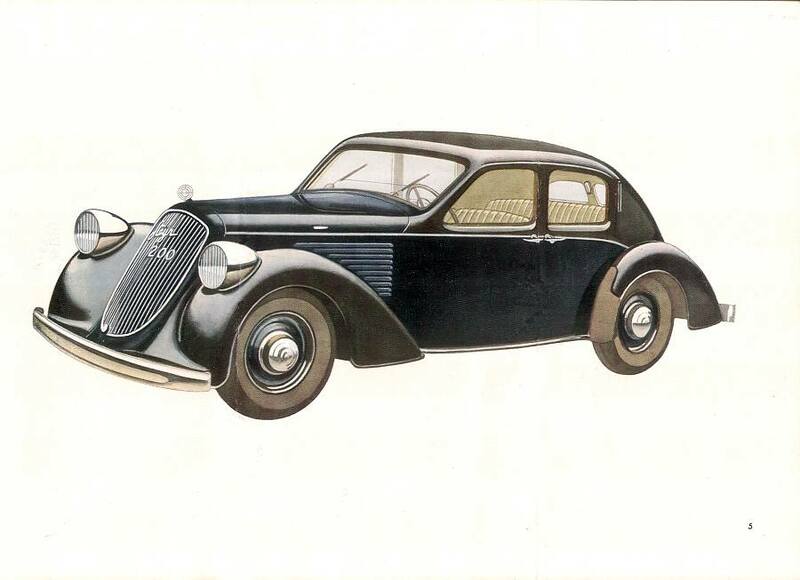 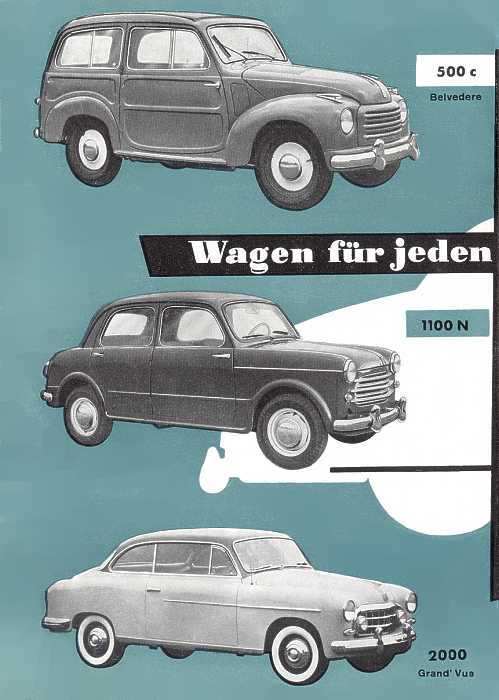 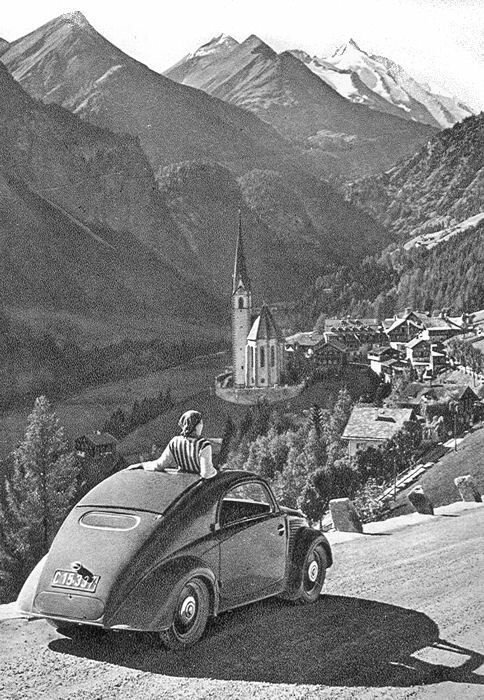 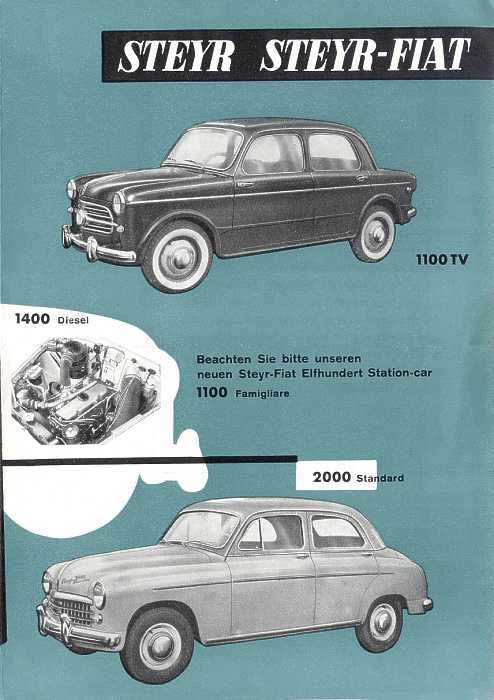 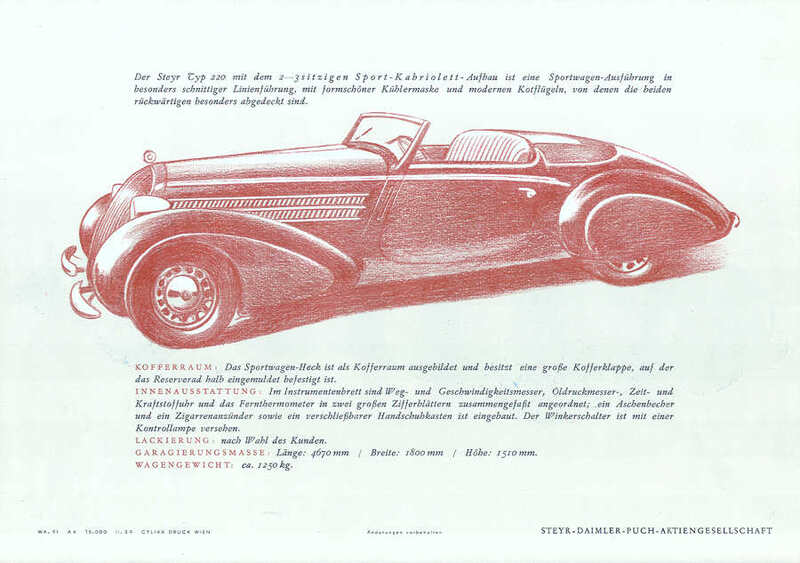 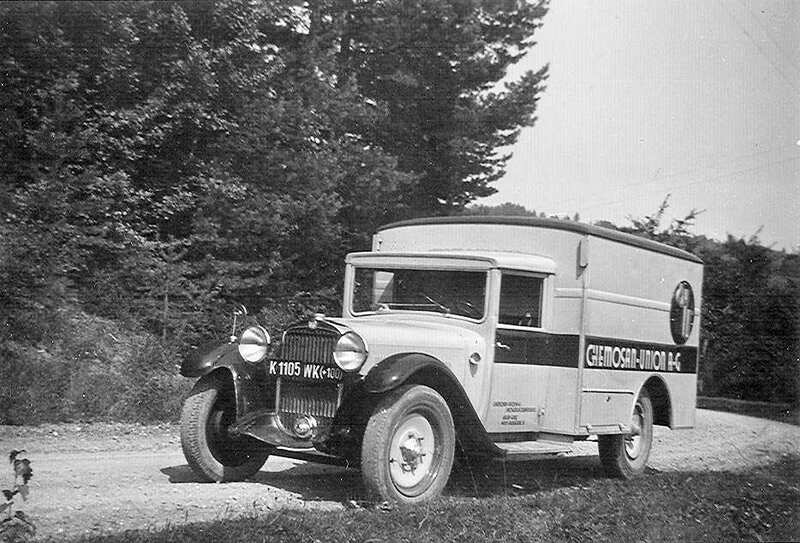 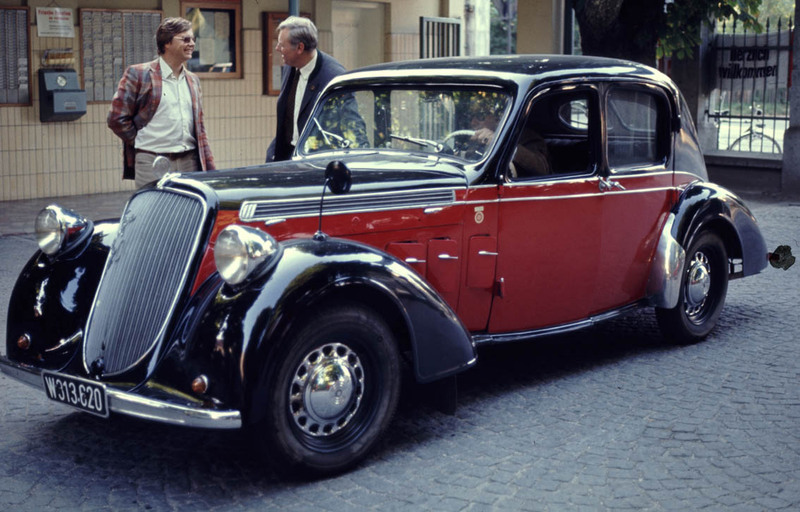 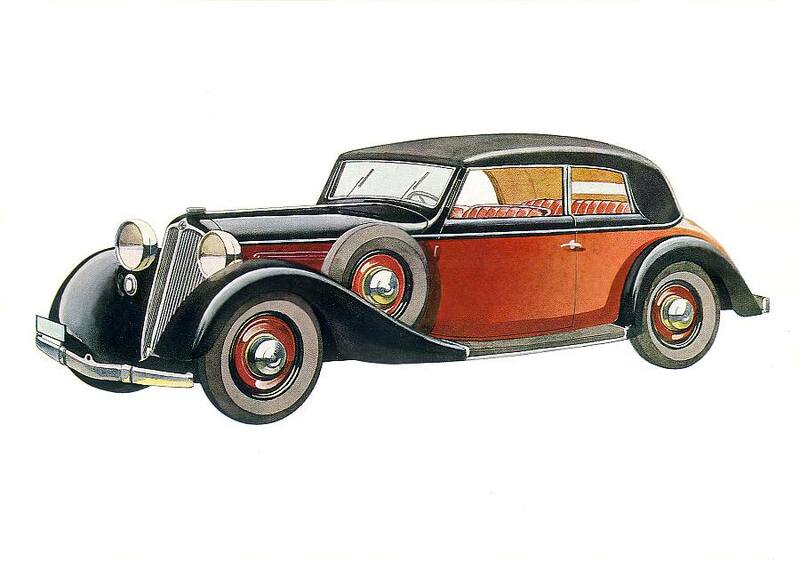 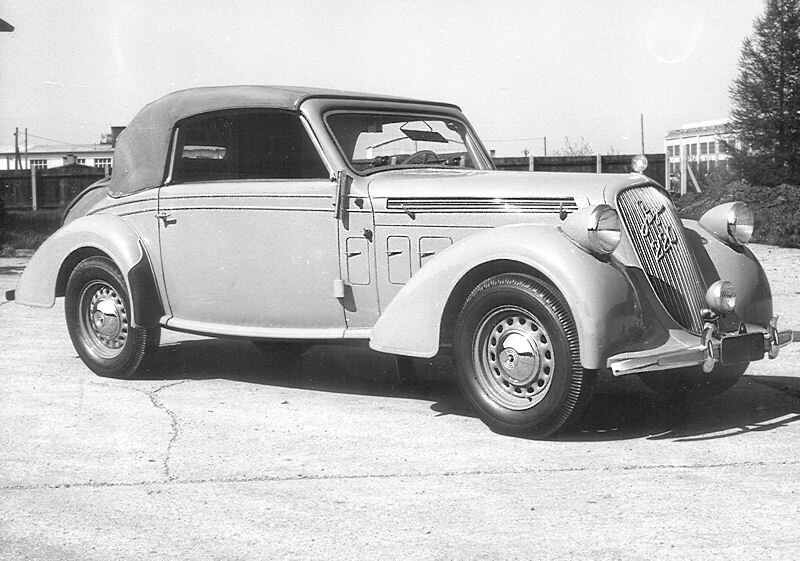 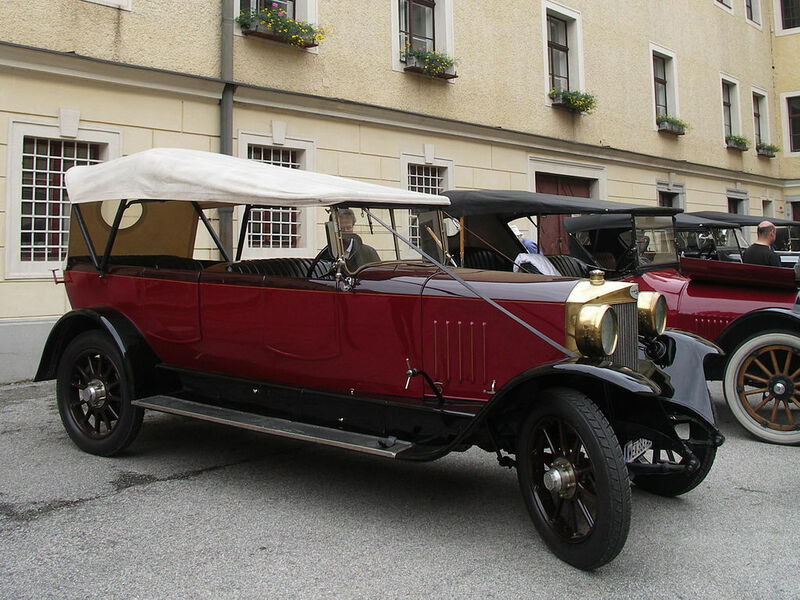 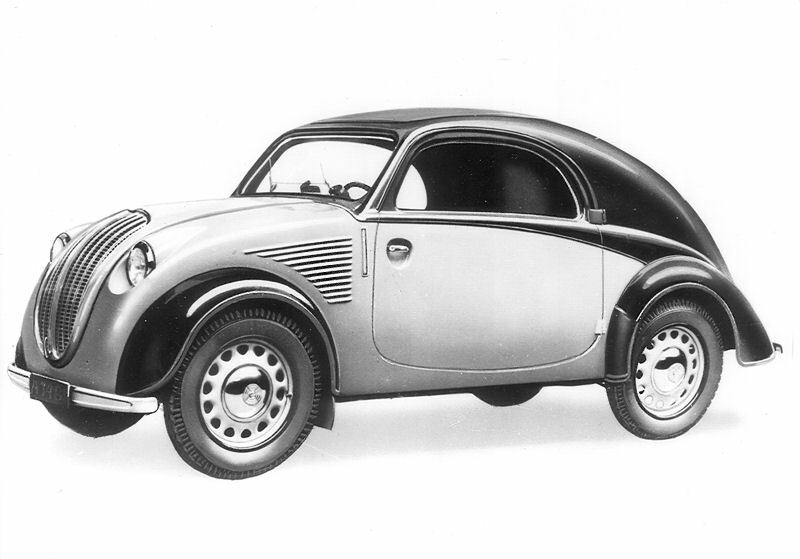 In 1934, Steyr merged with Austro-Daimler–Puch to form Steyr-Daimler-Puch. 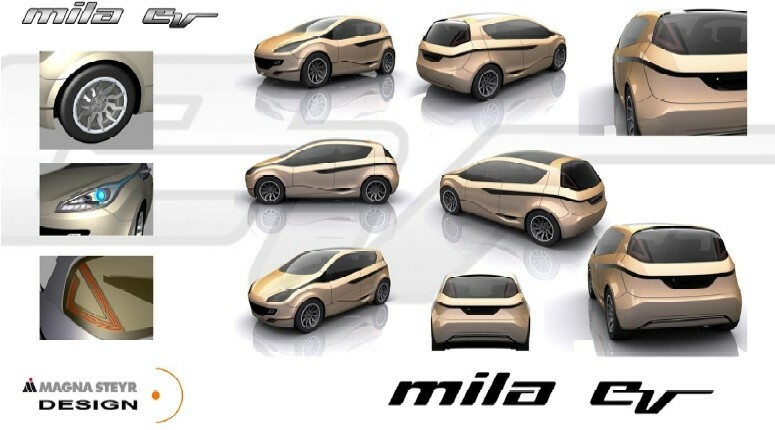 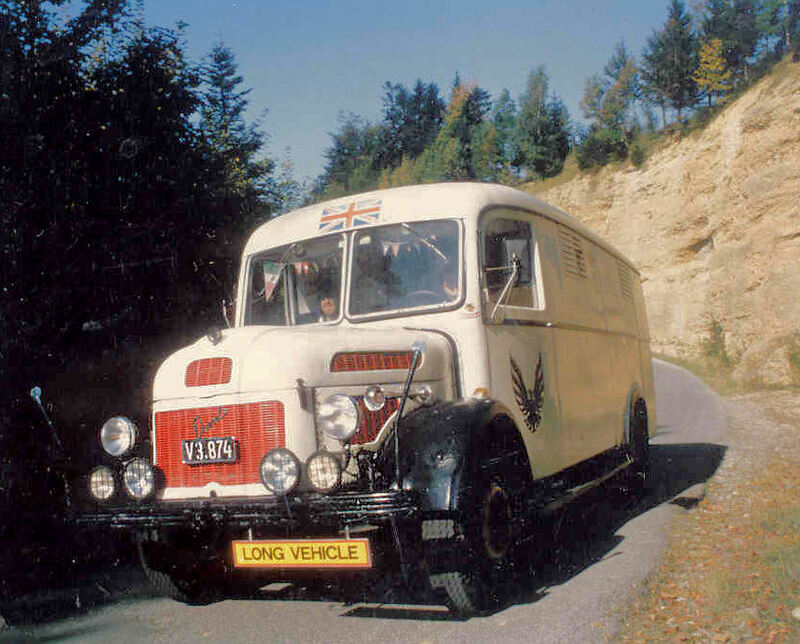 The range produced in these years mainly consisted of very modern designs, sporting partially or complete unit construction bodies in streamlined livery, from the one-litre Steyr 50 to the 2.3 L 220 “six”. 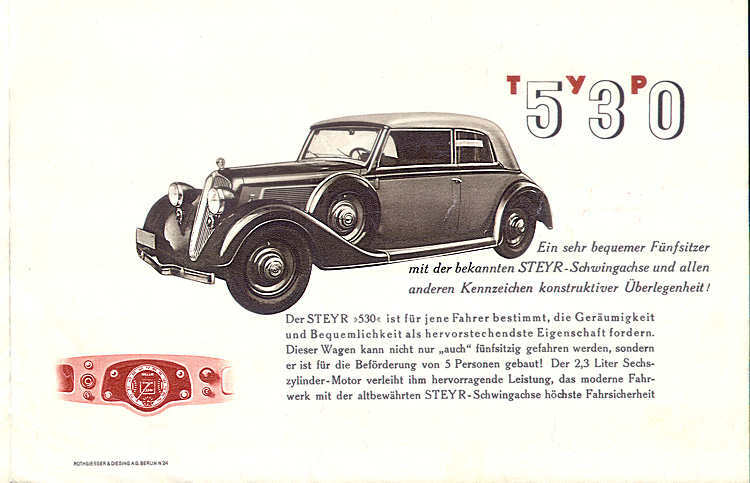 During World War II, when Austria was part of the Third Reich, Steyr-Daimler-Puch’s Generaldirektor Georg Meindl became one of the first German industrialists to suggest the use of slave labour from concentration camps to boost manpower at Steyr. 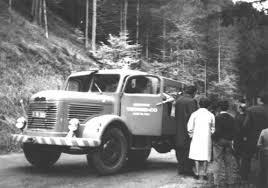 The request was approved and prisoners were brought by guarded train from the Mauthausen-Gusen camp complex at Gusen 30 km distant. 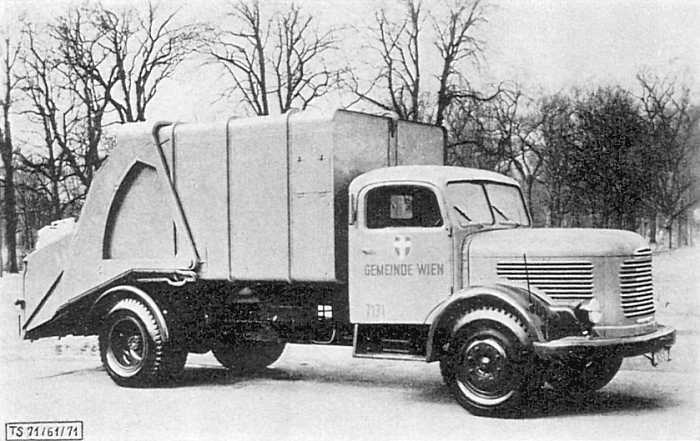 Later, on 5 January 1942 Meindl wrote a letter to SS Gruppenfürhrer Ernst Kaltenbrunner recommending a new ‘satellite’ prison camp be constructed to house prisoners nearer the Steyr factory complex, explaining how this would reduce the time and loss of prisoners in transit to and from work while also reducing security and transport overhead costs. 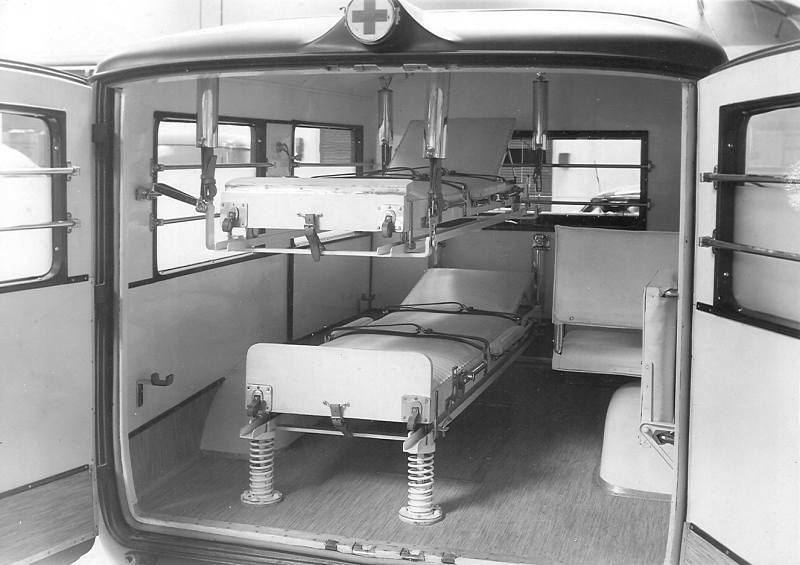 This was approved and prisoners were used for facilities construction (bomb shelters, etc. 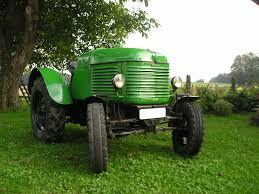 ), and to supplant manufacturing labor. 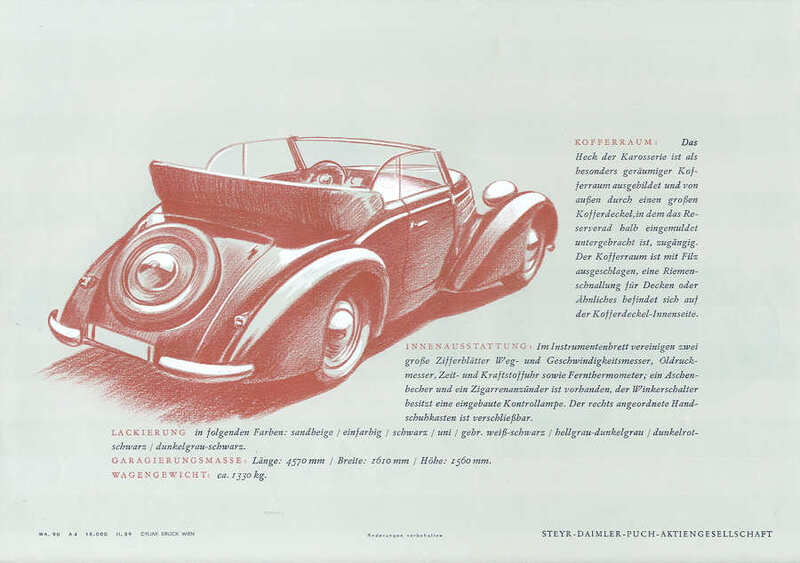 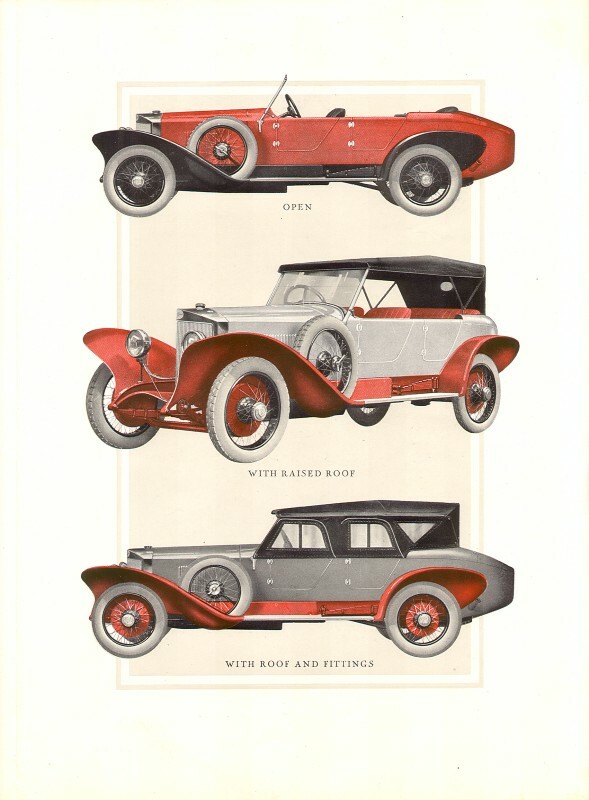 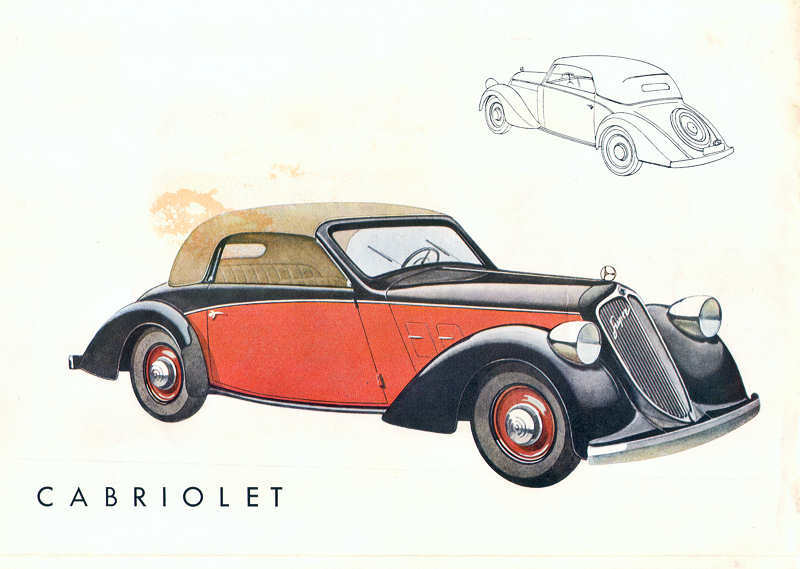 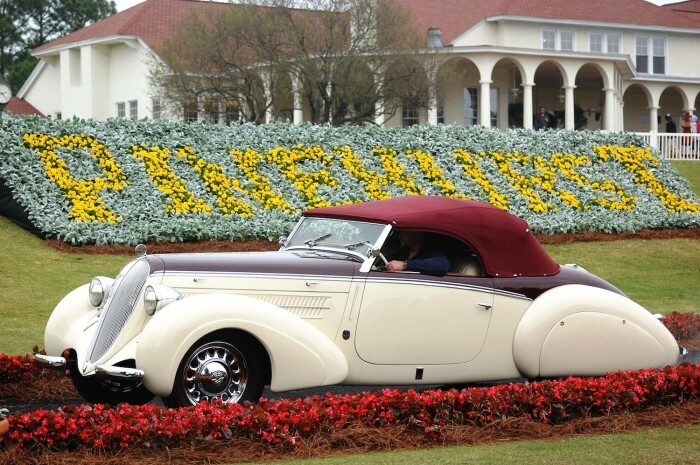 This practice heretofore was not common at other larger German companies, though others followed suit including Mercedes-Benz and MAN. 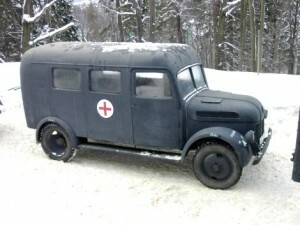 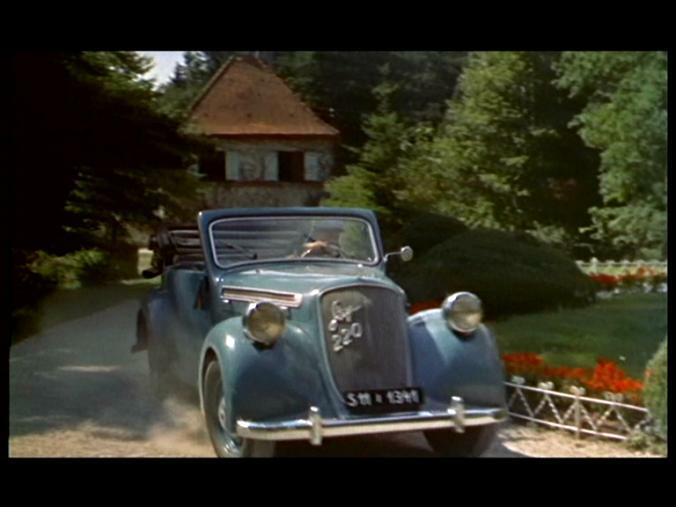 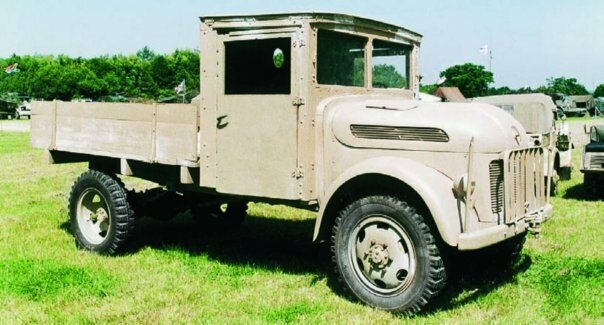 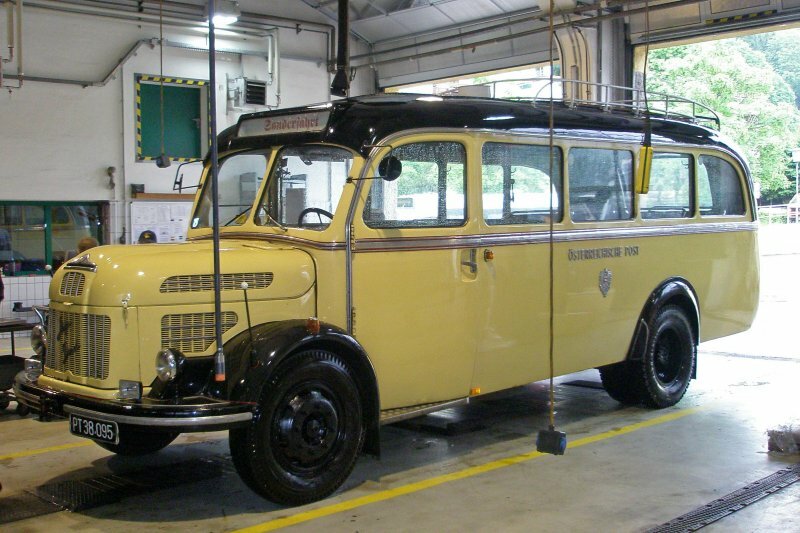 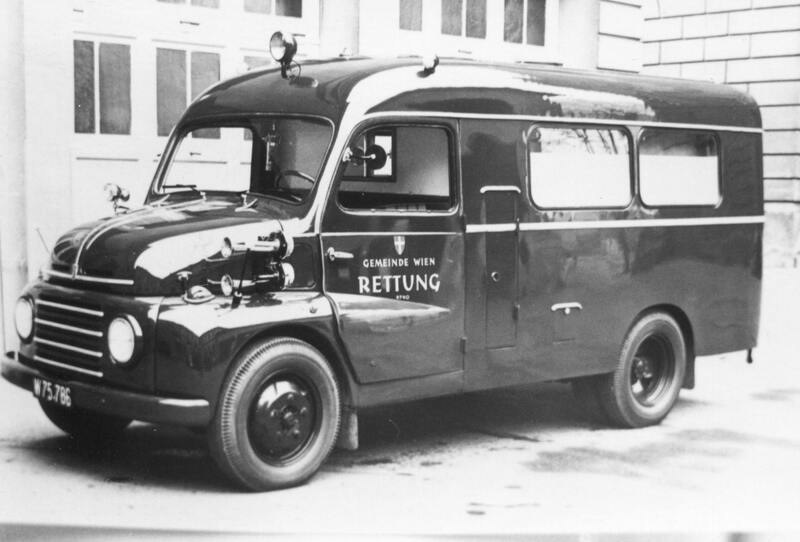 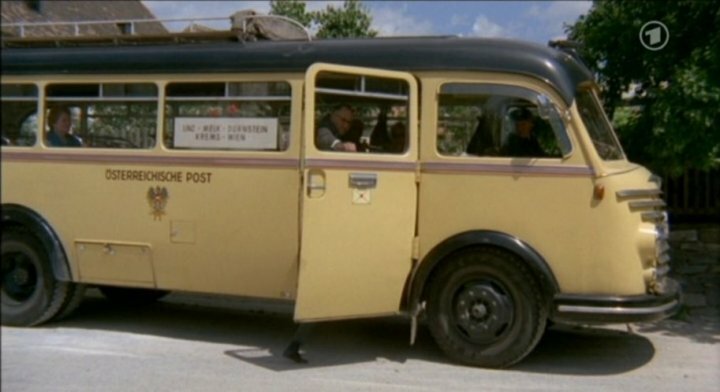 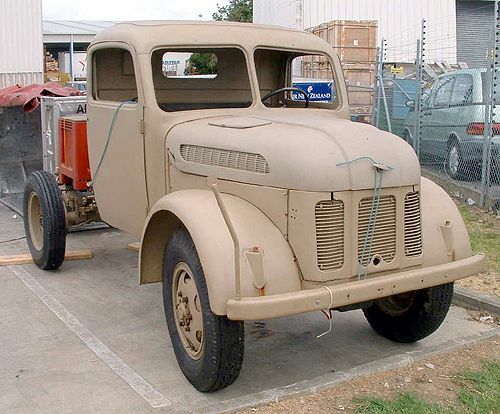 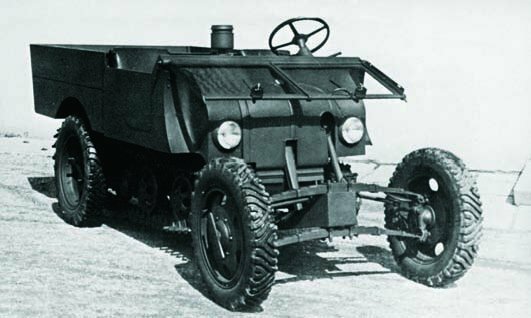 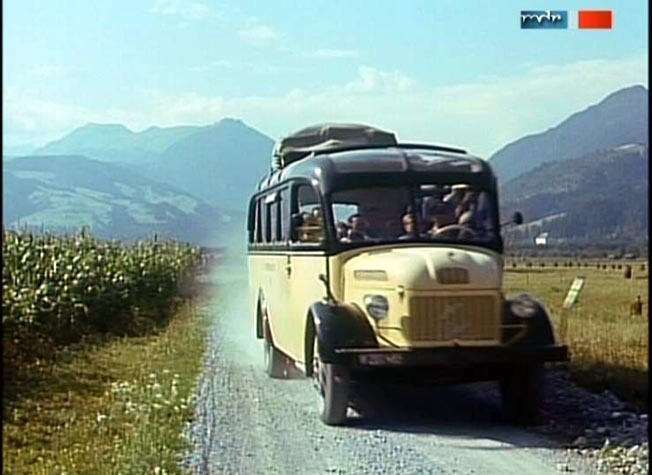 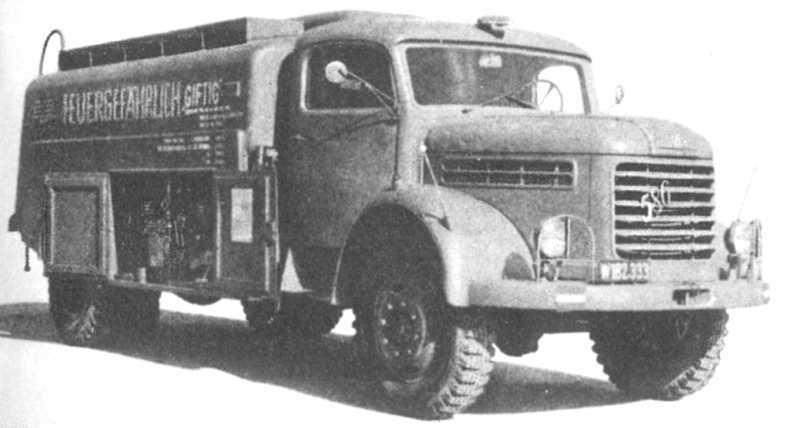 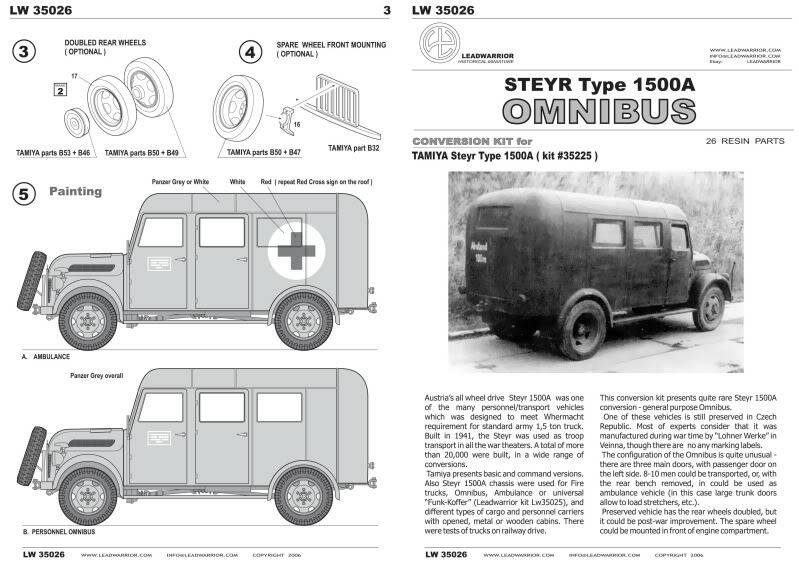 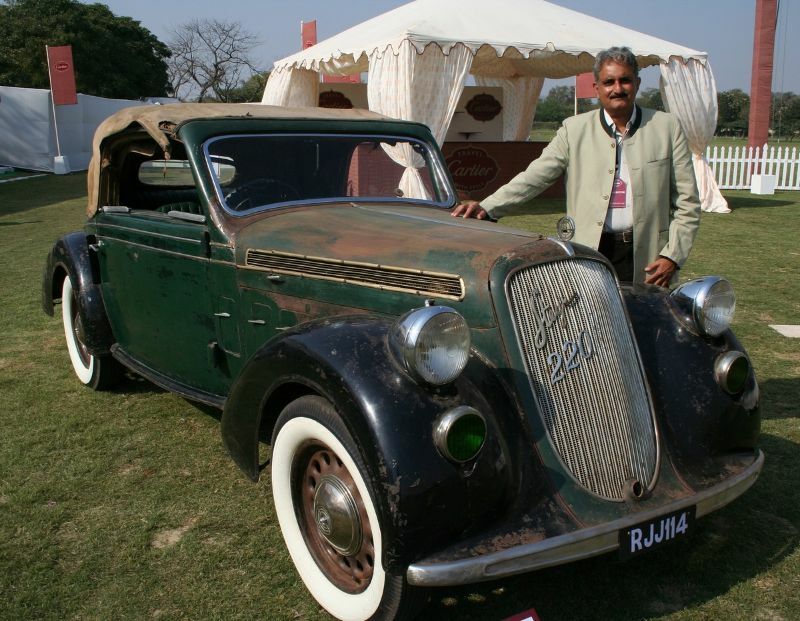 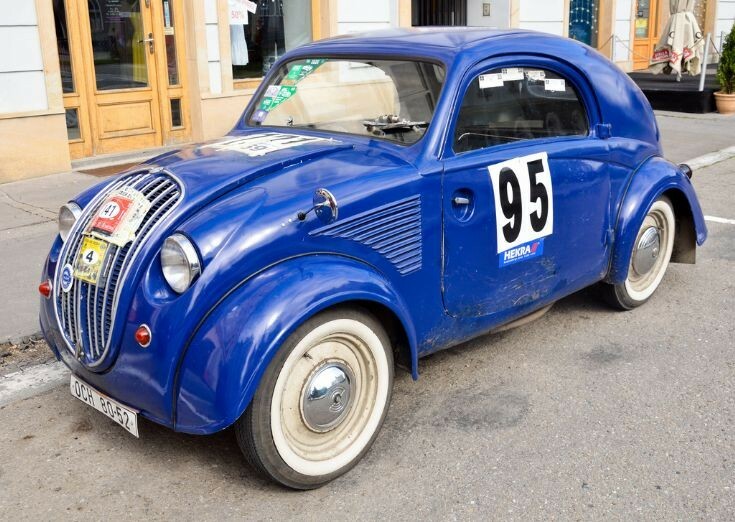 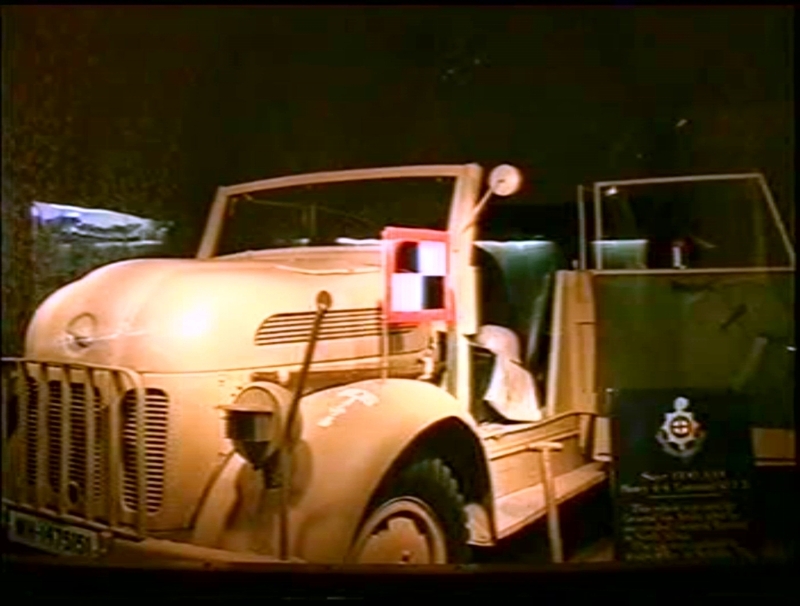 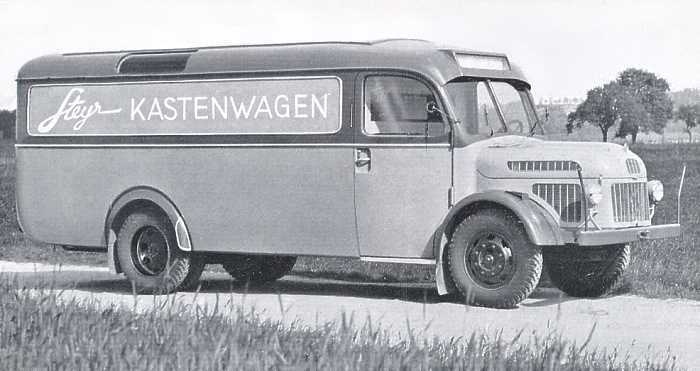 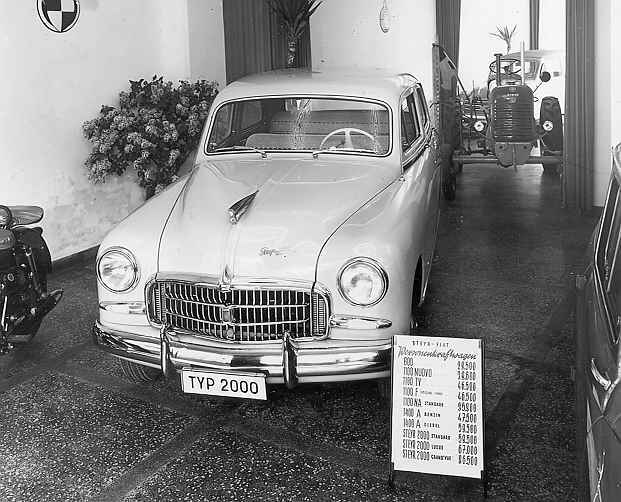 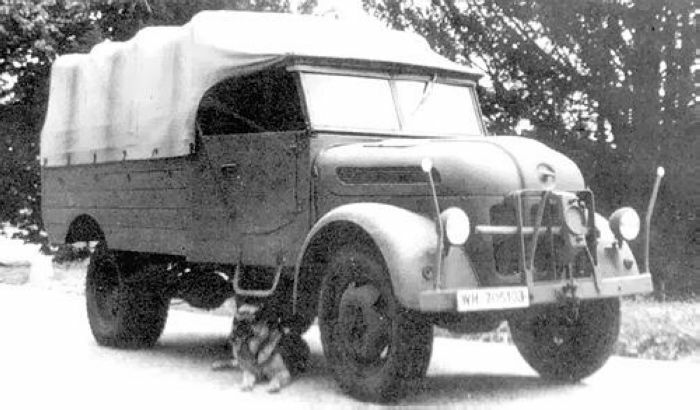 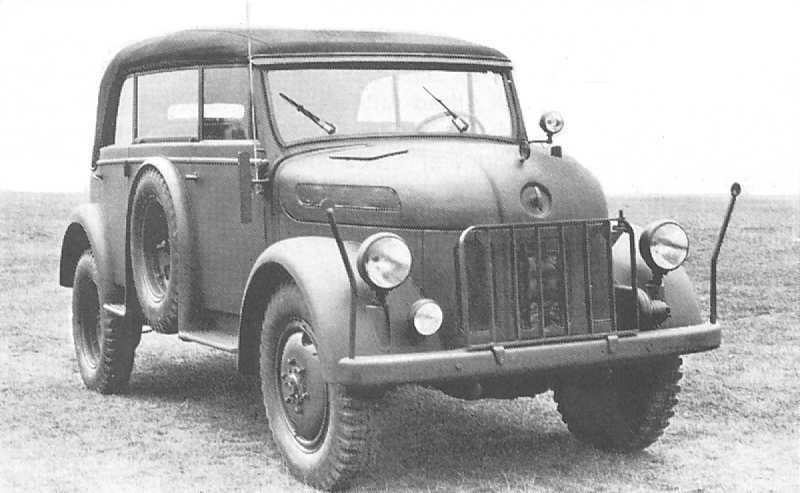 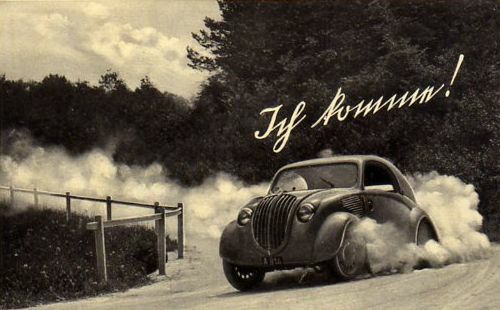 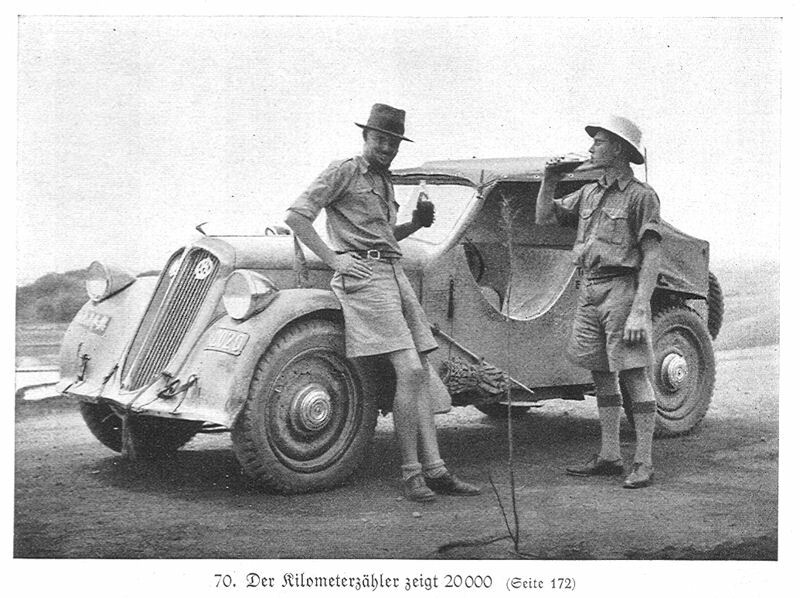 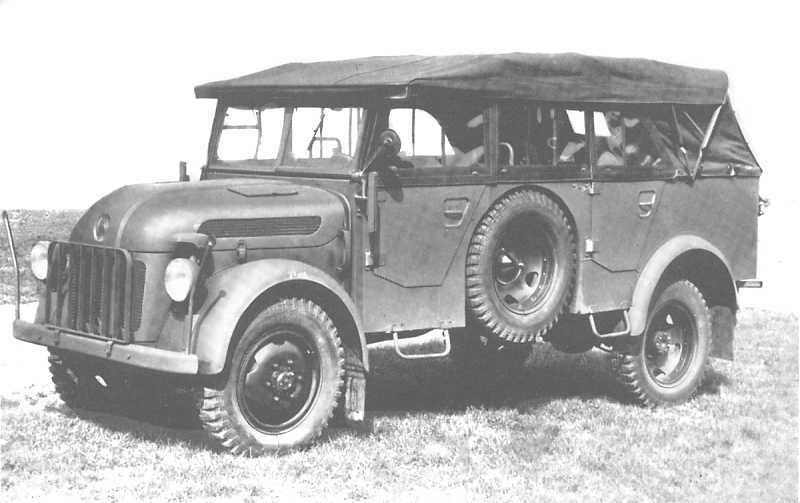 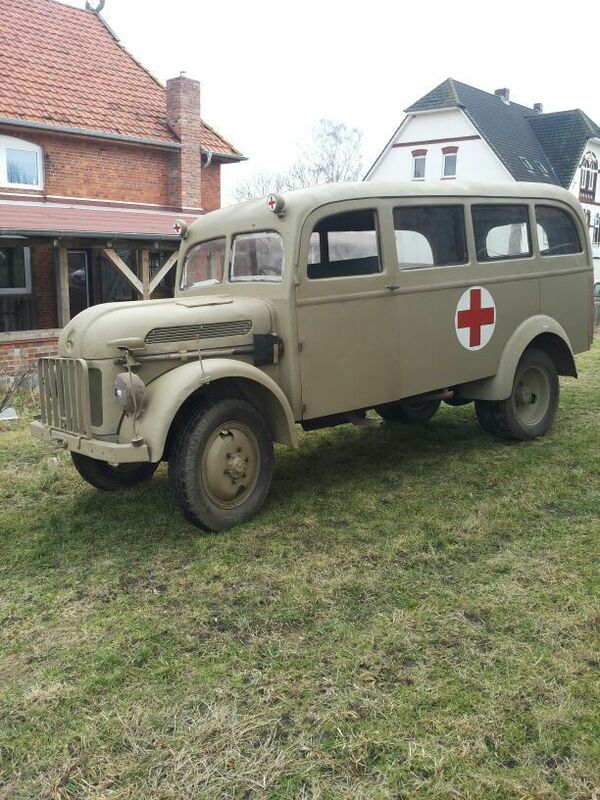 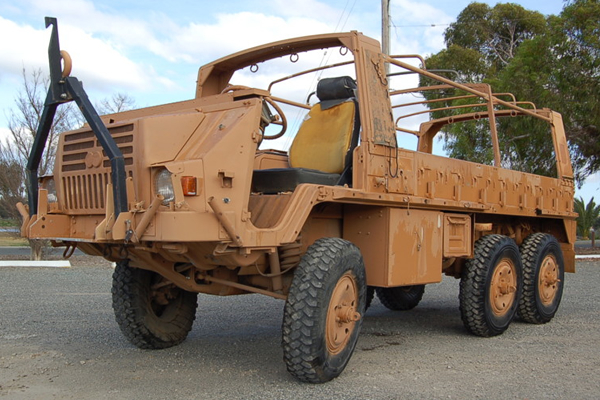 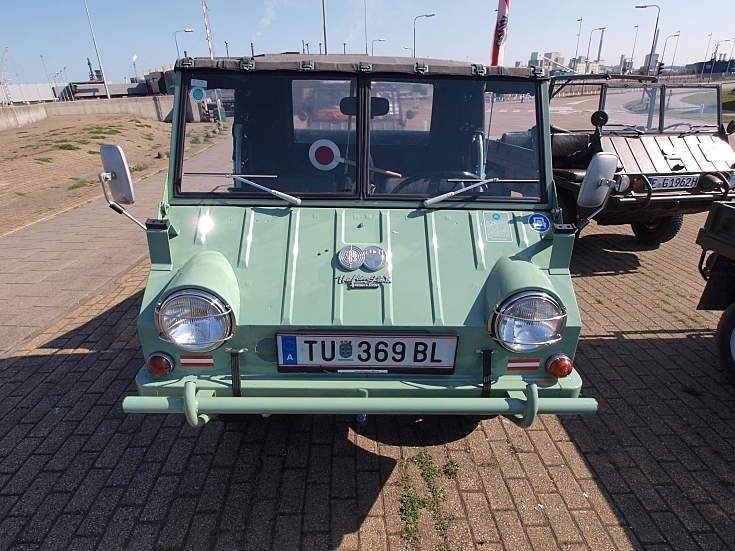 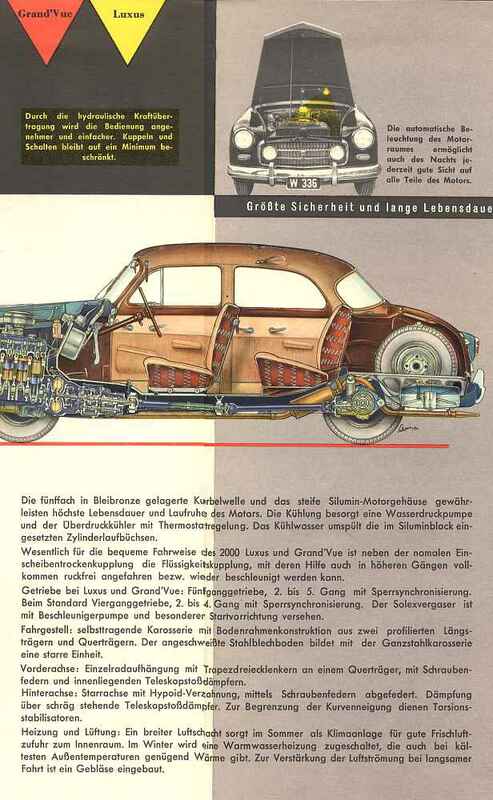 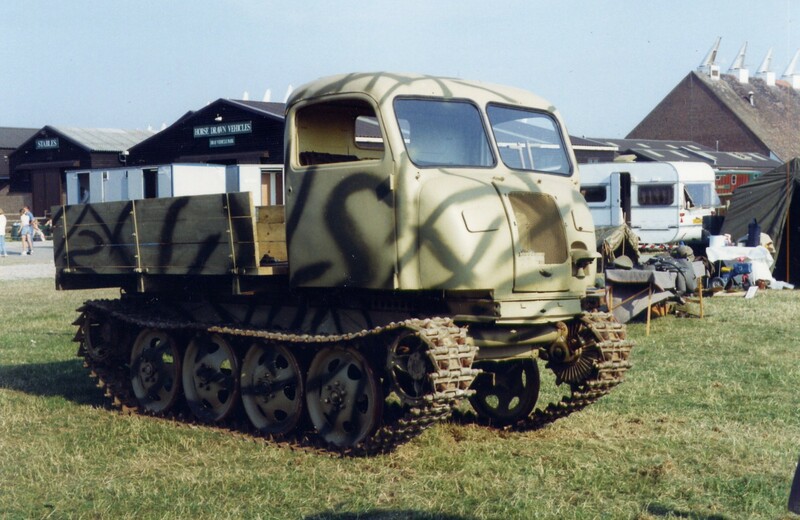 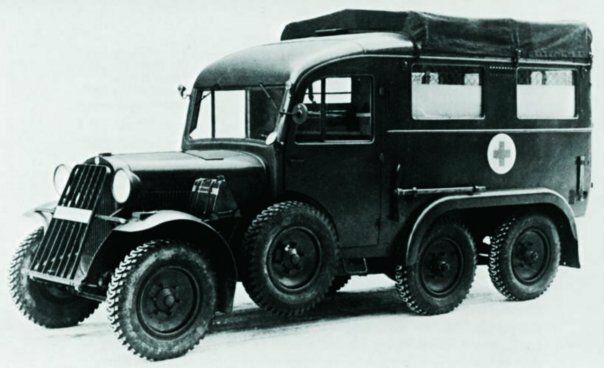 The vehicle range was for military use, including the Steyr RSO Raupenschlepper Ost with an air-cooled 3.5 L V8 engine designed by Ferdinand Porsche, who worked for the company at that time. 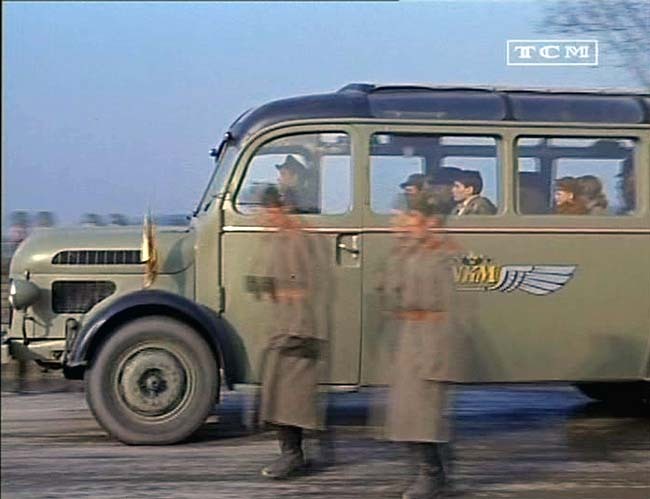 War-time production there also included small arms, assault rifles, machine guns, and aircraft engines. 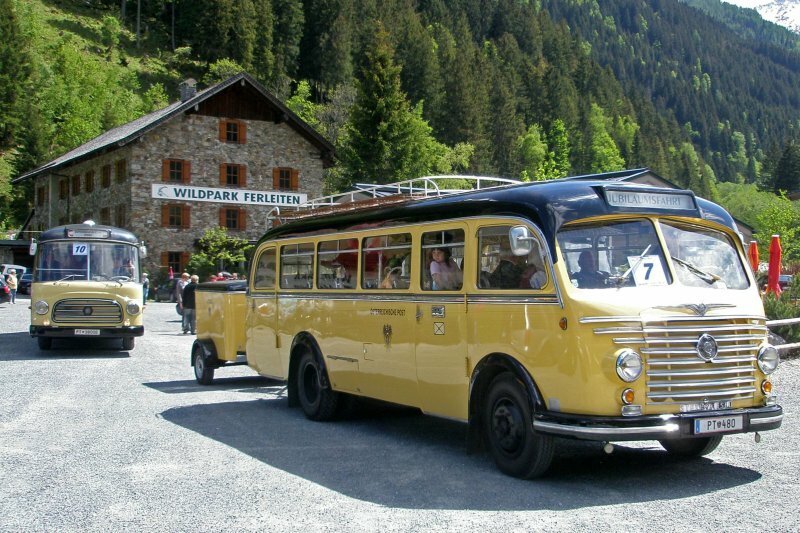 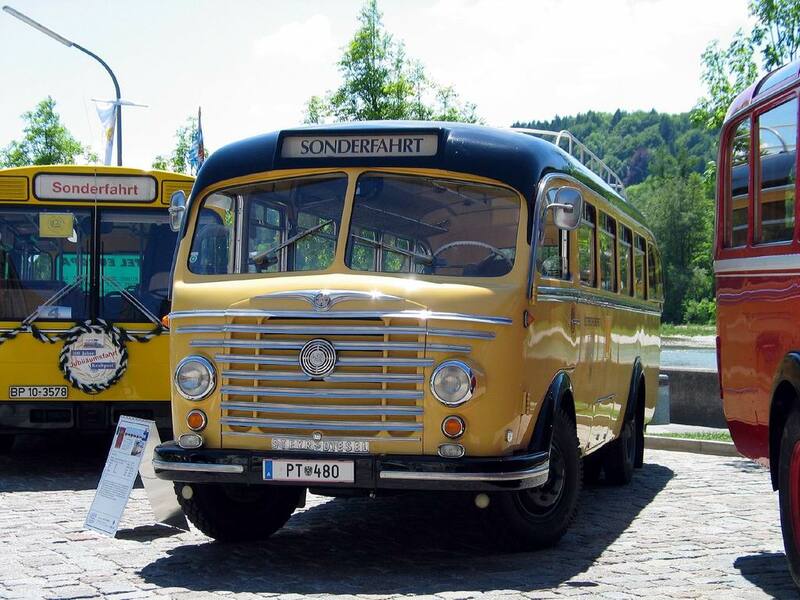 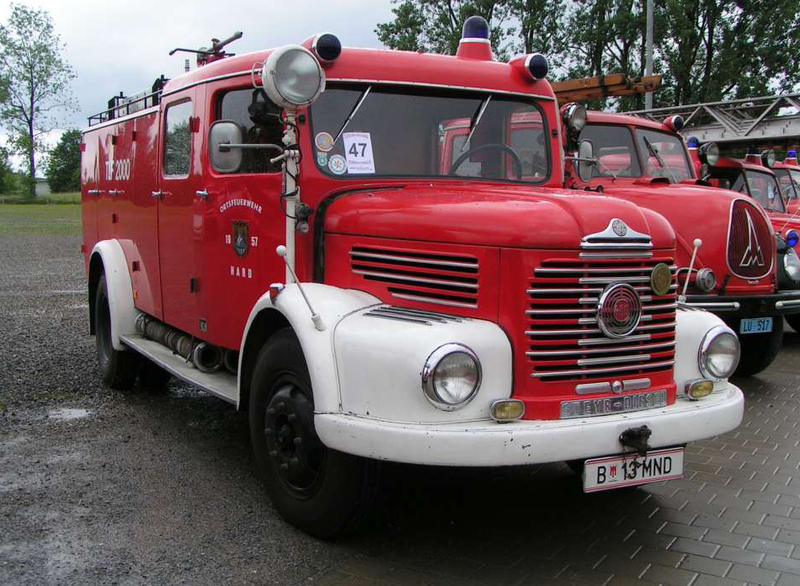 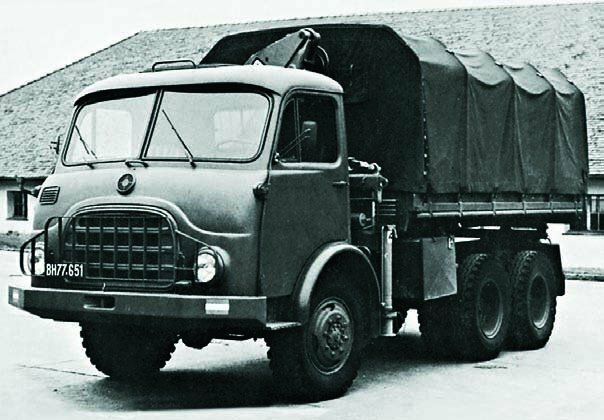 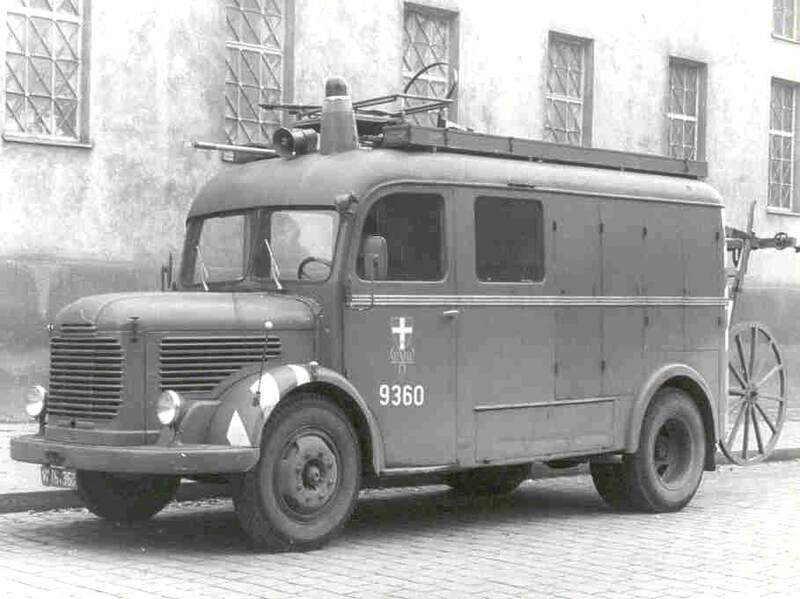 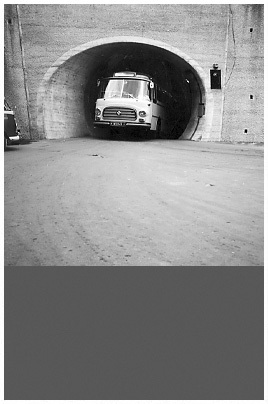 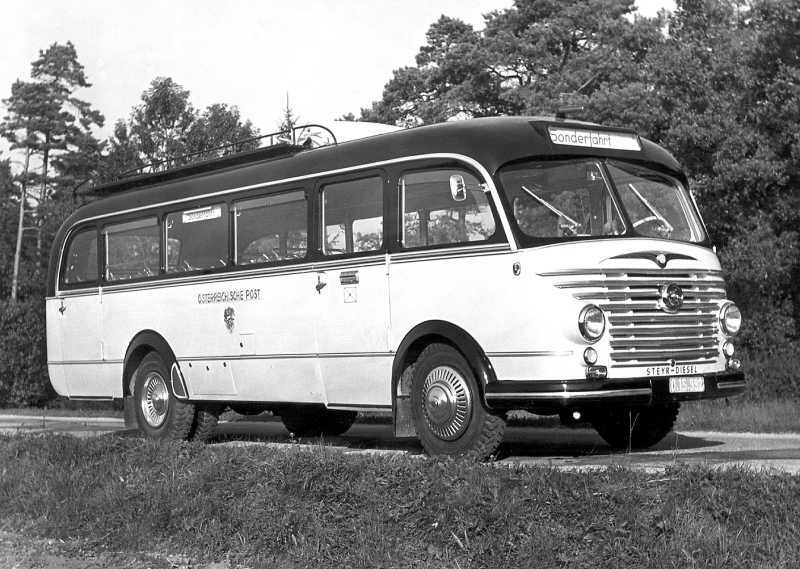 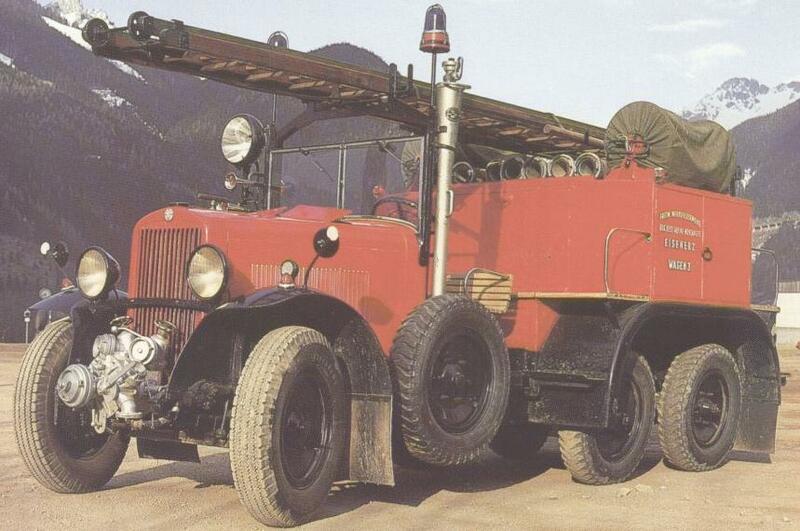 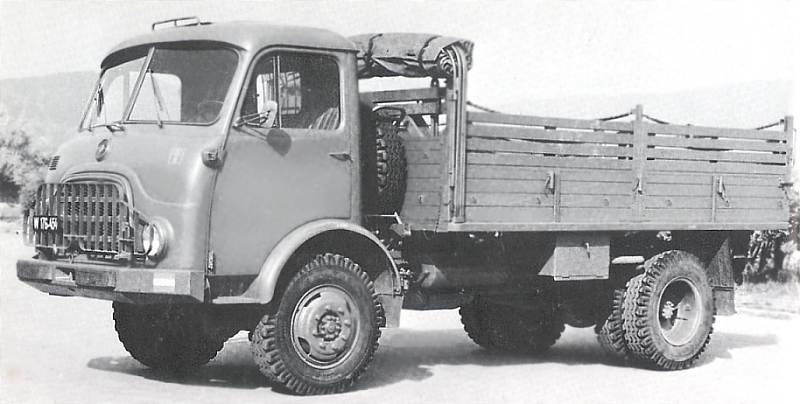 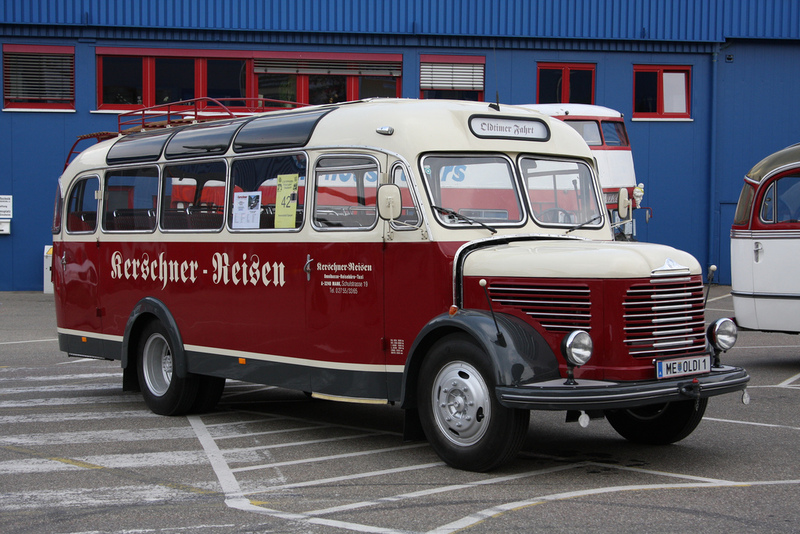 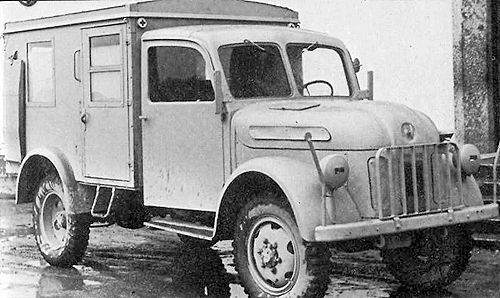 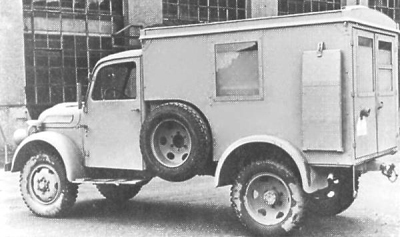 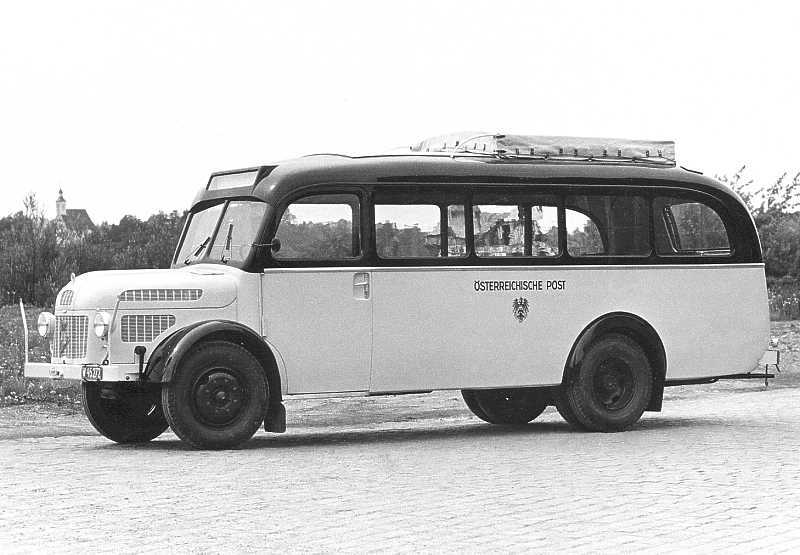 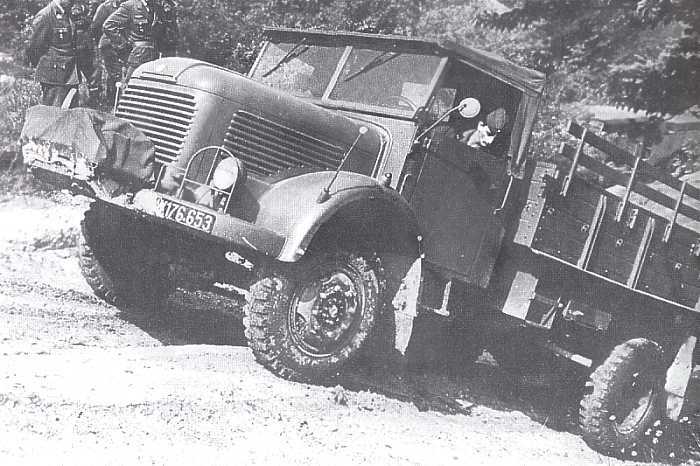 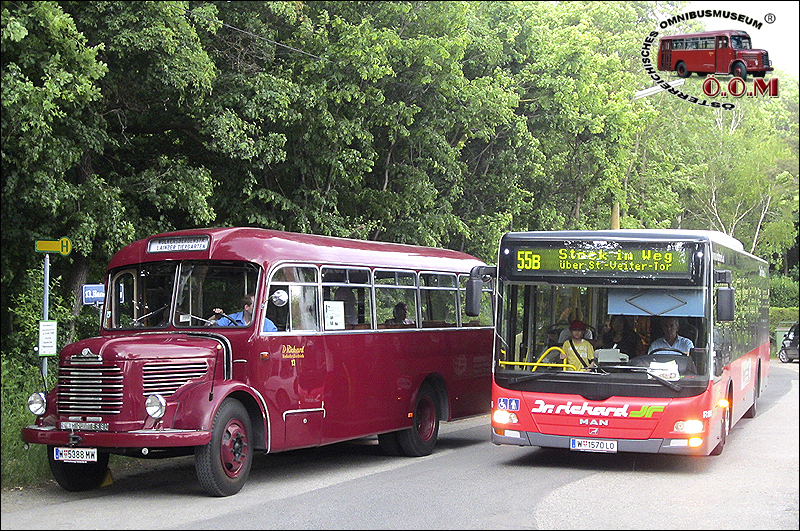 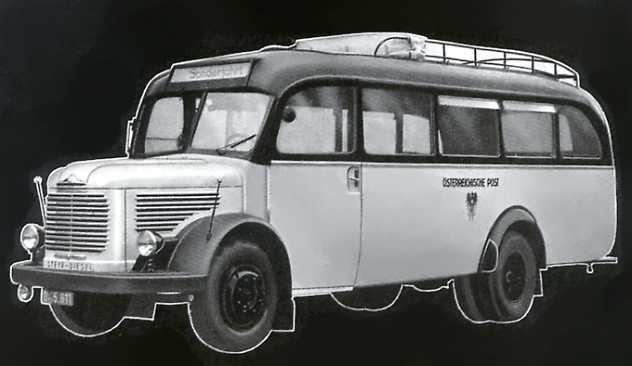 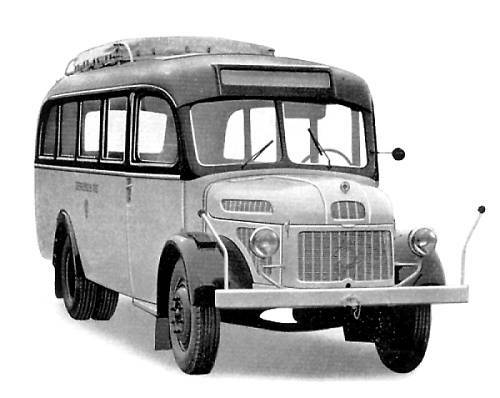 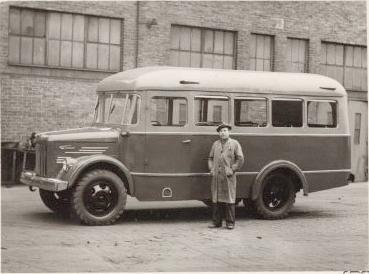 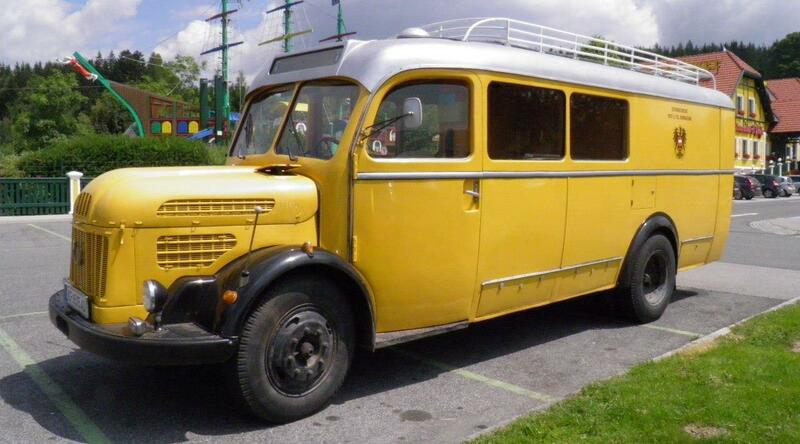 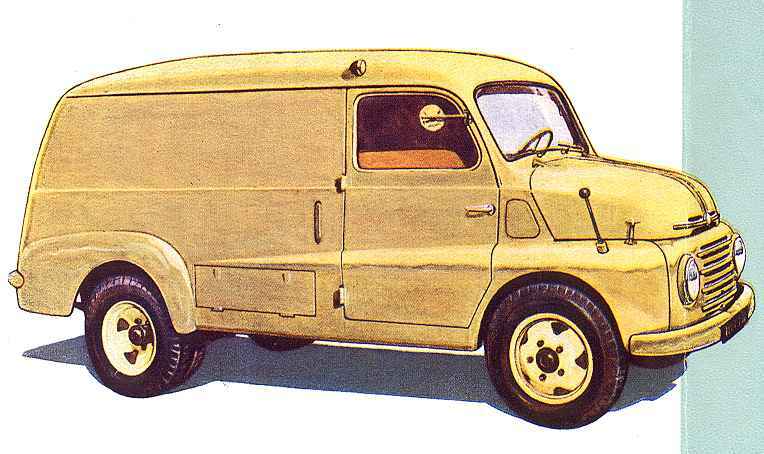 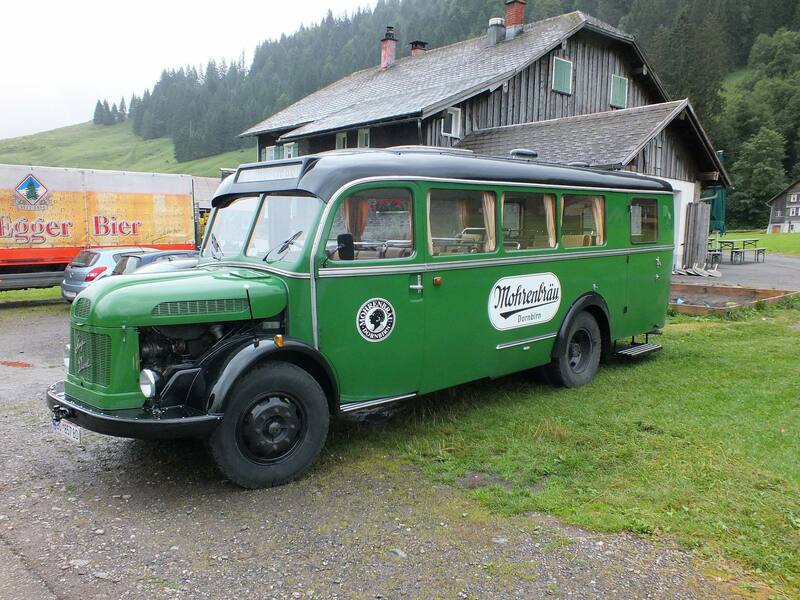 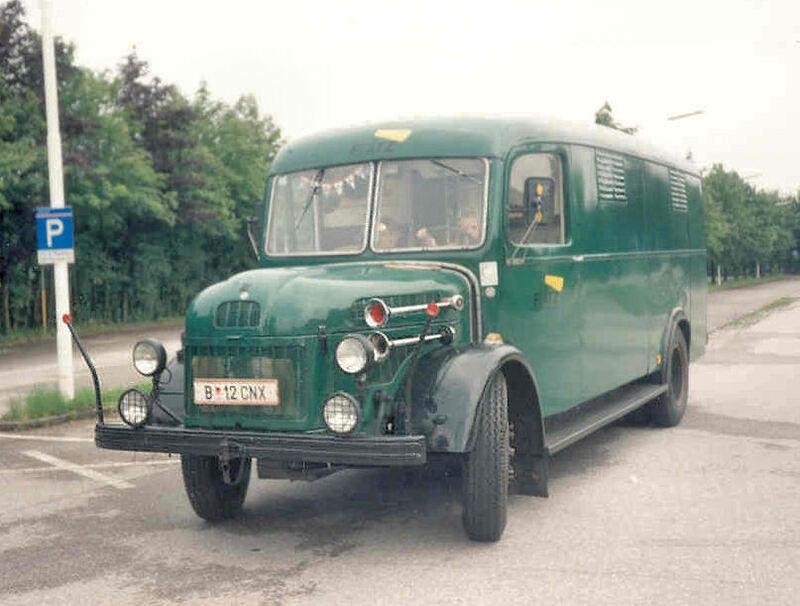 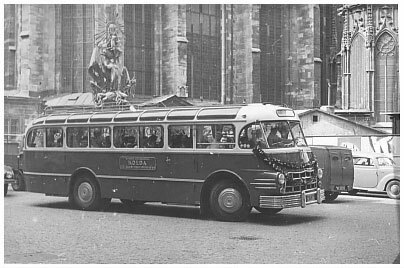 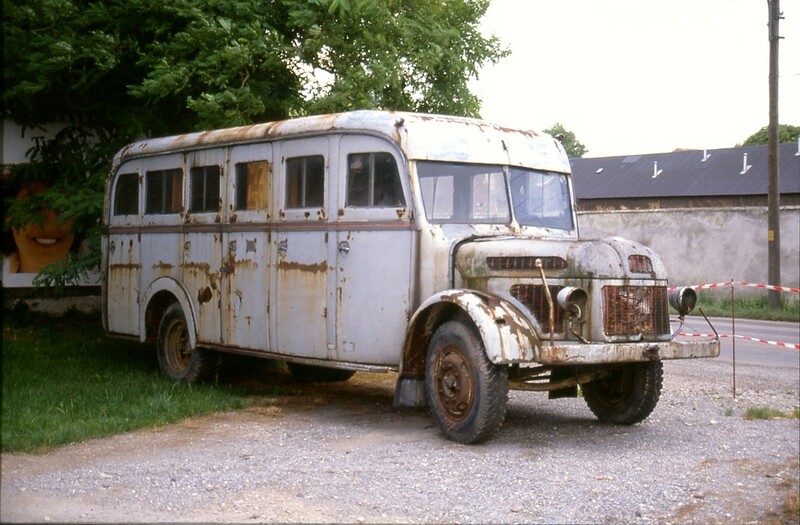 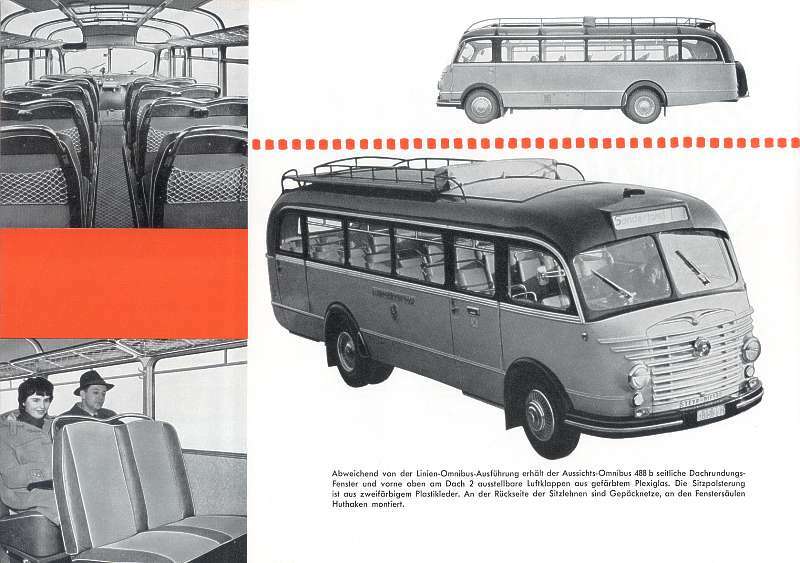 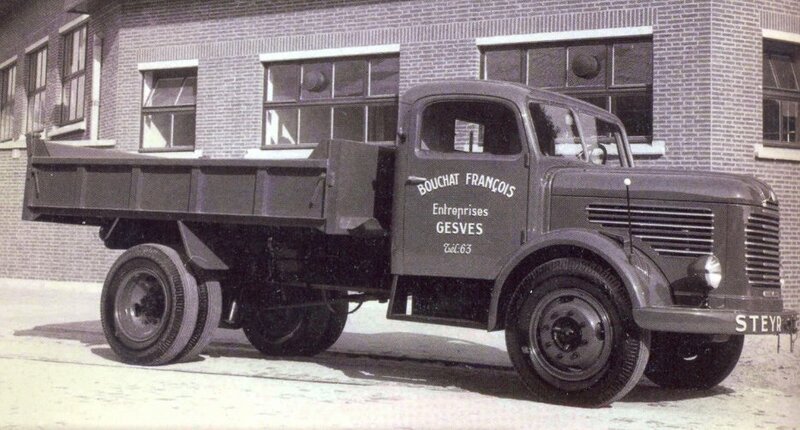 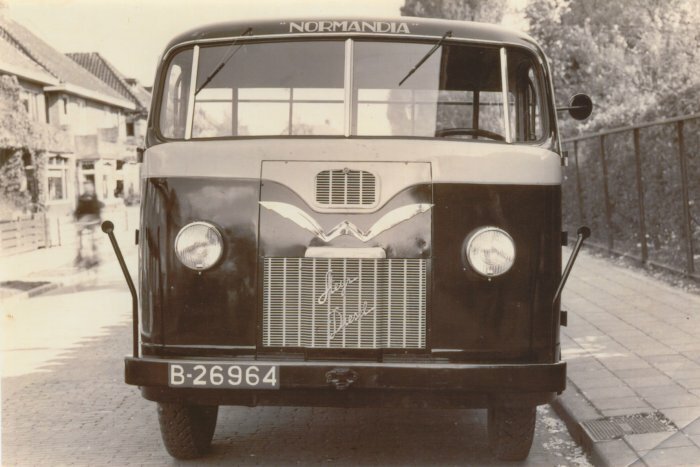 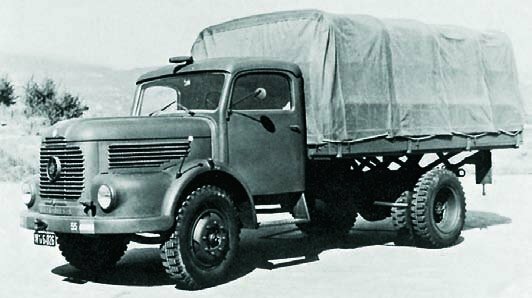 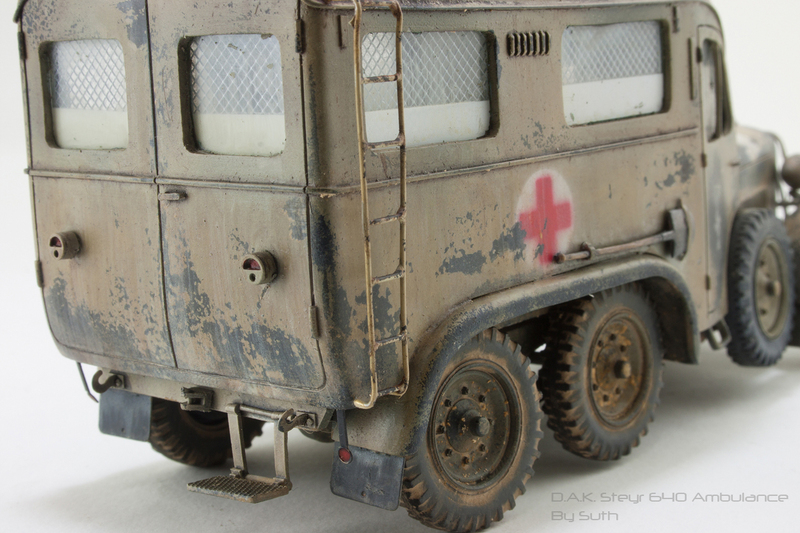 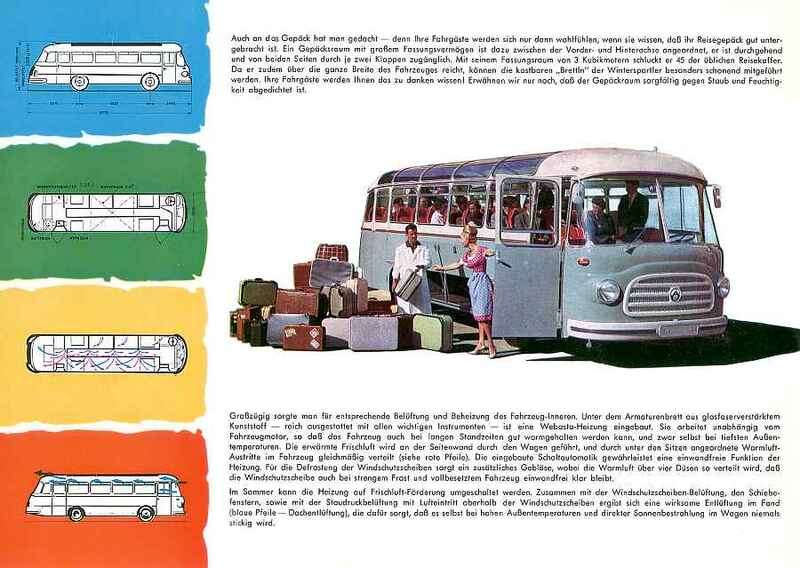 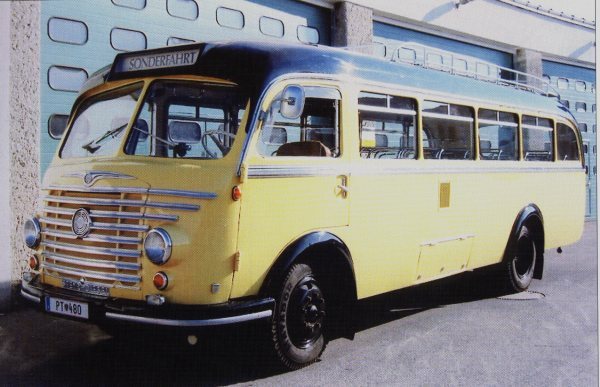 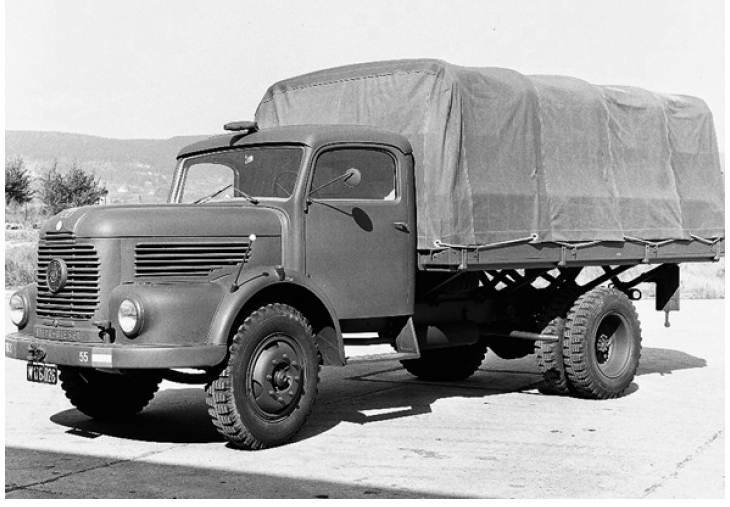 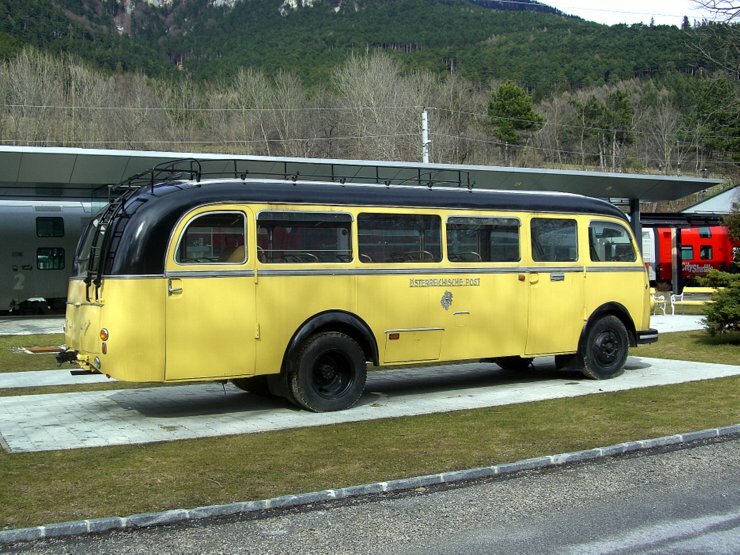 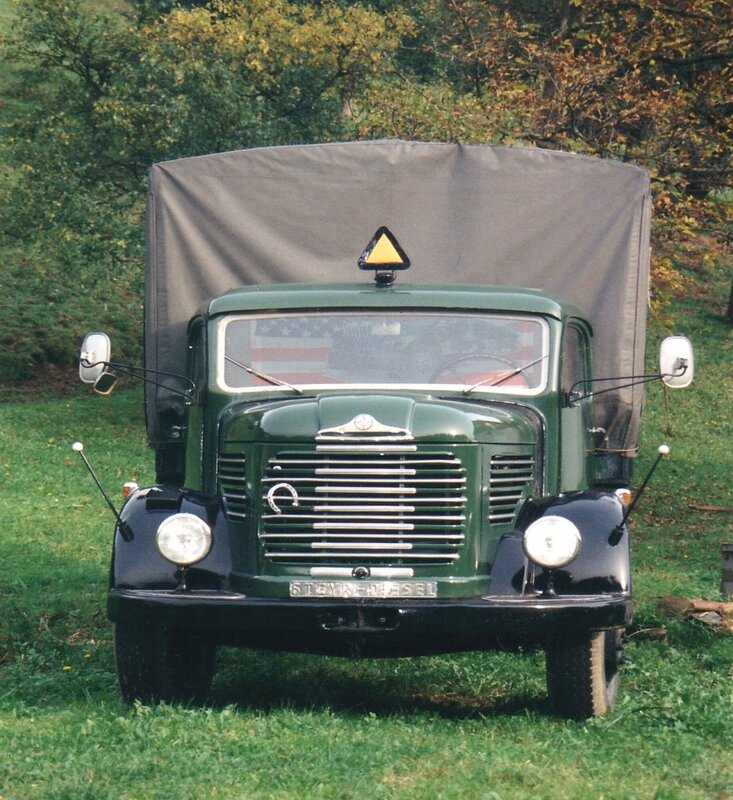 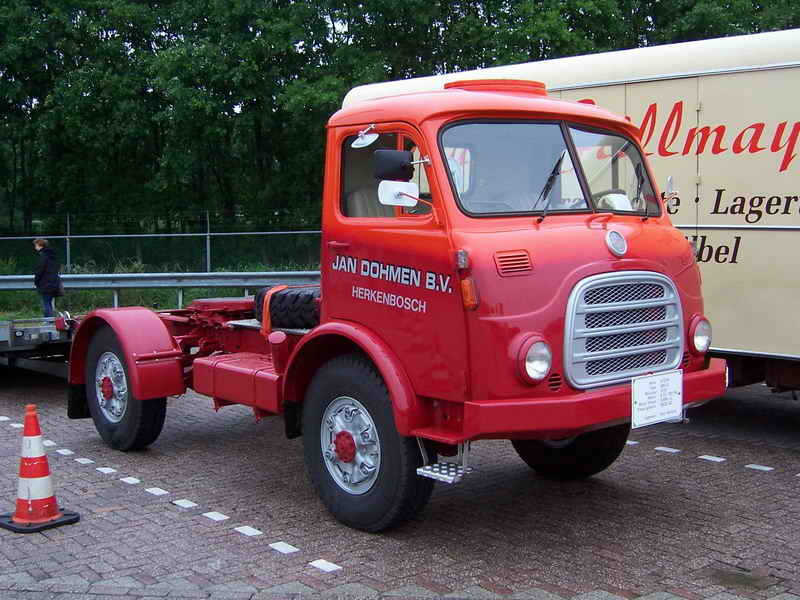 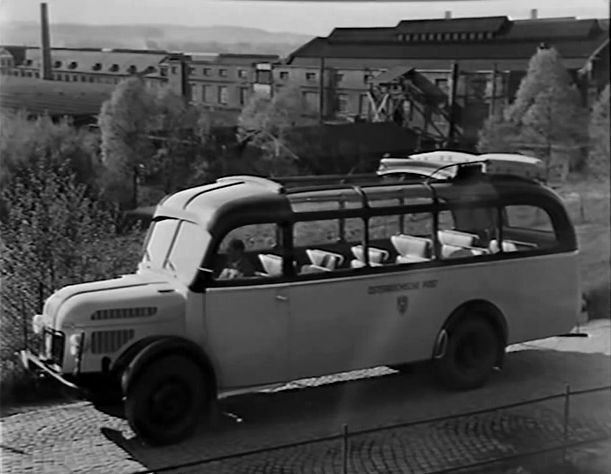 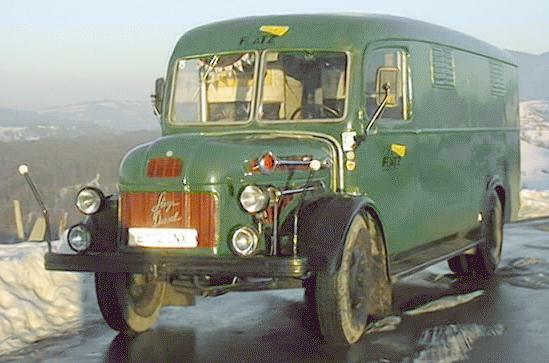 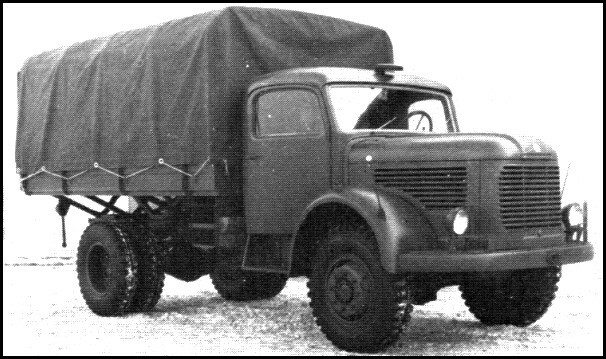 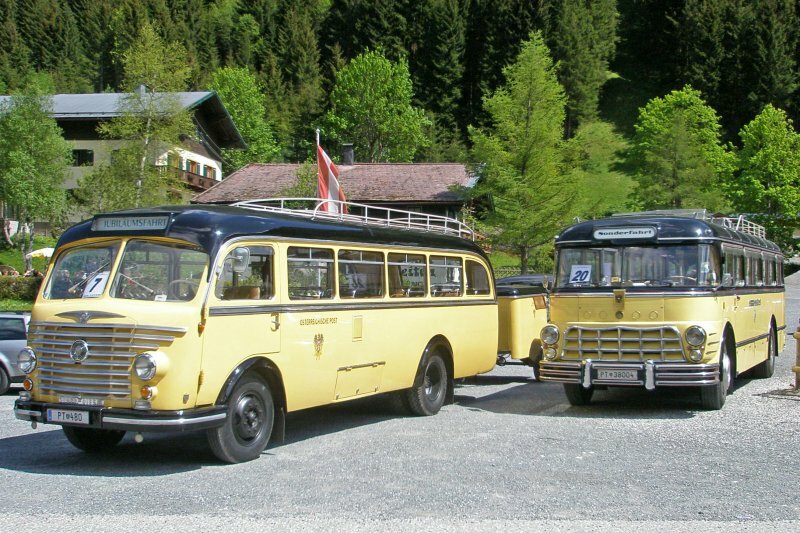 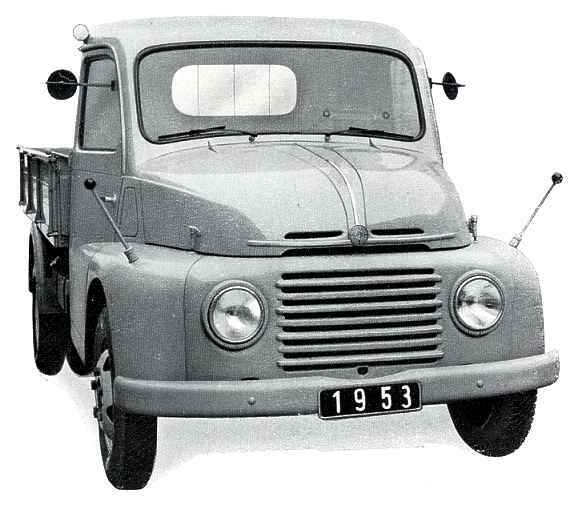 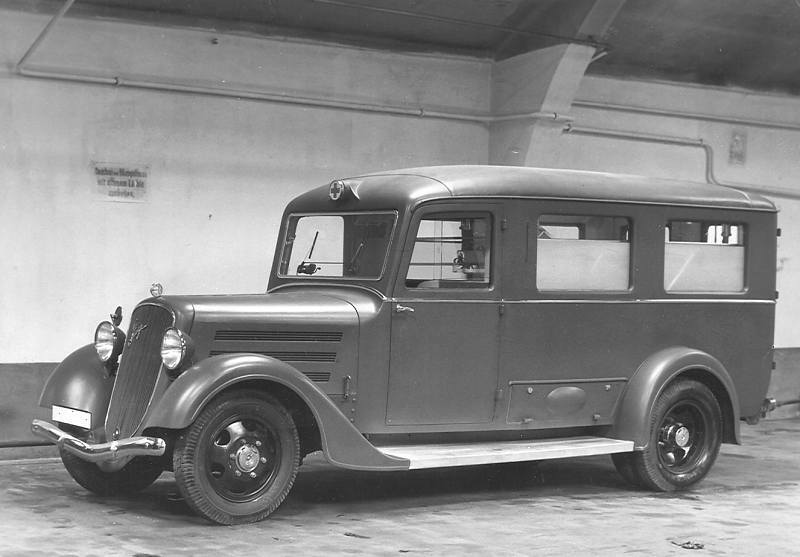 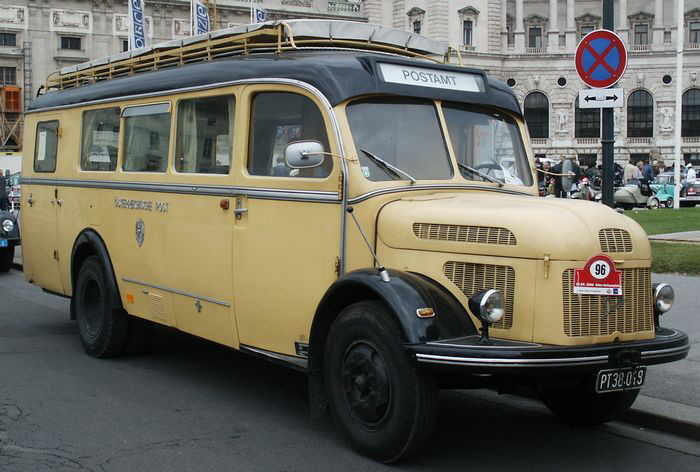 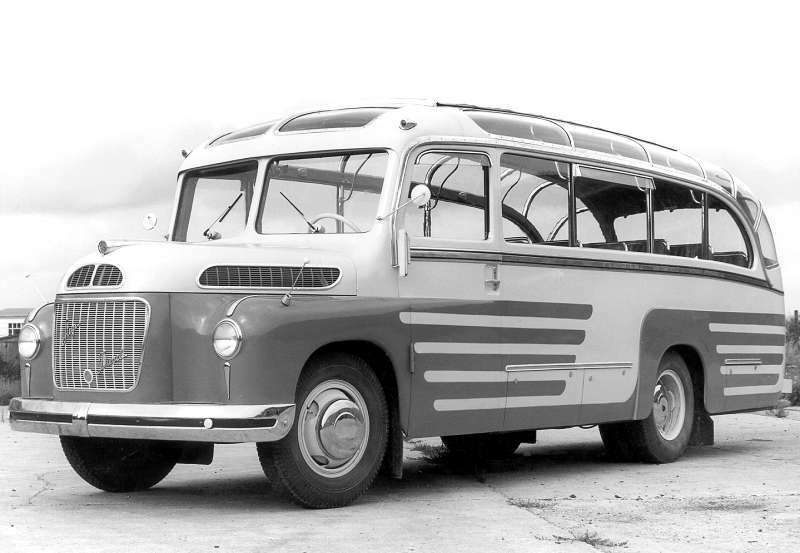 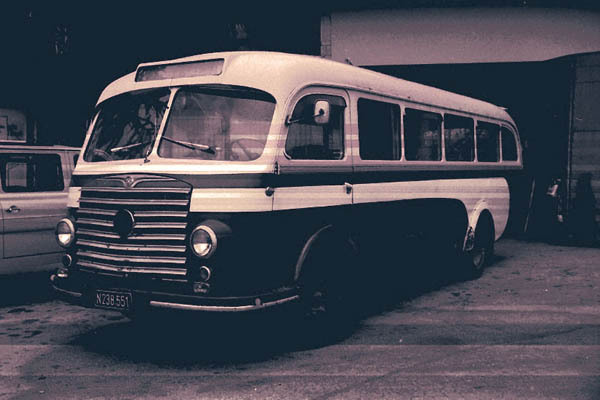 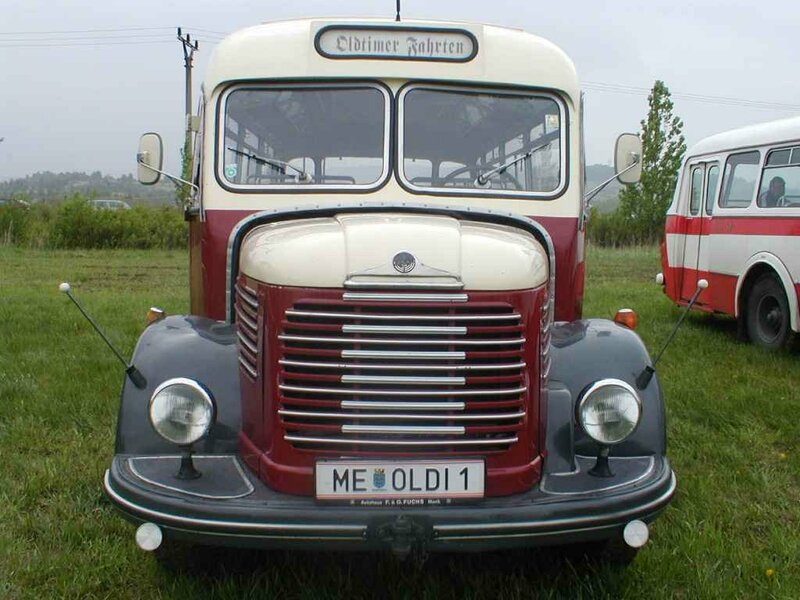 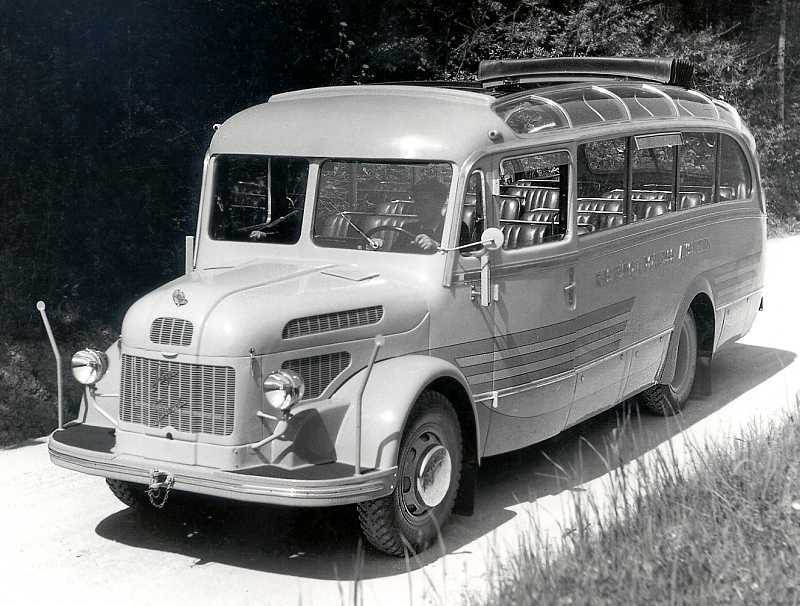 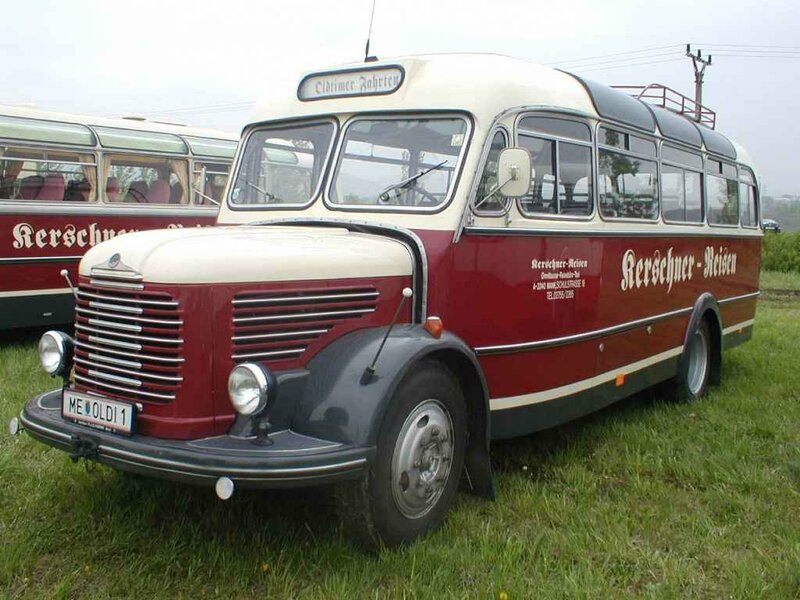 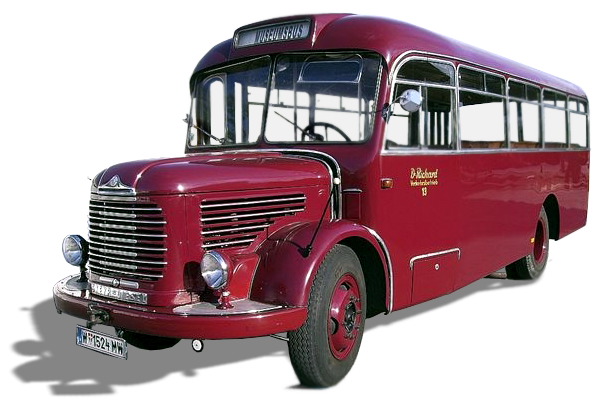 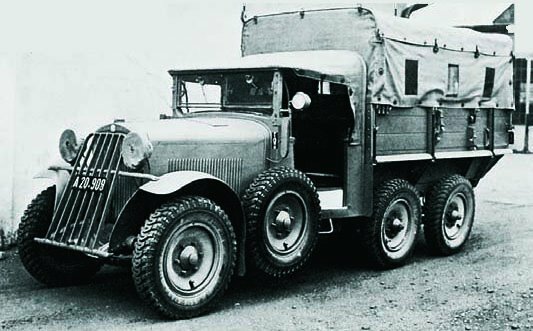 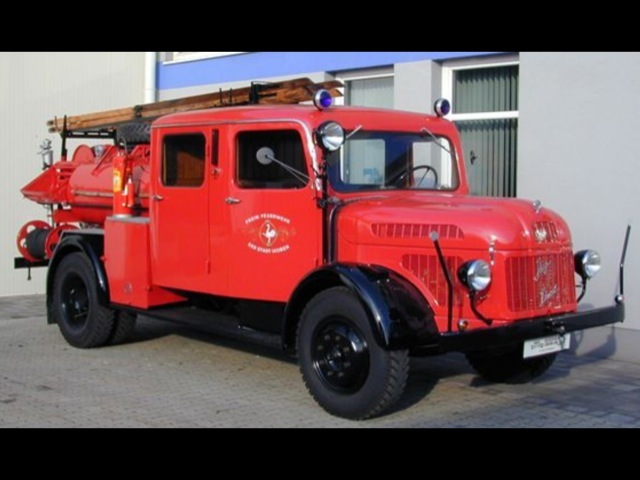 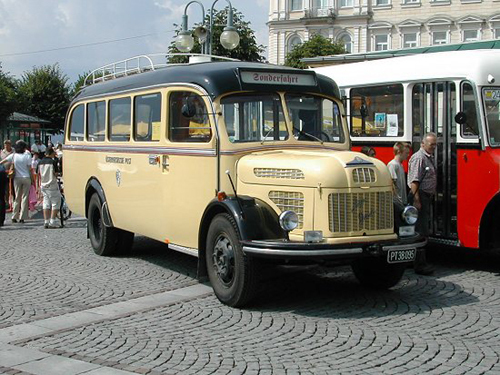 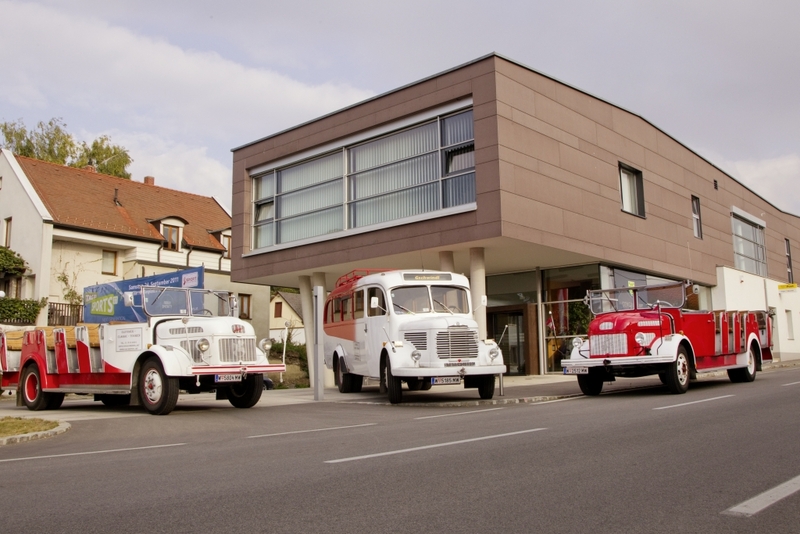 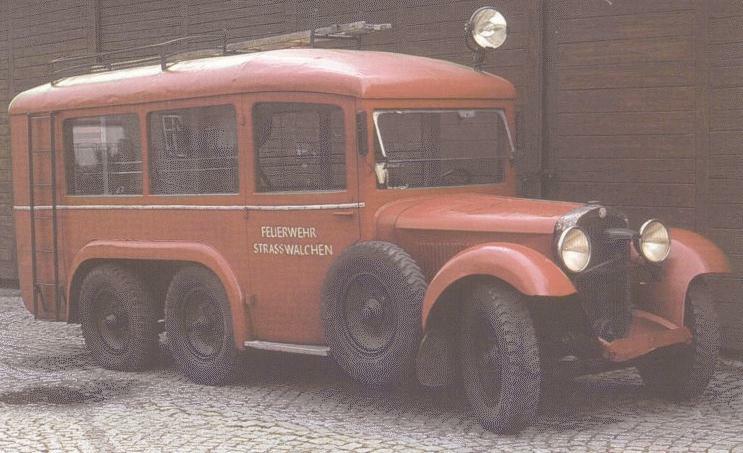 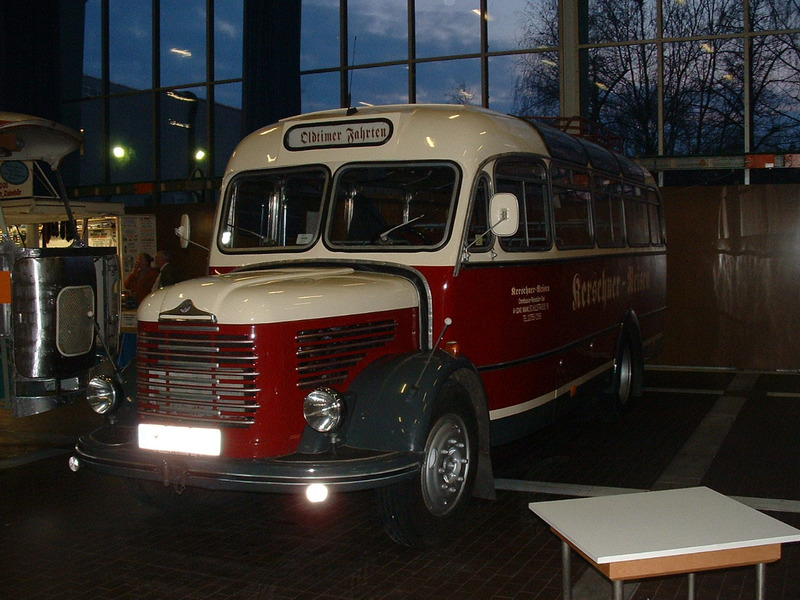 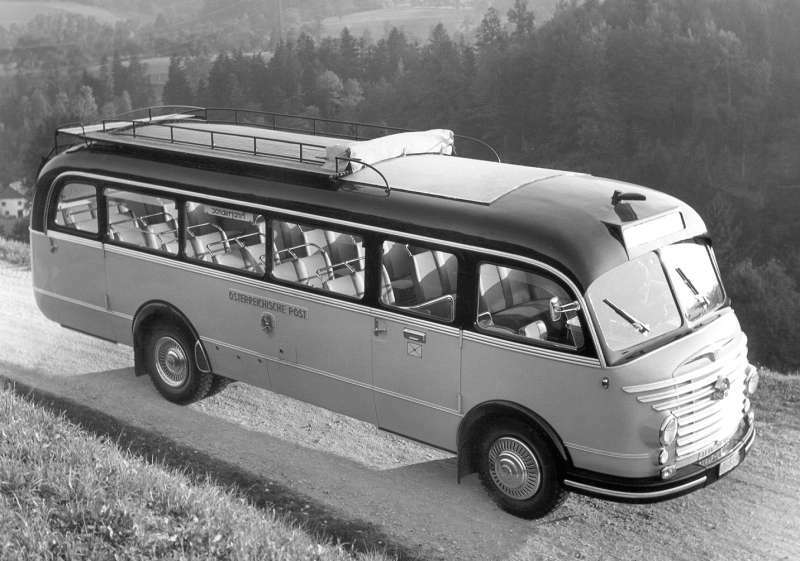 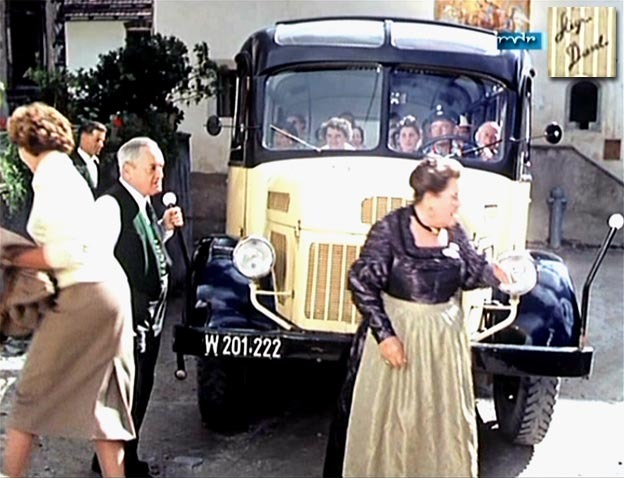 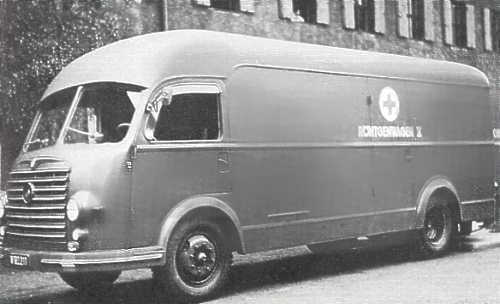 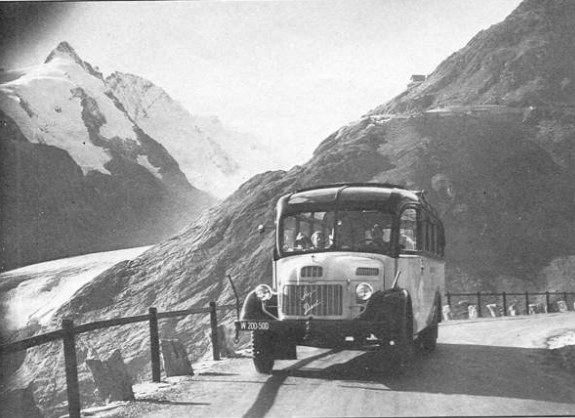 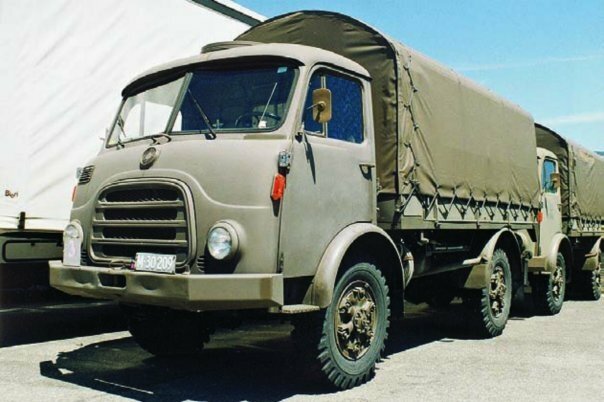 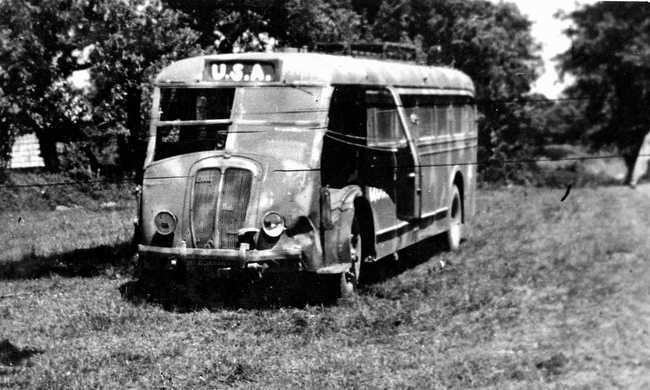 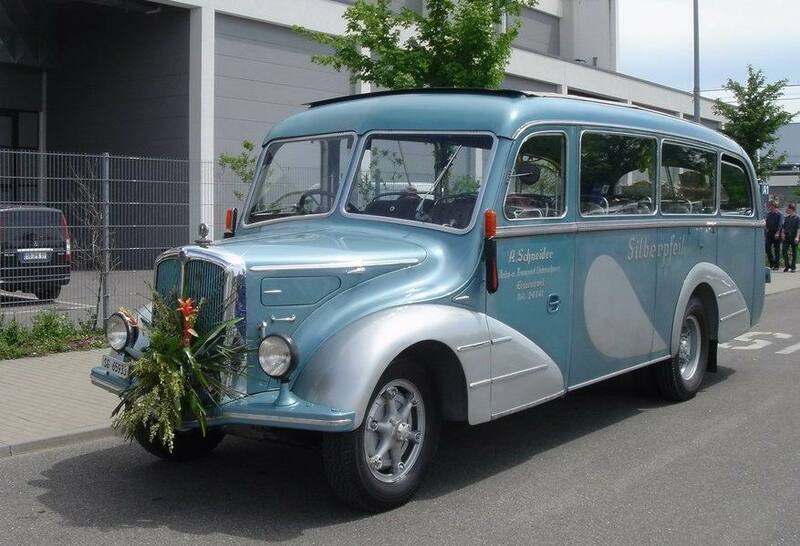 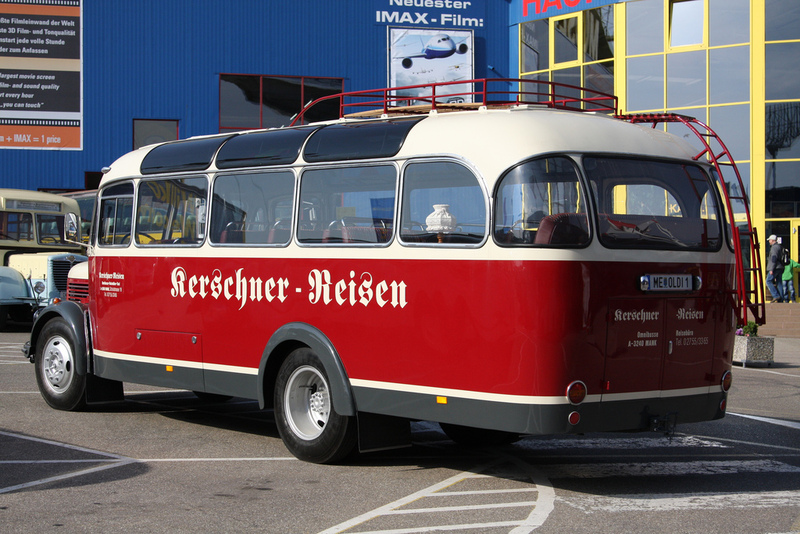 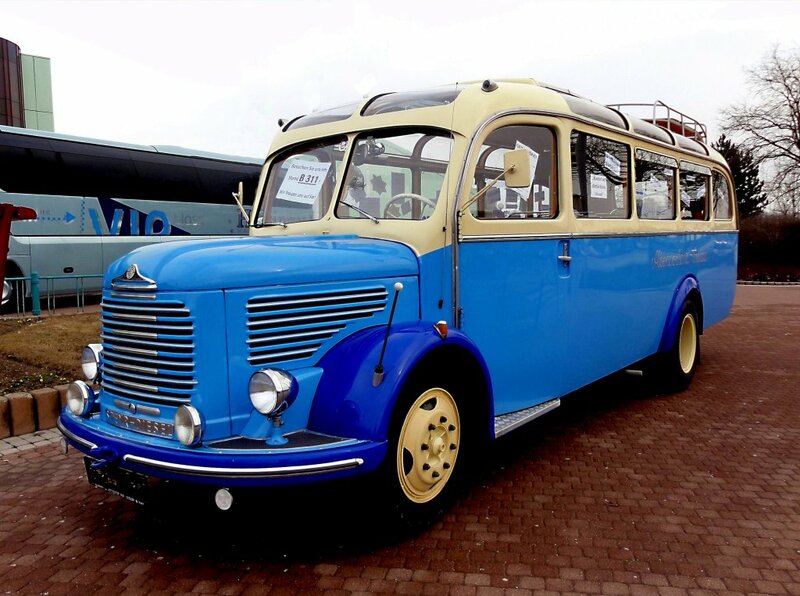 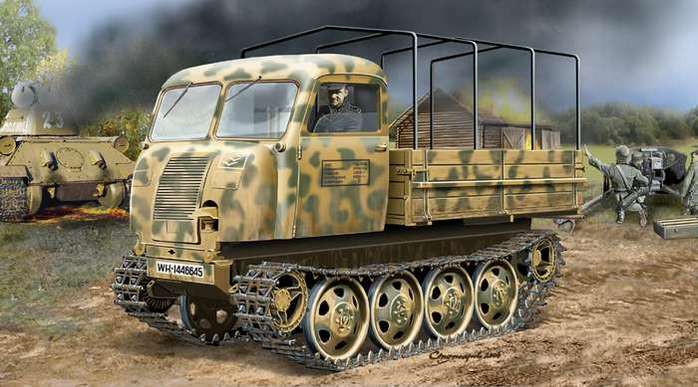 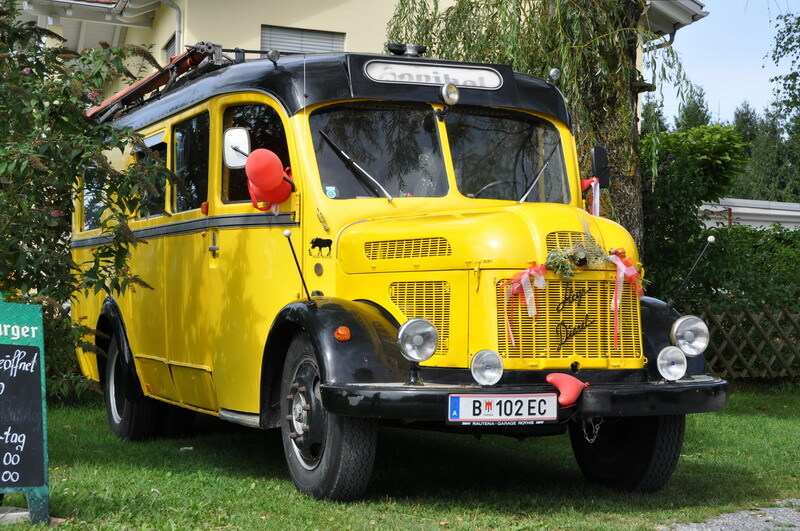 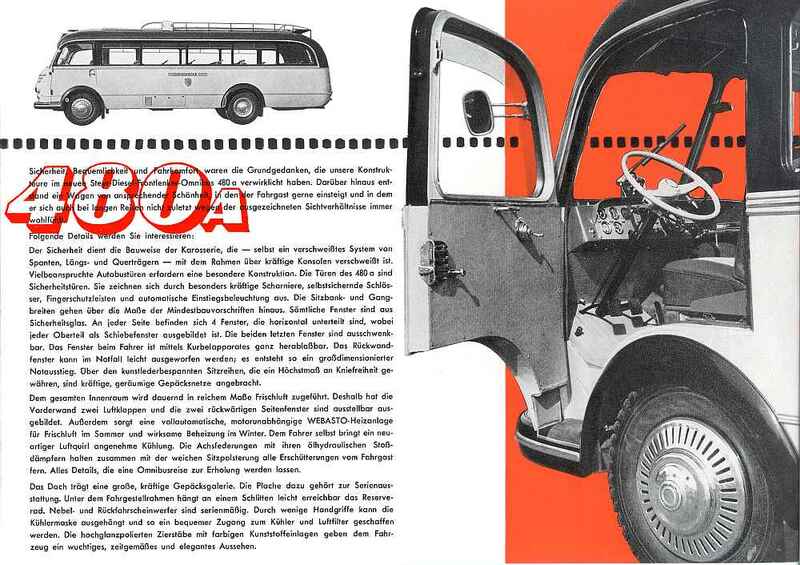 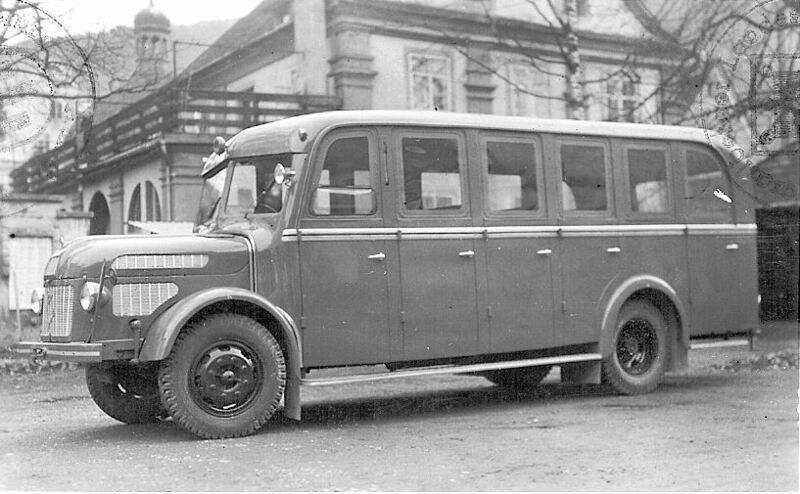 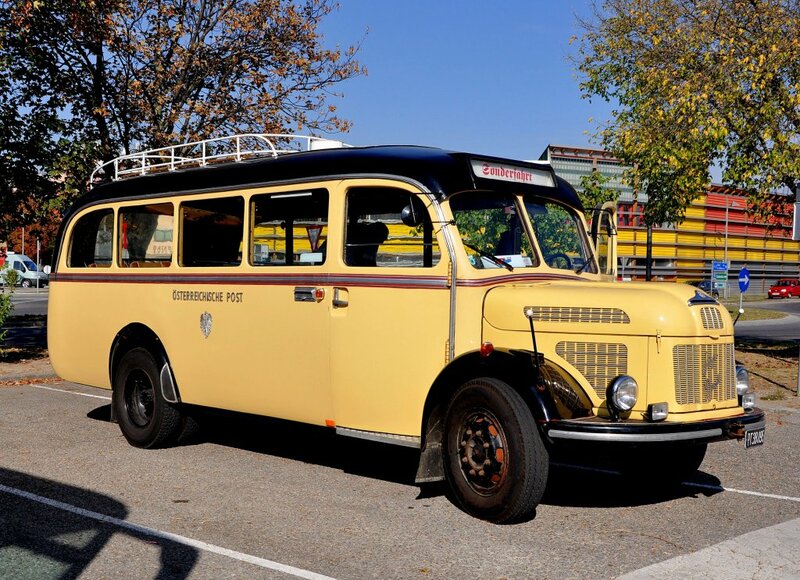 After the war, Steyr-Daimler-Puch built Diesel engined trucks and buses, small and heavy tractors and also resumed passenger car production. 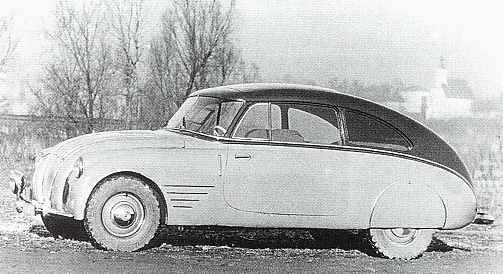 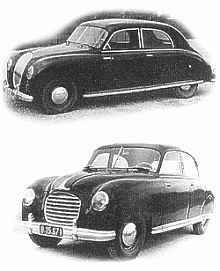 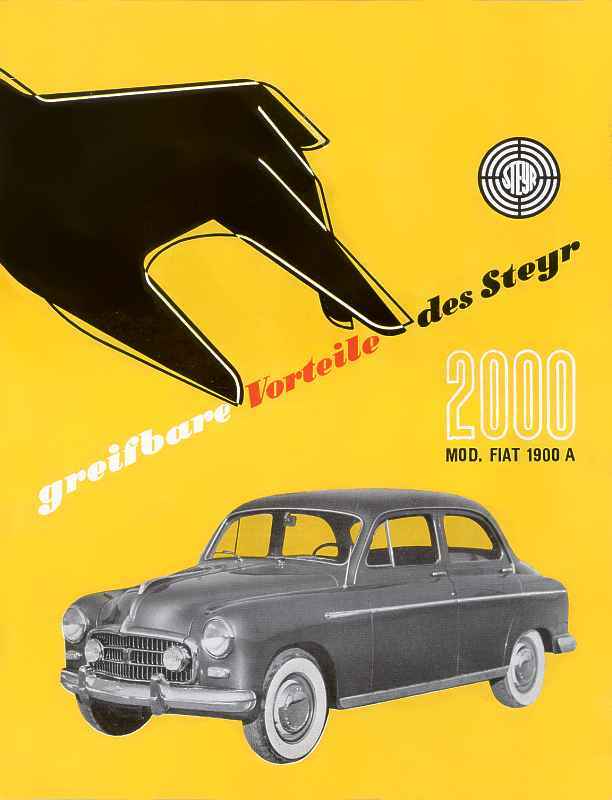 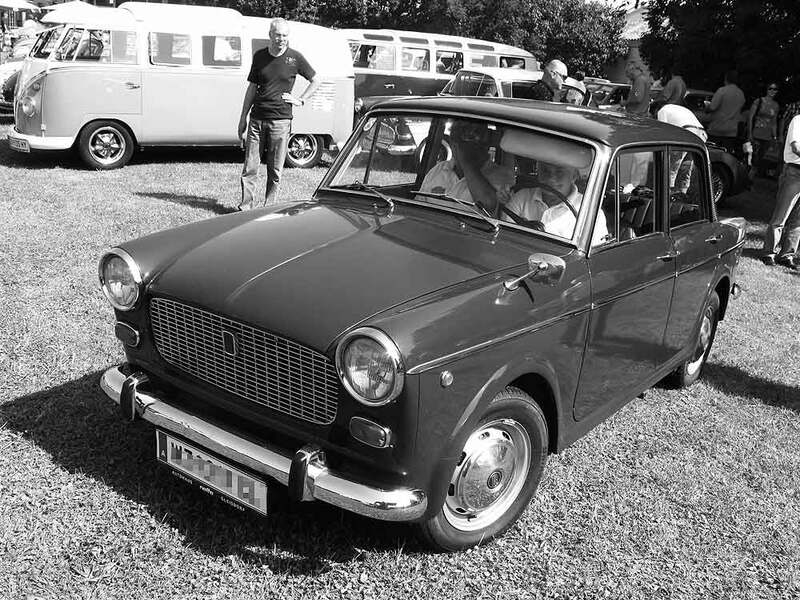 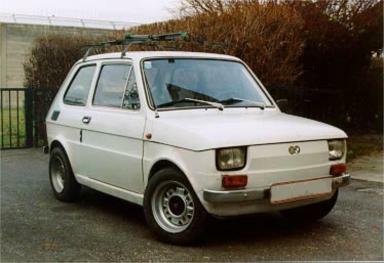 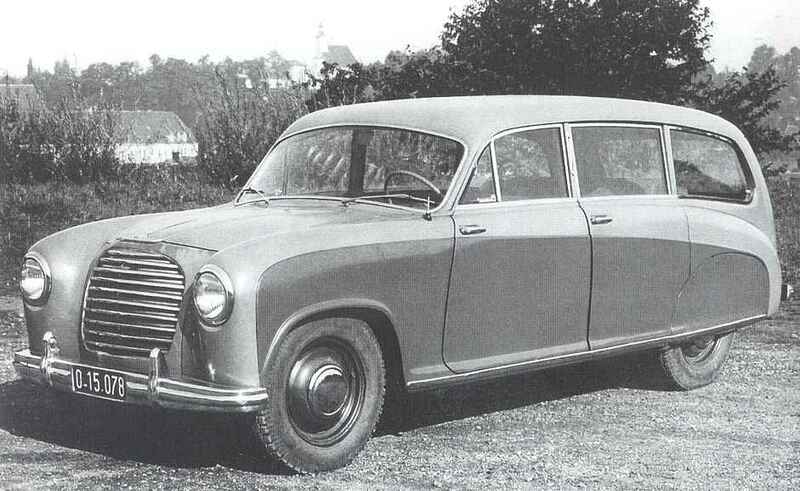 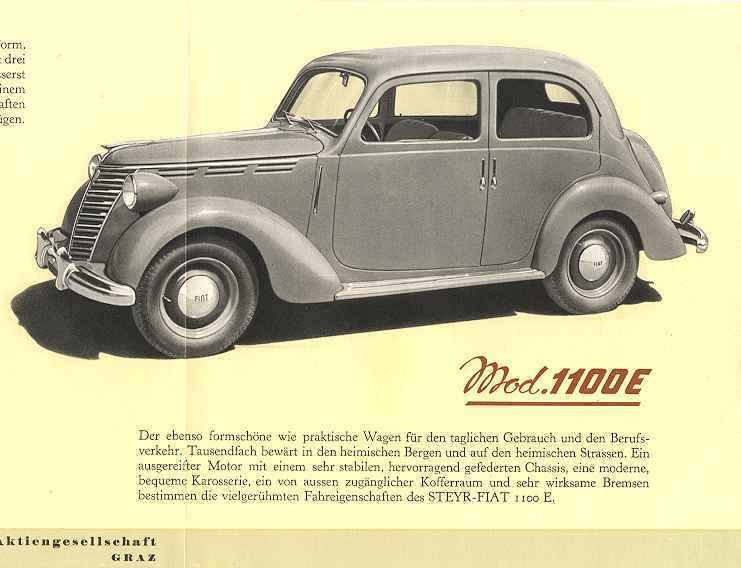 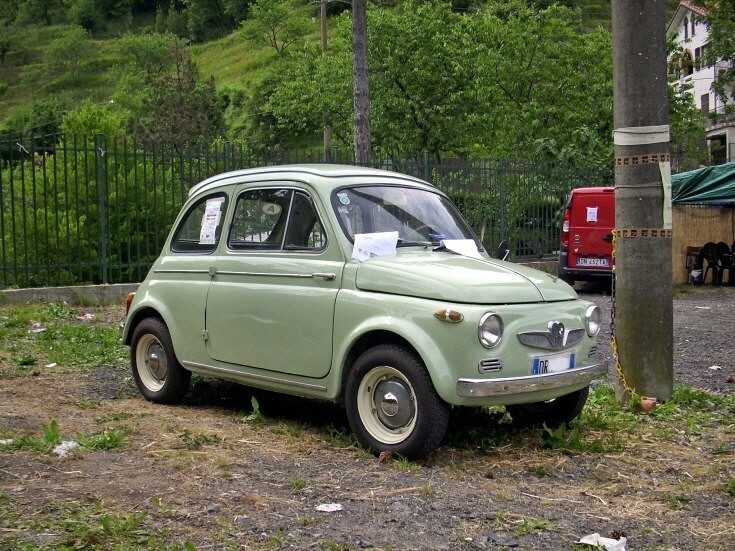 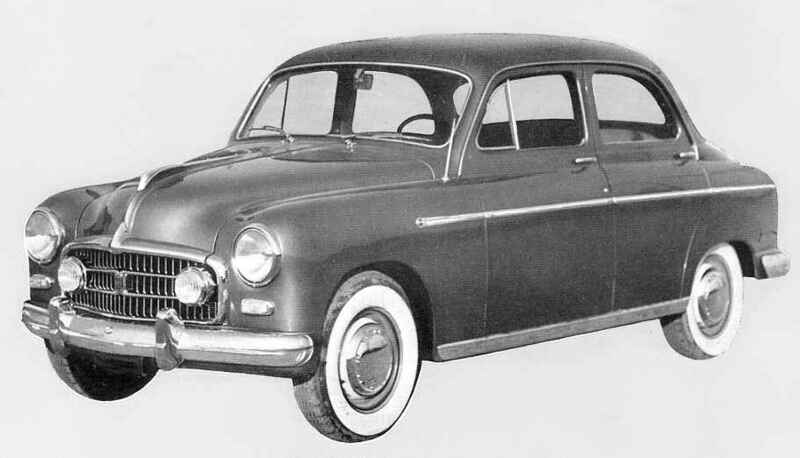 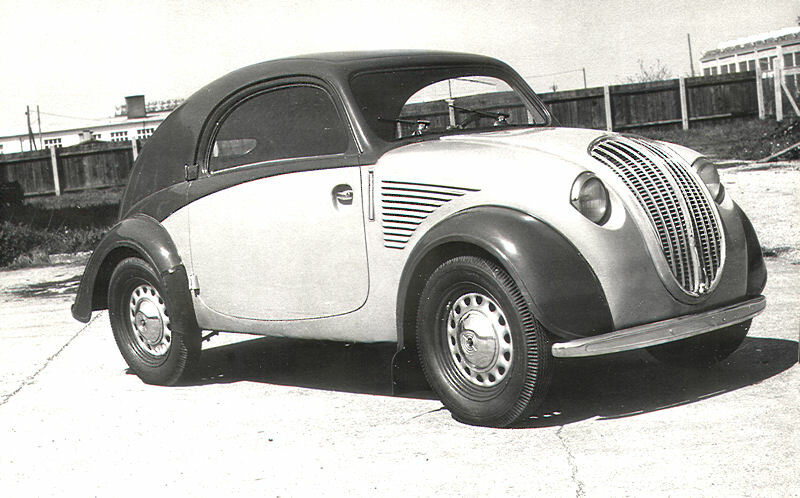 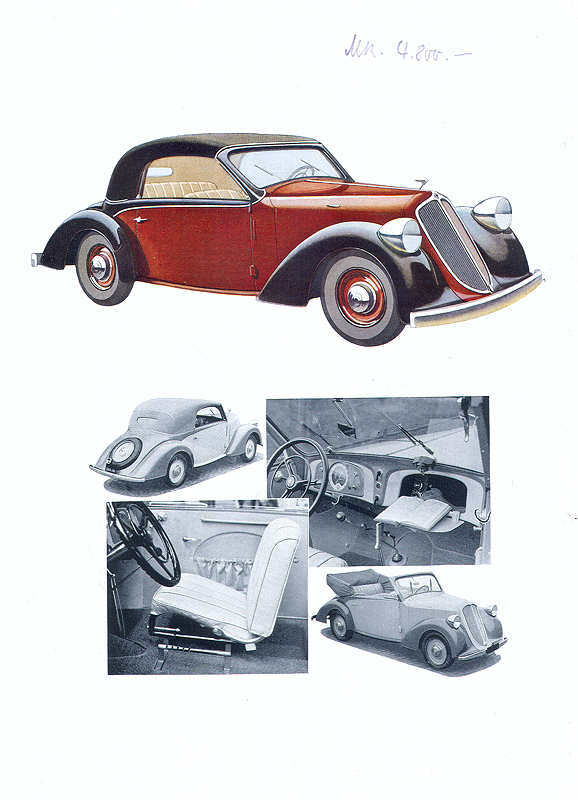 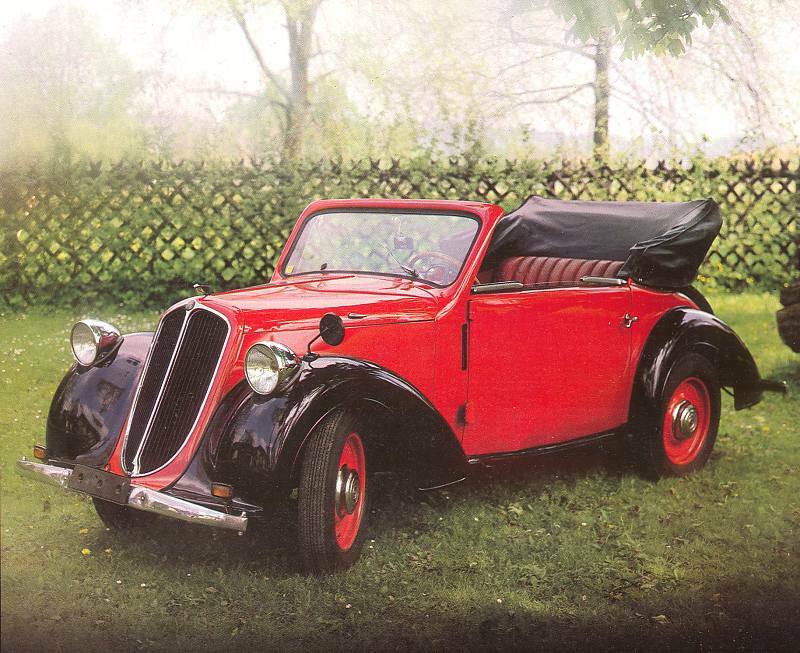 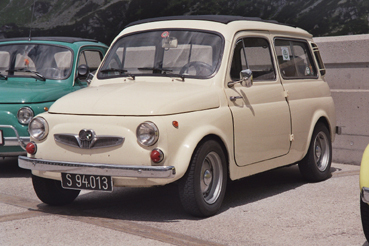 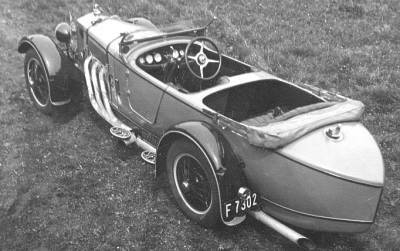 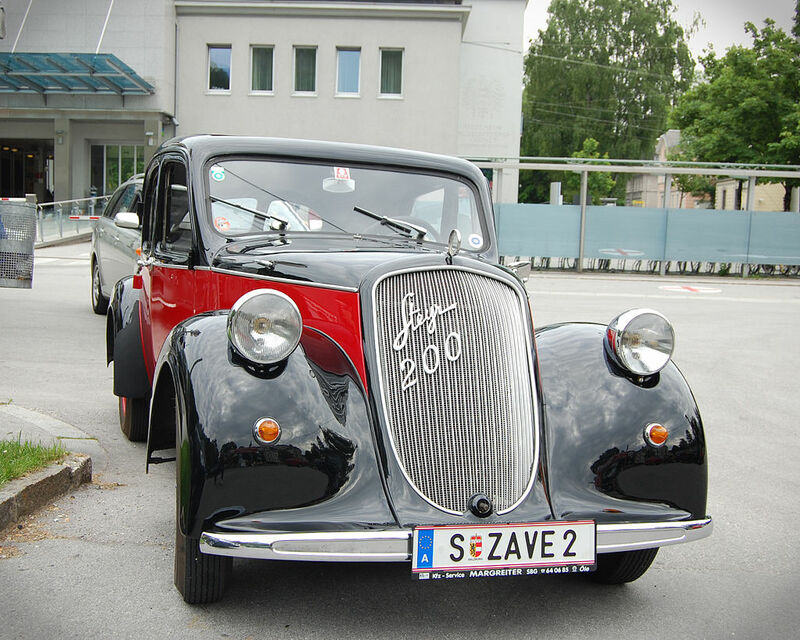 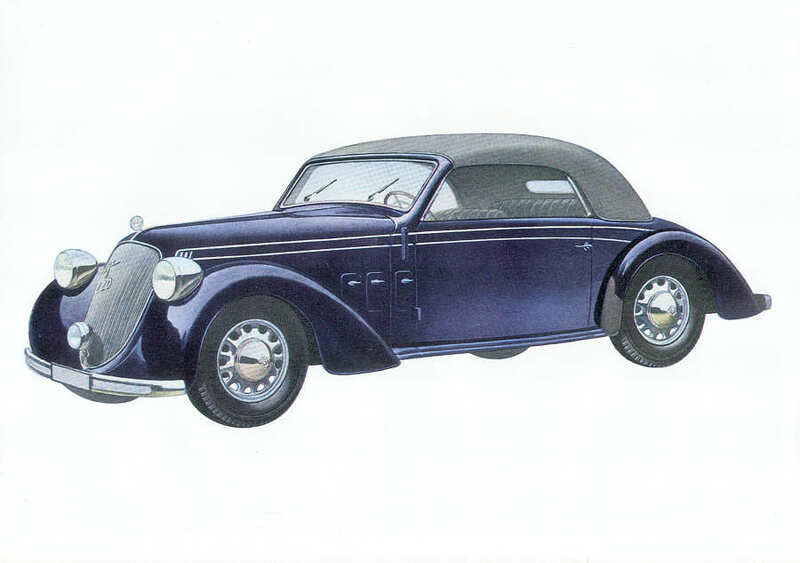 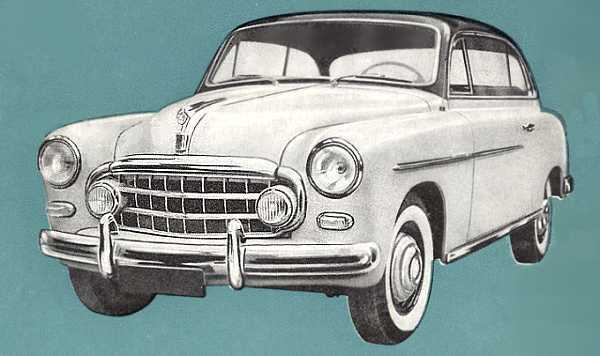 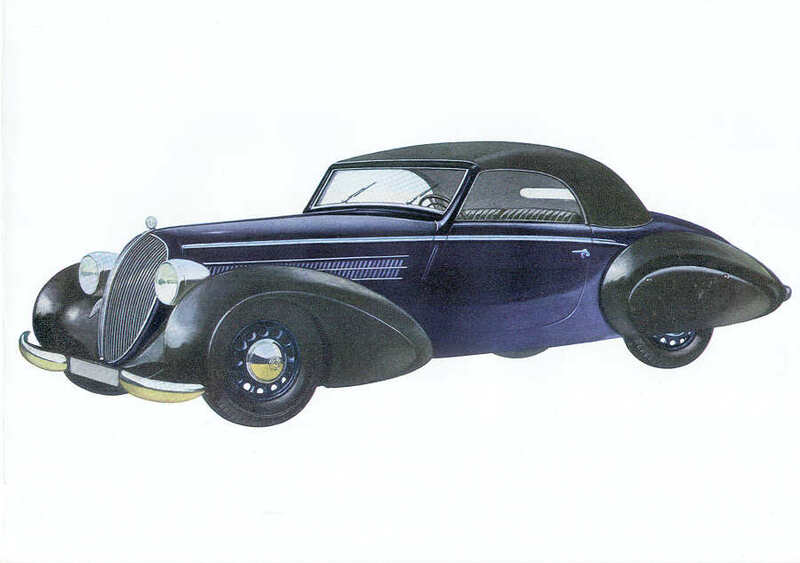 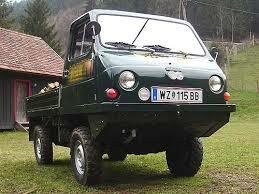 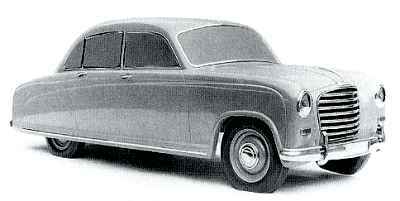 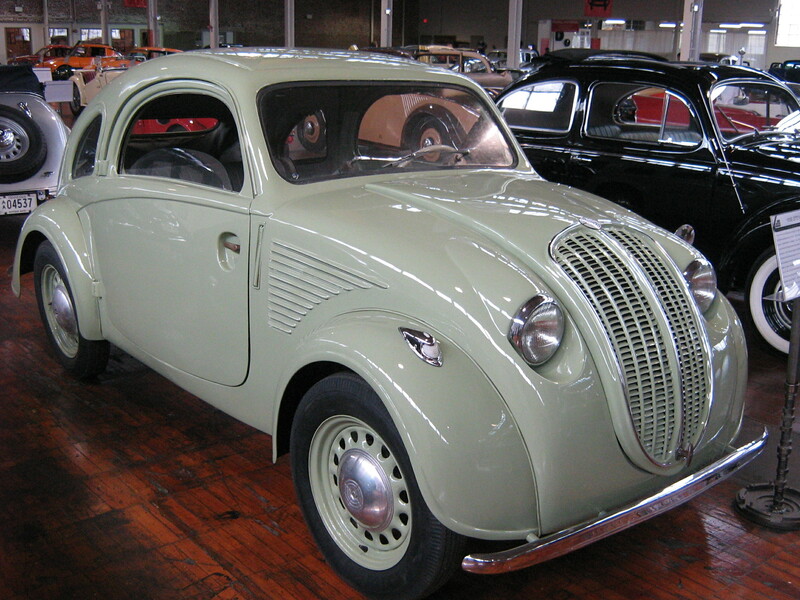 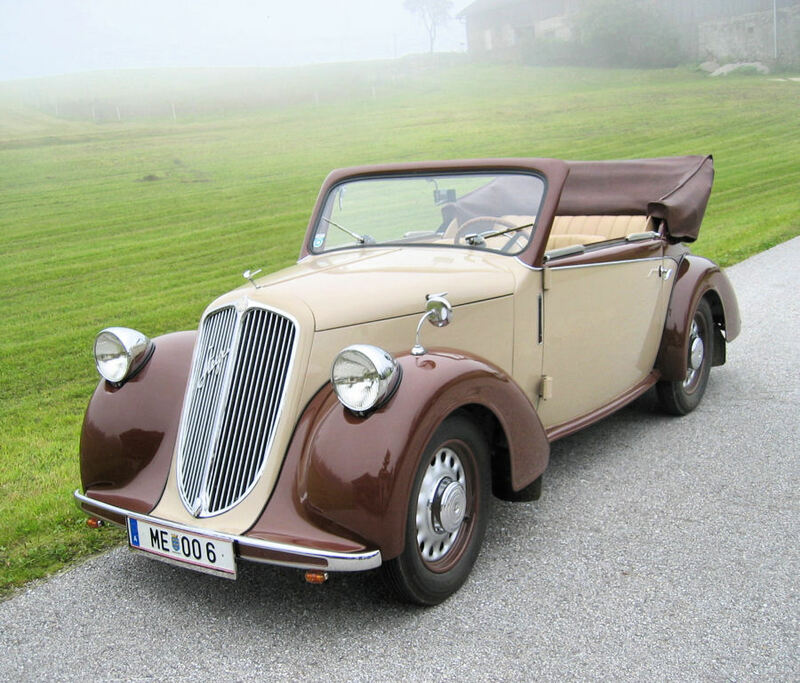 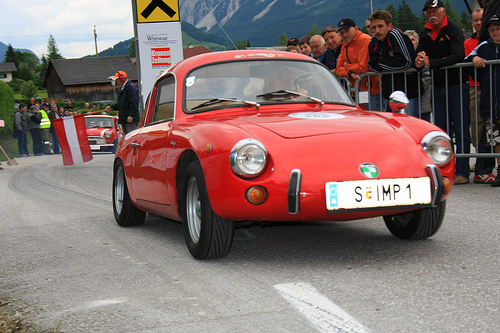 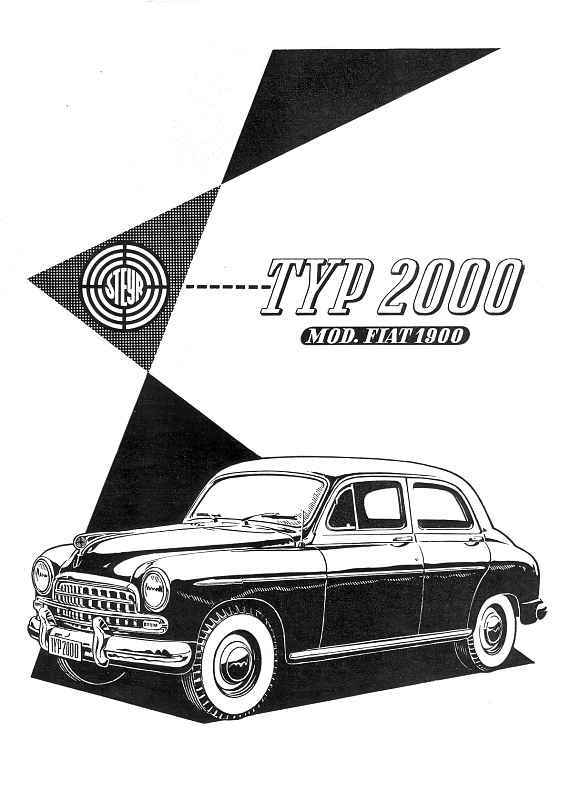 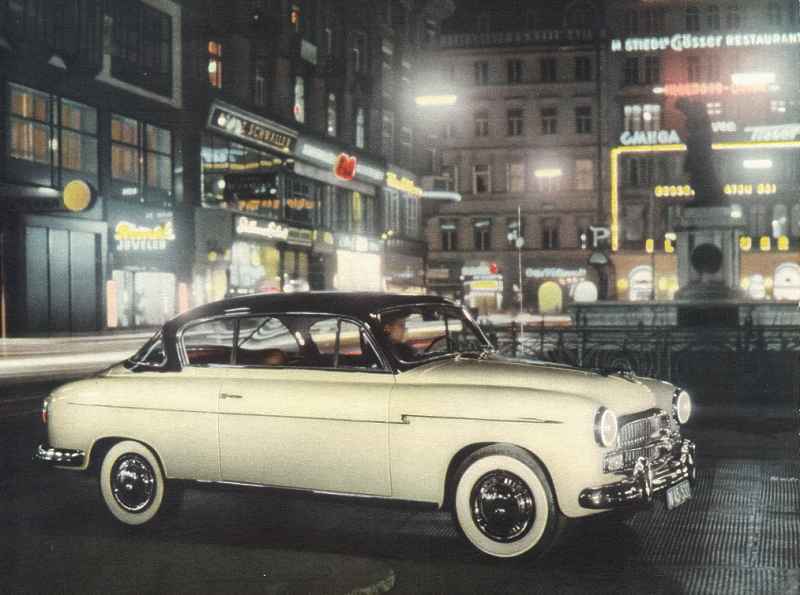 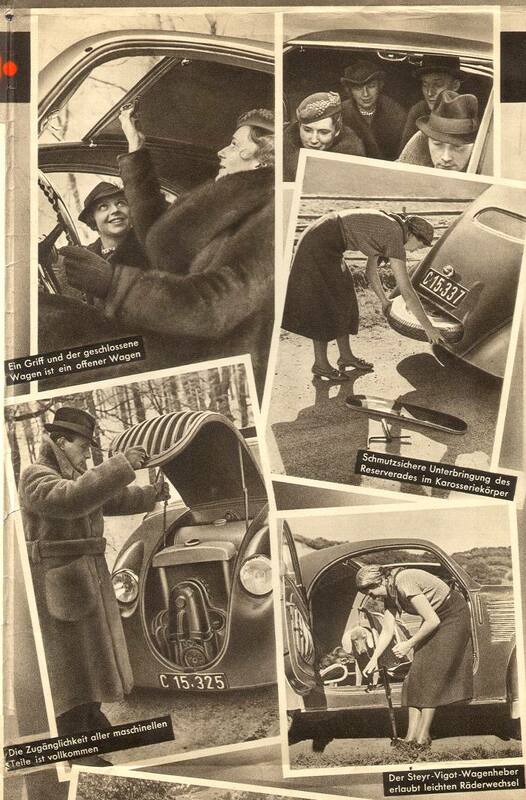 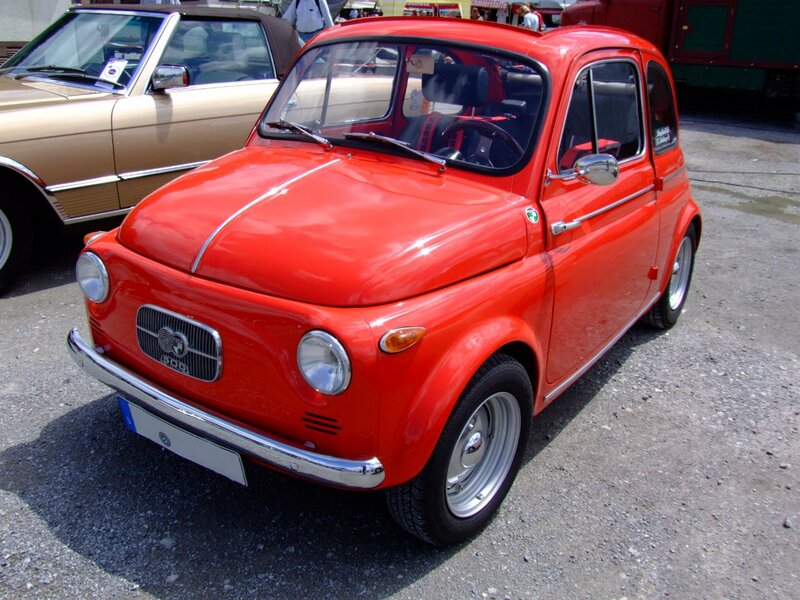 First, Steyr assembled the FIAT 1100E, then put their own engine in a Fiat 1400, renaming the car the “Steyr 2000”. 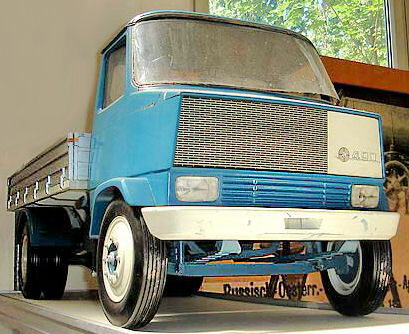 From 1957 through to the early 1970s it produced the tiny Puch 500 under license from FIAT, again with an engine of Austrian design. 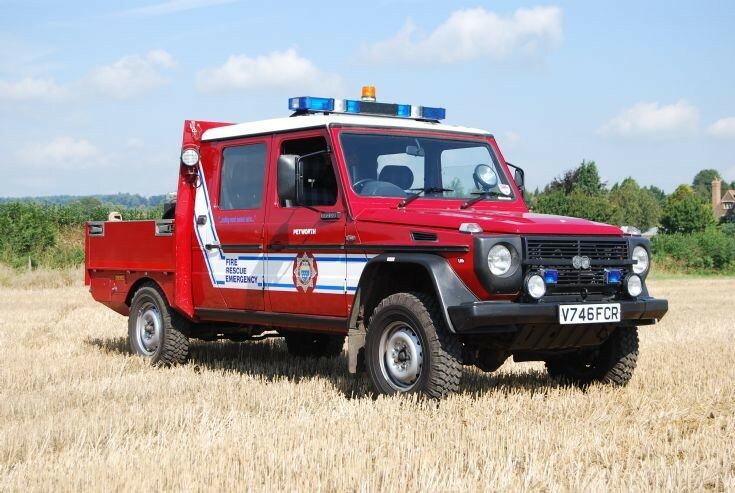 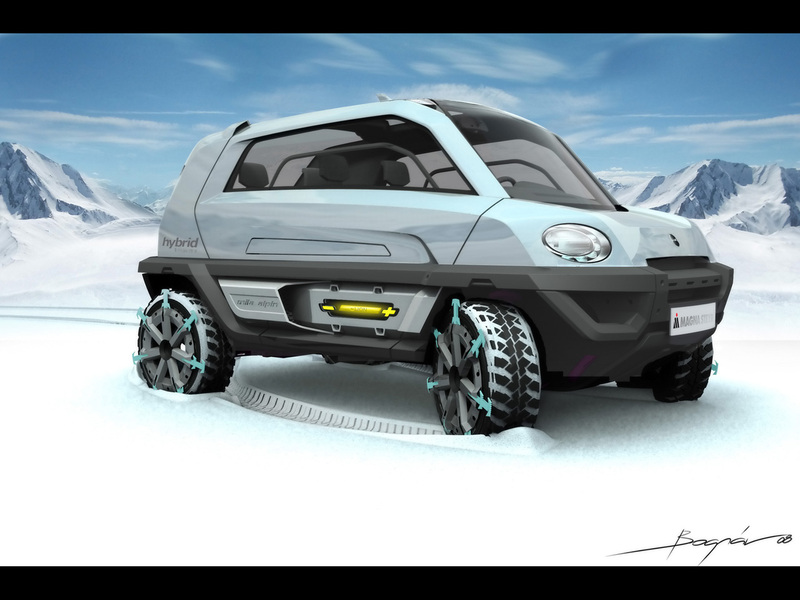 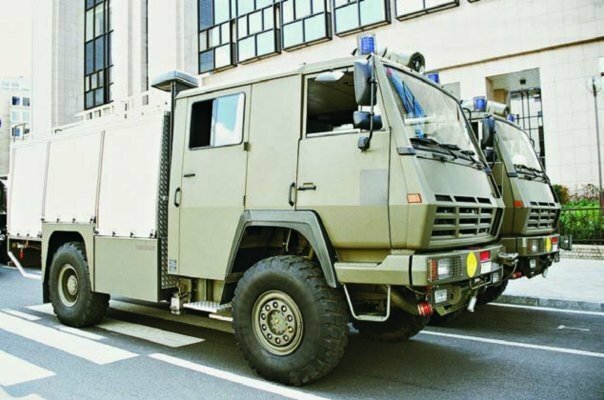 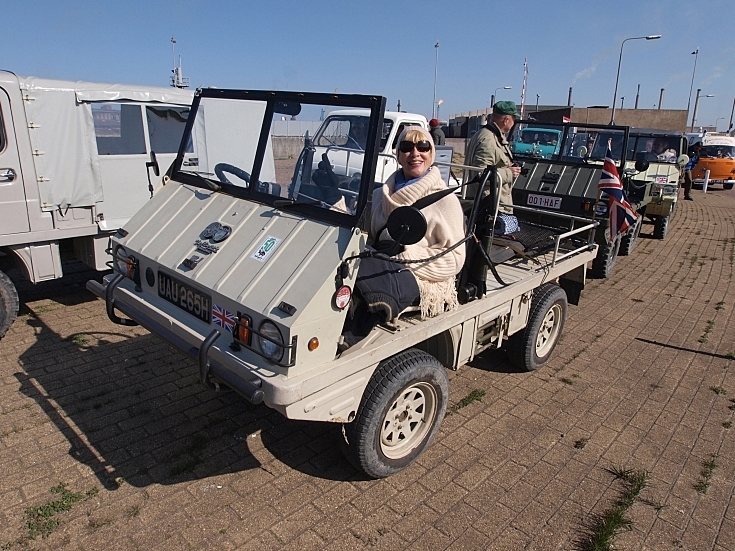 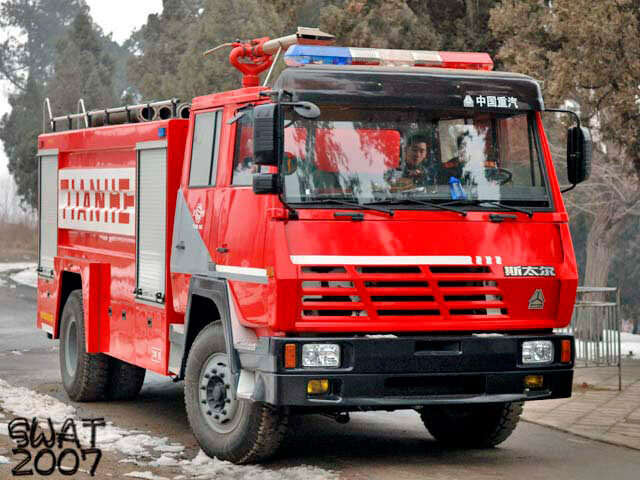 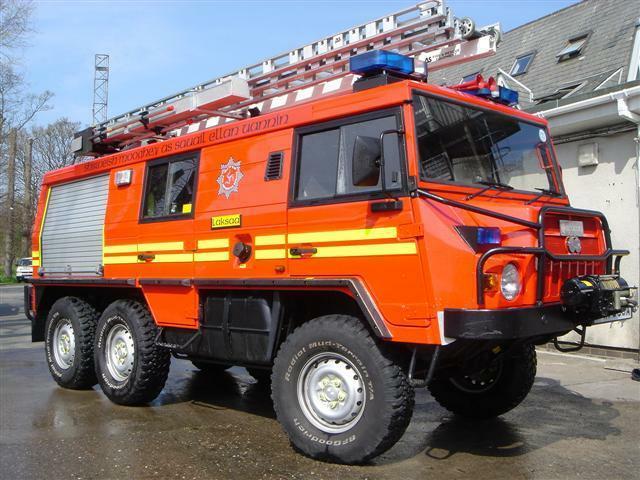 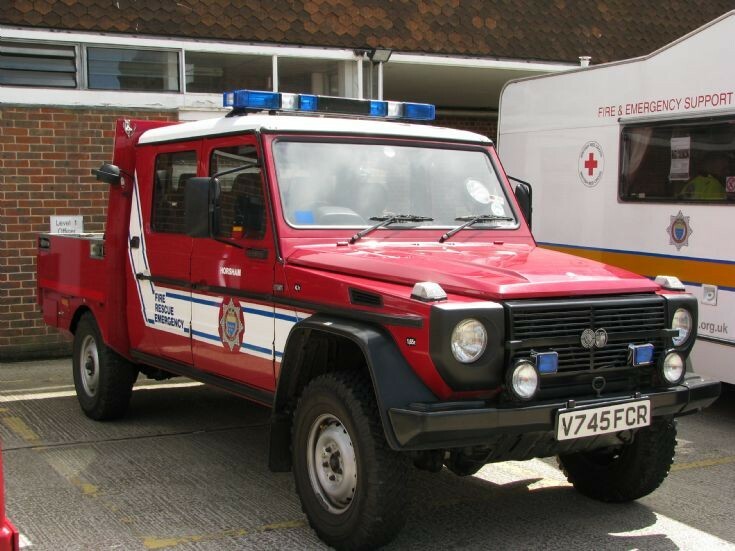 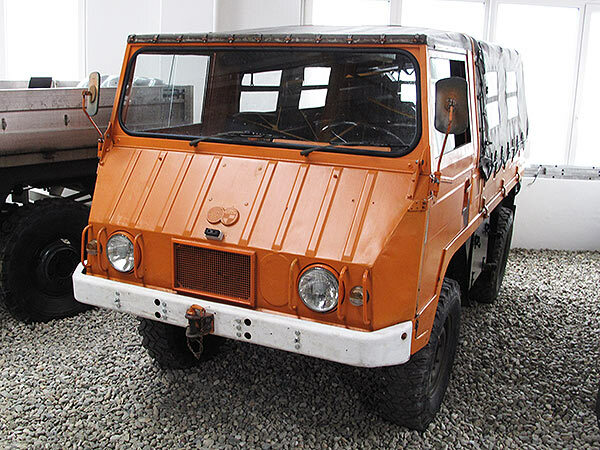 Most prominent, however, was its range of off-road cars, from the two-cylinder Haflinger and the 4 x 4 or 6 x 6 Pinzgauer, the Fiat Panda 4×4 (999cc) to the Mercedes-Puch G. SDP was the initial designer and manufacturer of these utility vehicles. 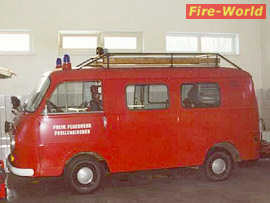 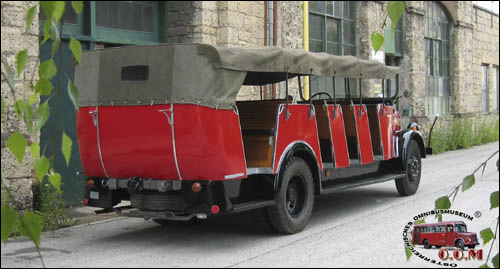 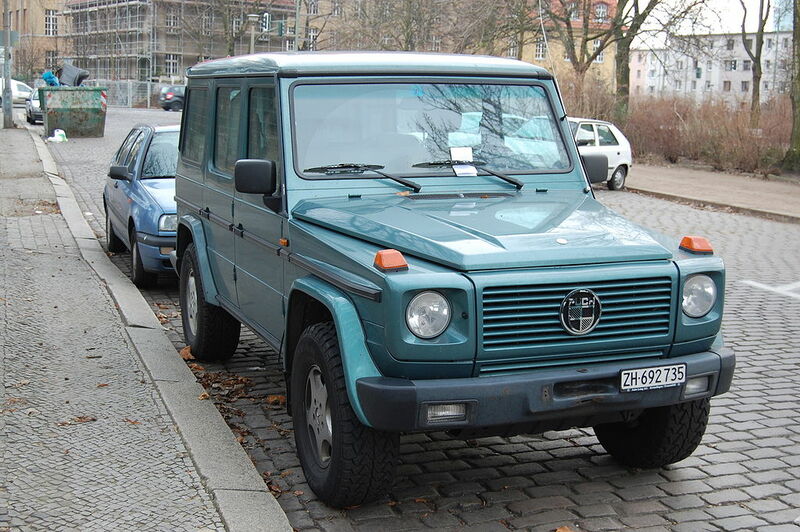 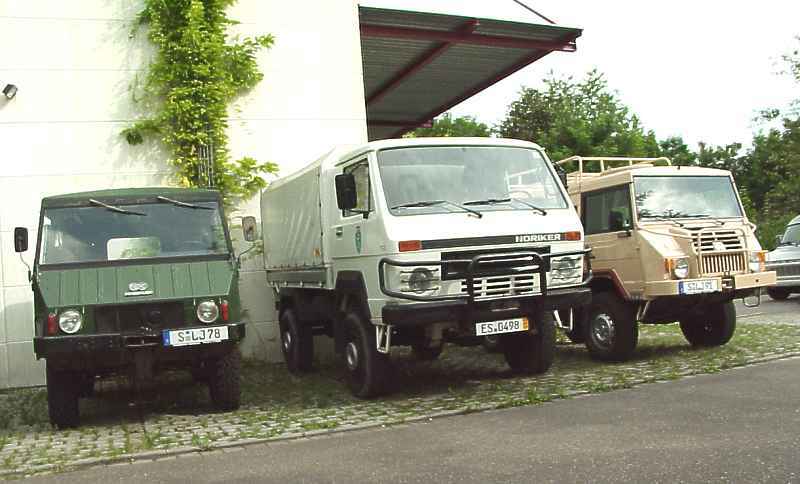 The Haflinger was produced from 1959–1974, the Pinzgauer from 1971–2000, and the Puch G (also known as Mercedes G-Class) from 1979. 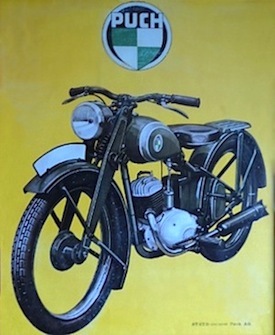 The company produced a line of motorcycles and motor scooters marketed in the United States through Sears Roebuck including the SR 125 motorcycle which was delivered in a cardboard crate box to the customer’s home.The Austro-Daimler branch built heavy tractors and trucks for the imperial Austrian army (before 1915). 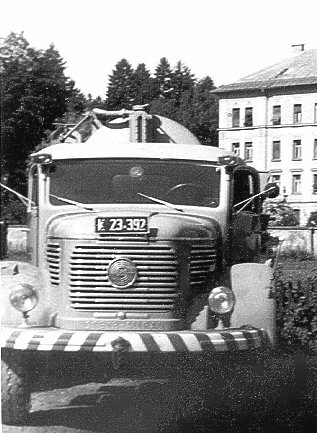 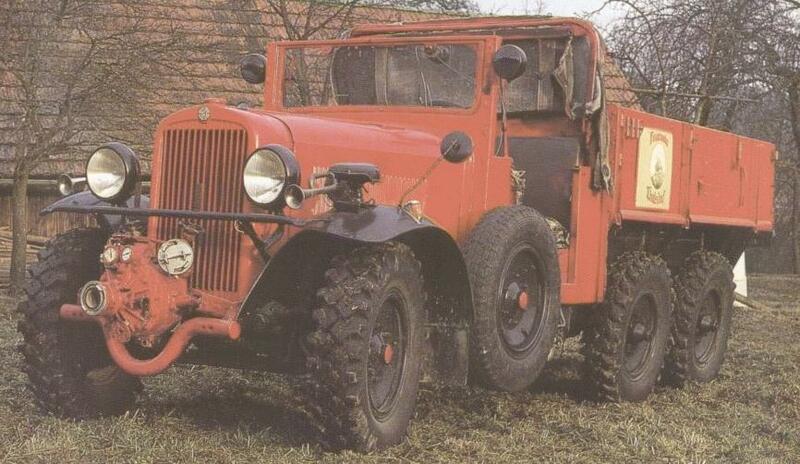 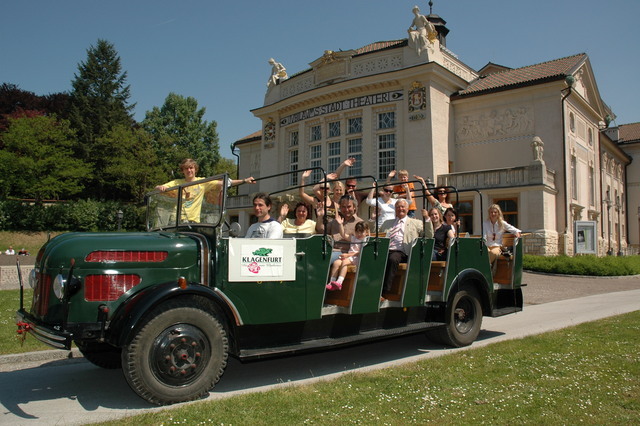 The main Steyr civil agricultural tractor production started in 1947. 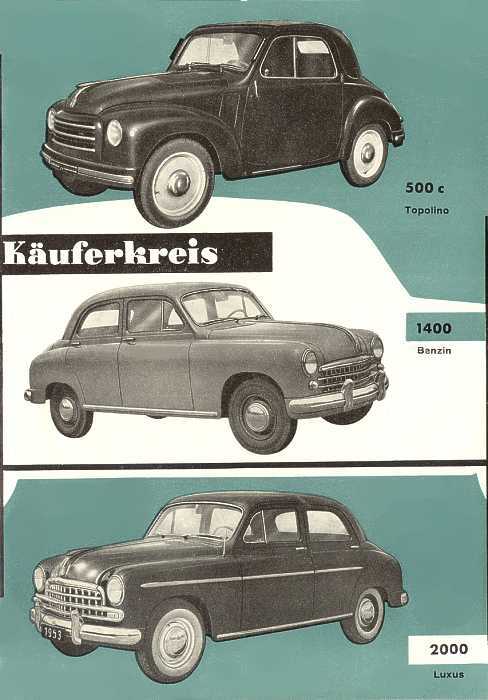 After the war Steyr-Daimler-Puch resumed manufacturing bicycles and mopeds, gradually establishing distributors in several countries to manage their sales. 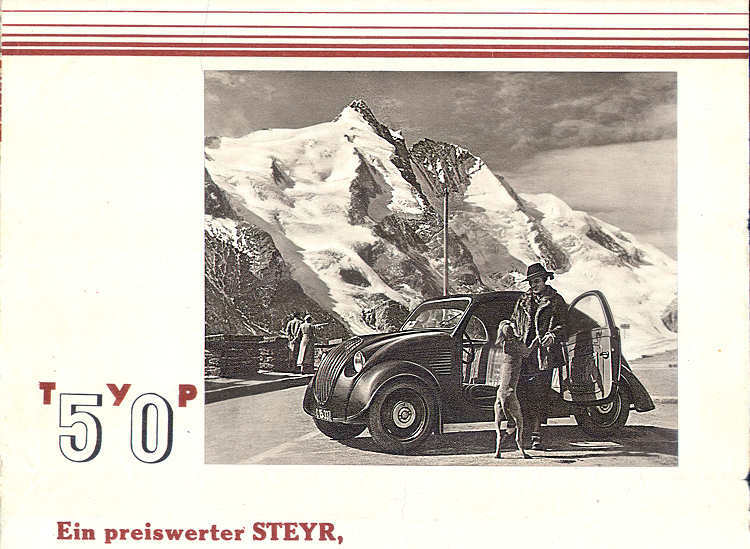 Steyr also made bicycles for sale for other retailers, most notably Sears. 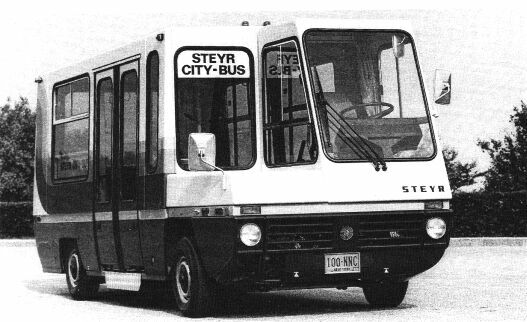 In the mid 1970s “Steyr-Daimler-Puch America” was incorporated in Connecticut to manage importation and distribution of bicycles and mopeds. 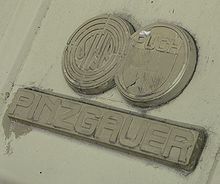 Puch Austro-Daimler bicycles remained in production at Graz in Austria until the motorcycle and bicycle fabrication portions of the company there were sold in the mid 1987 to Piaggio & C. S.p.A. of Italy. 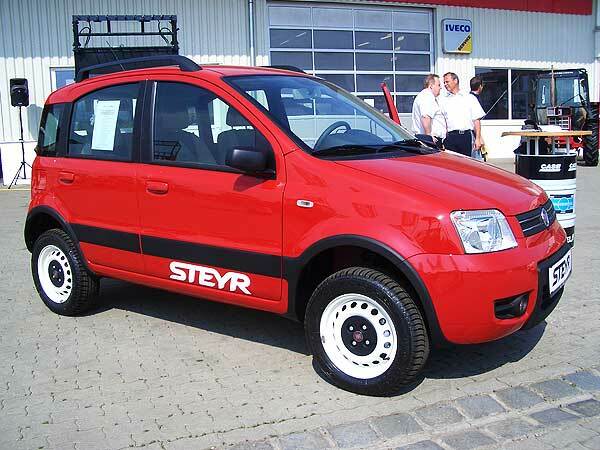 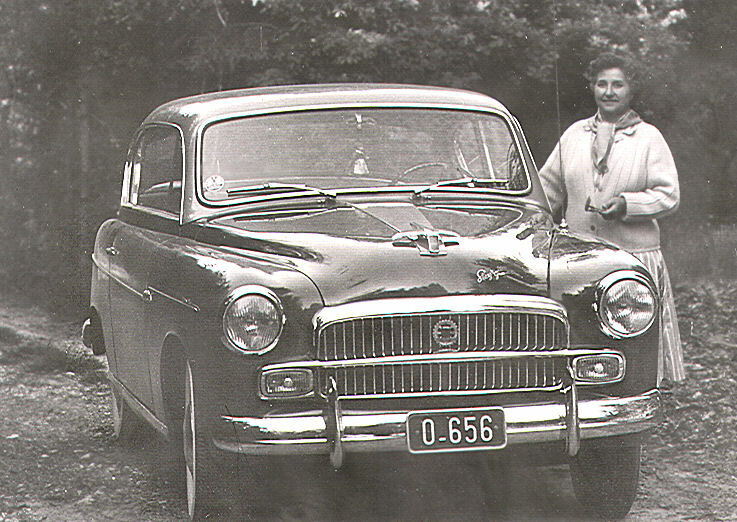 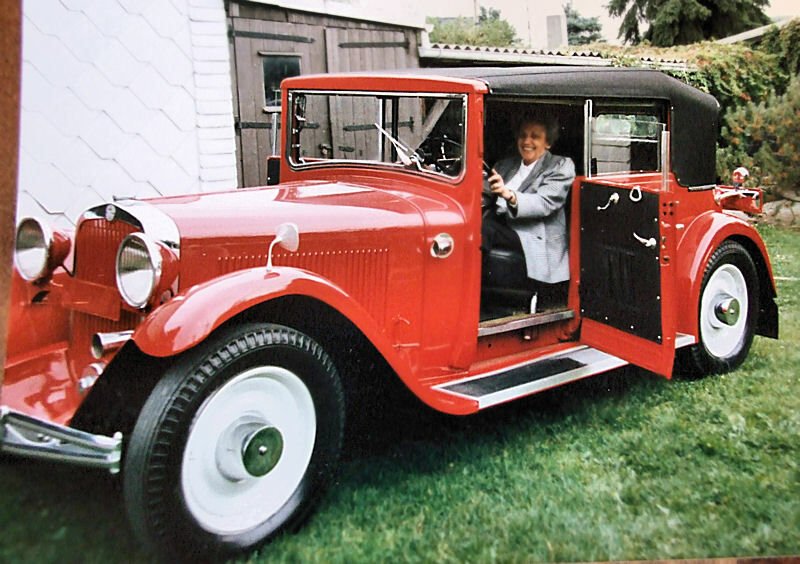 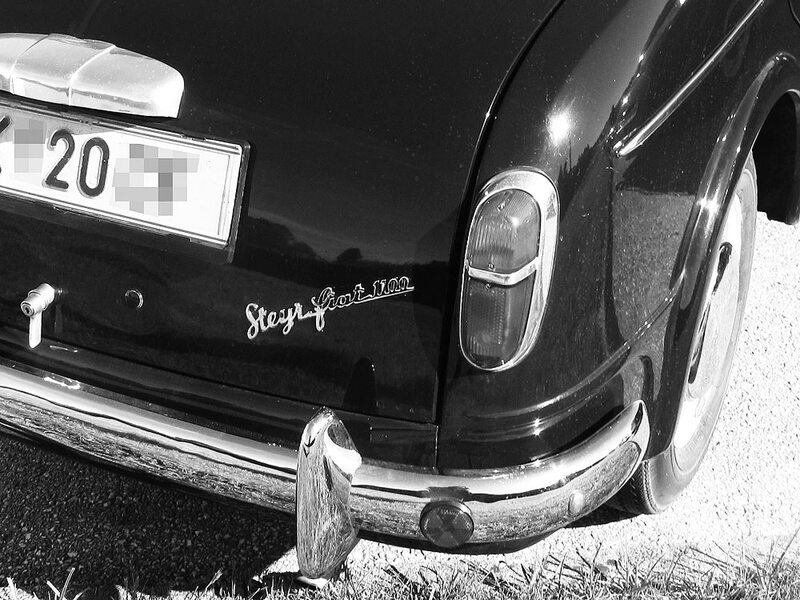 Because of their extreme durability and toughness Steyr products won many enthusiastic friends around the world. 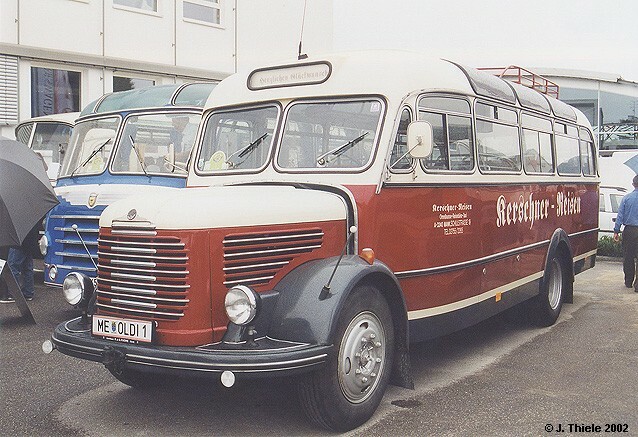 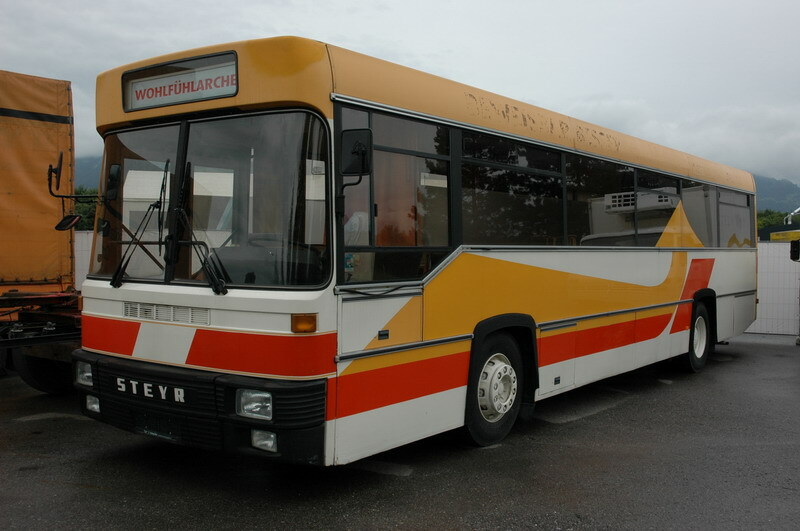 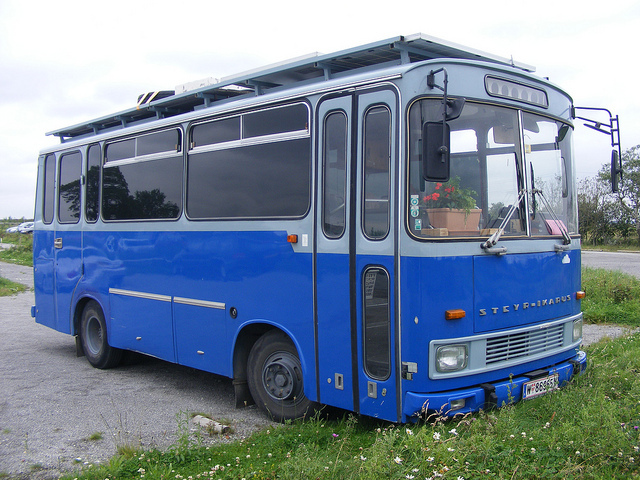 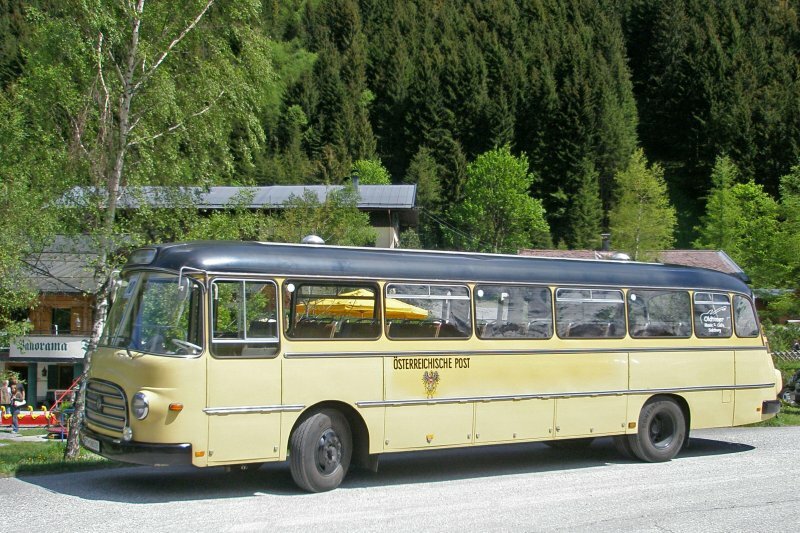 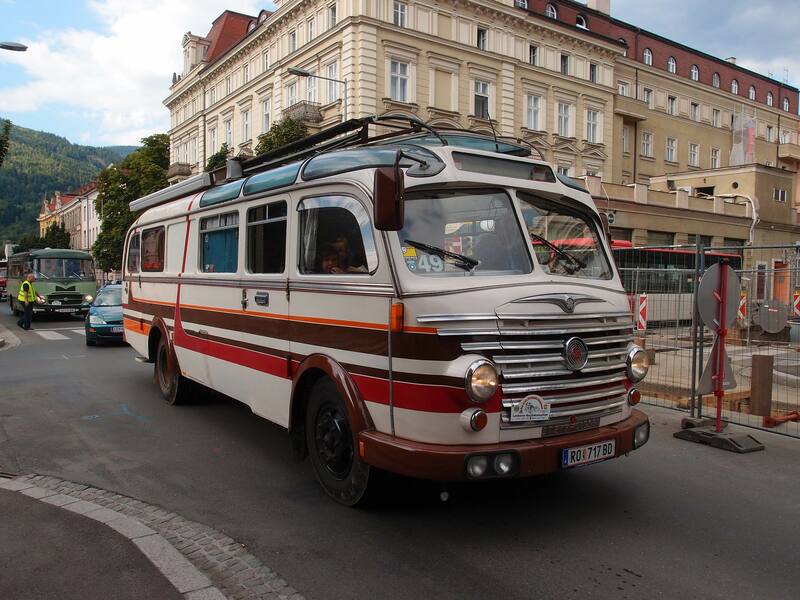 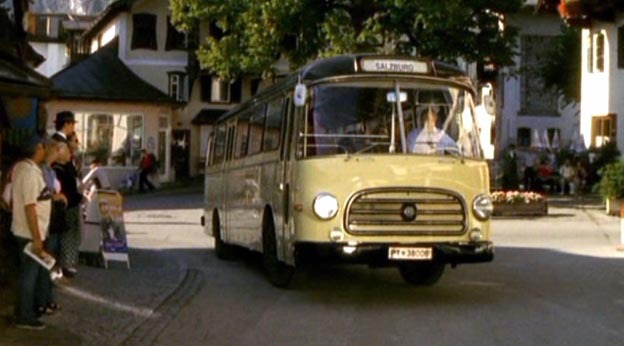 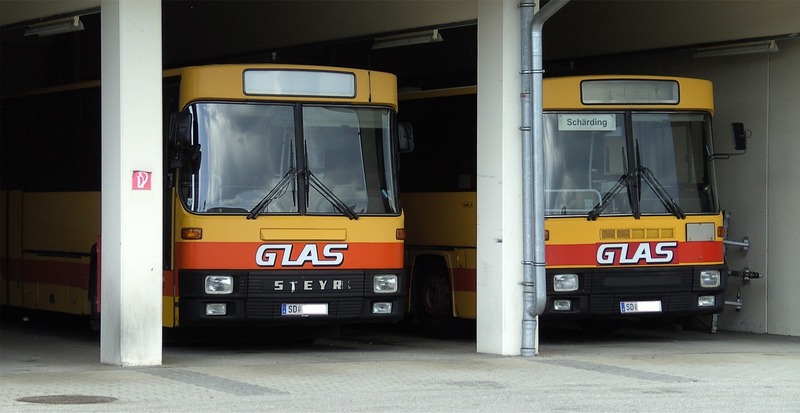 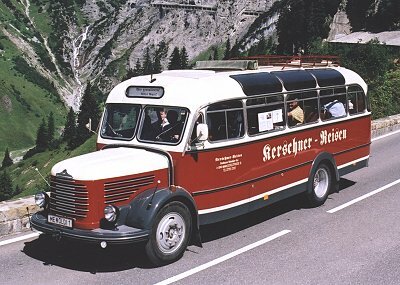 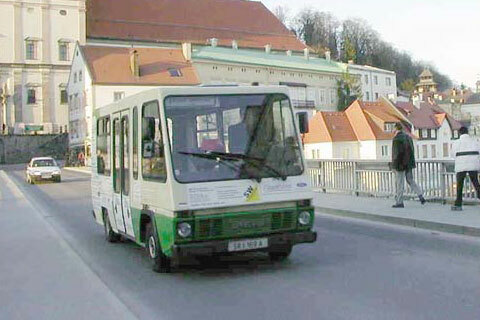 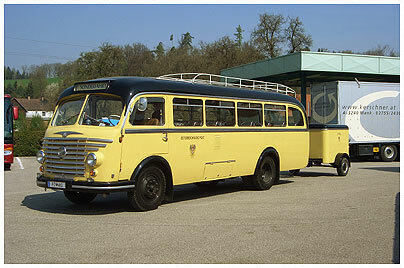 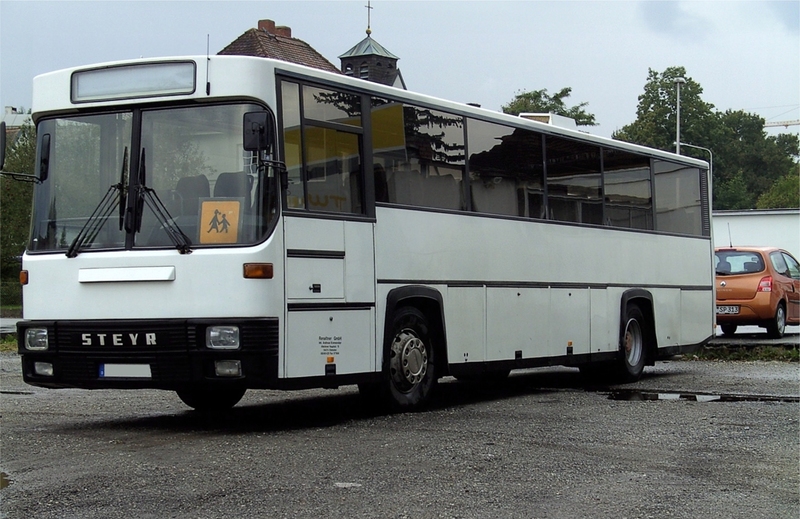 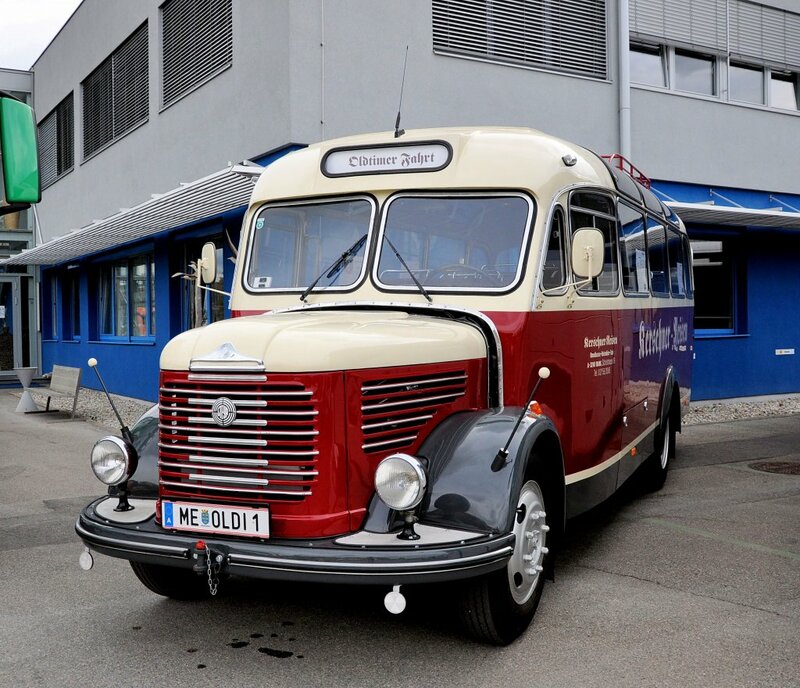 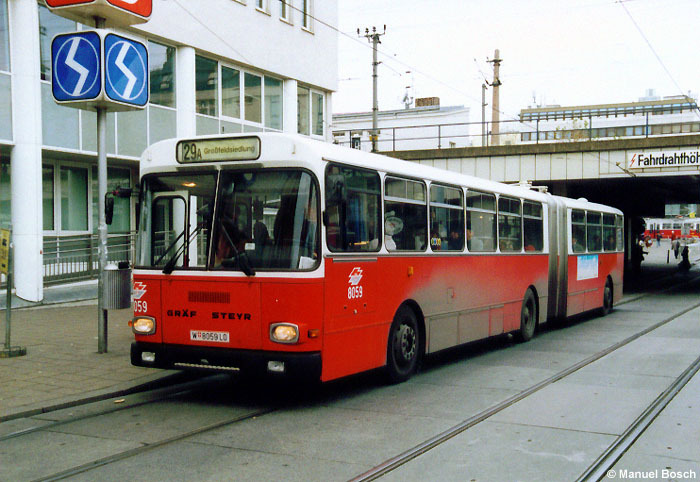 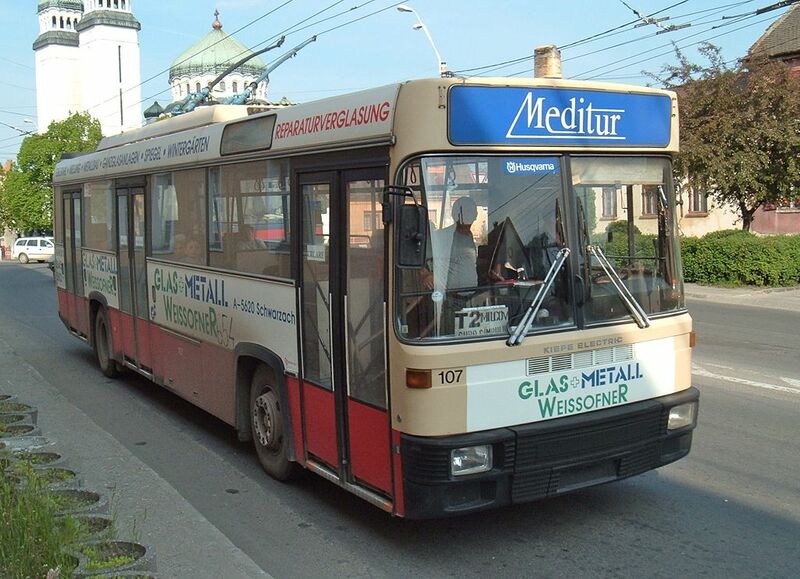 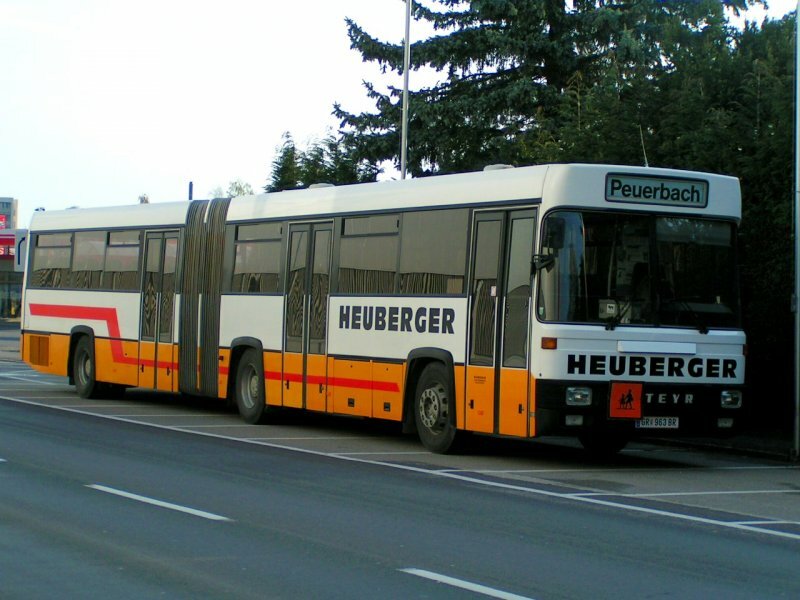 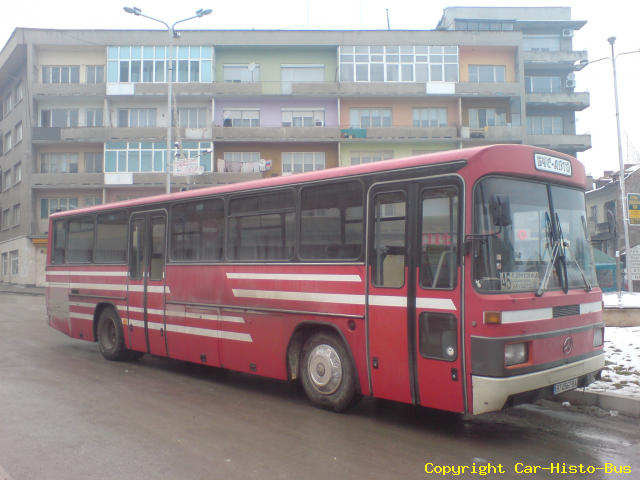 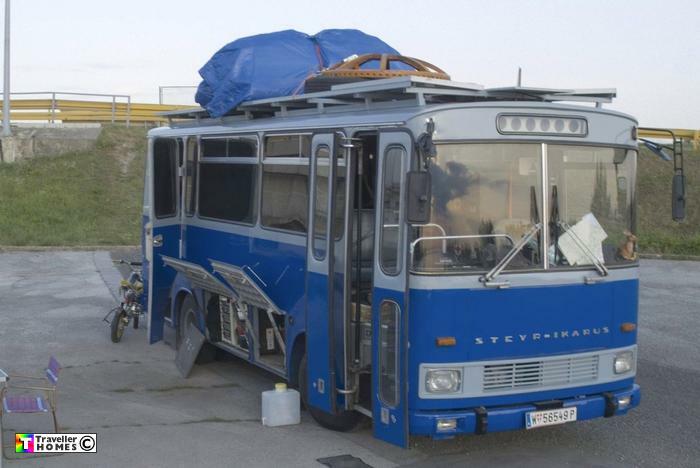 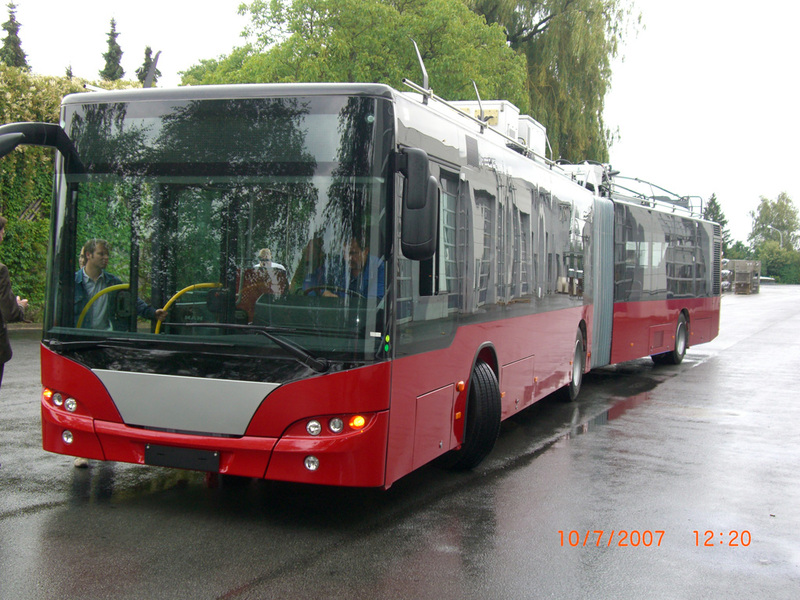 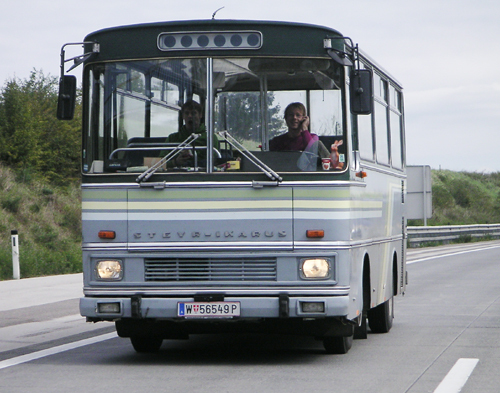 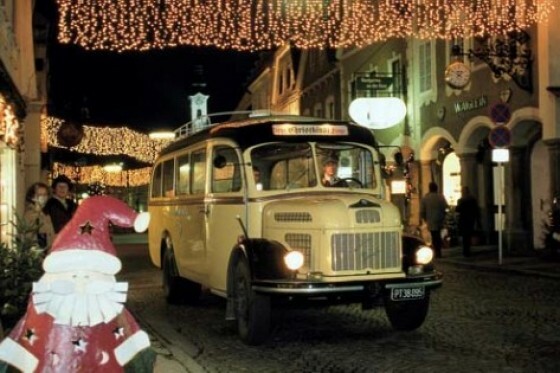 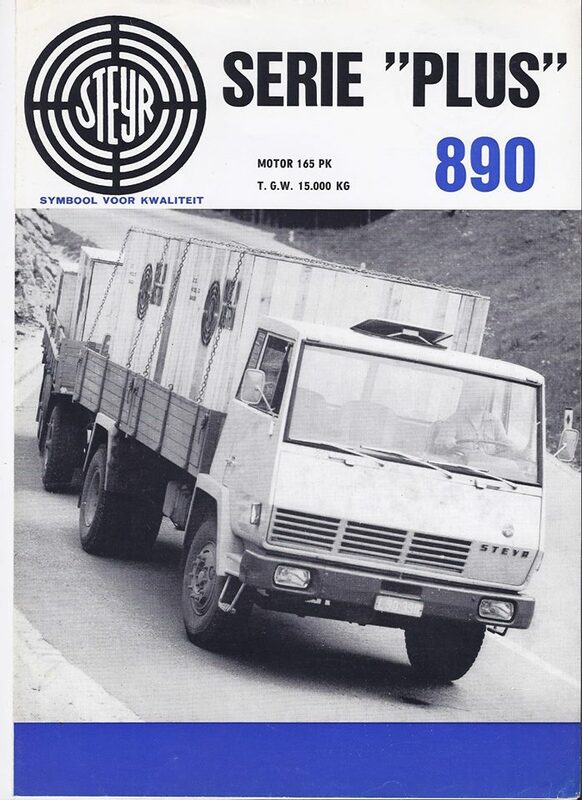 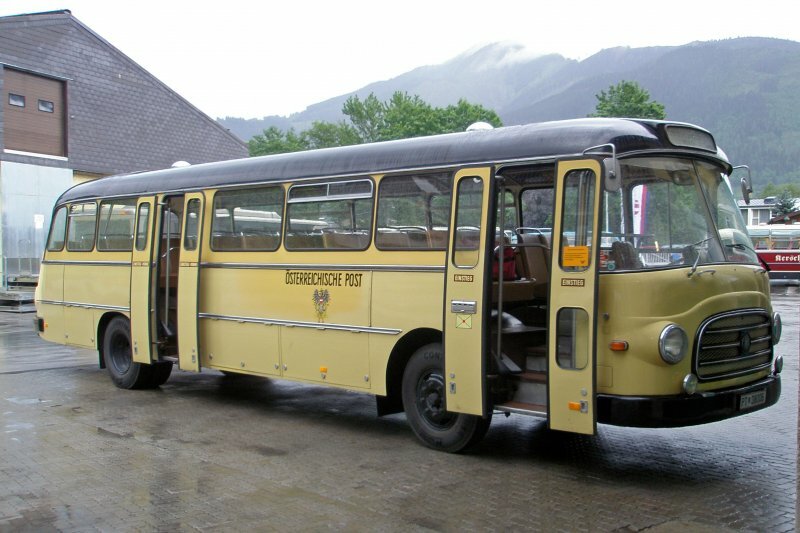 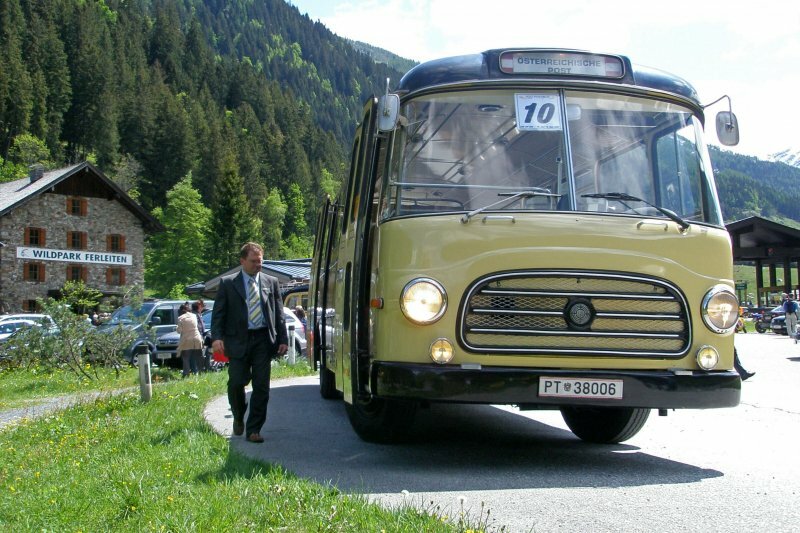 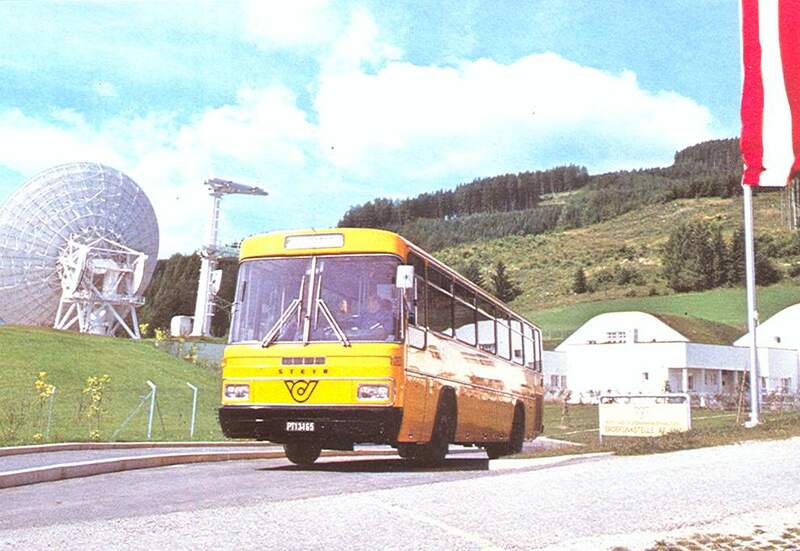 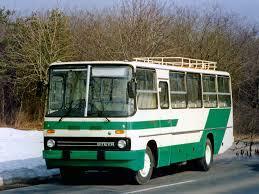 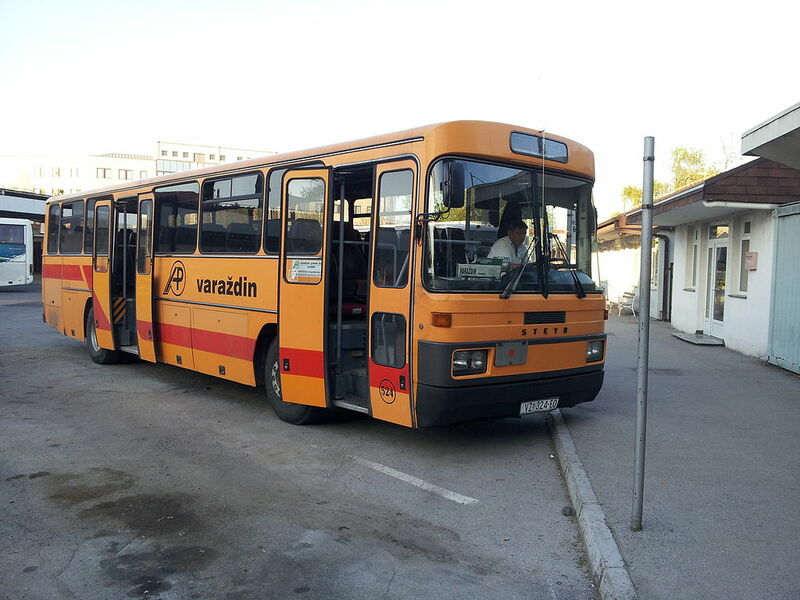 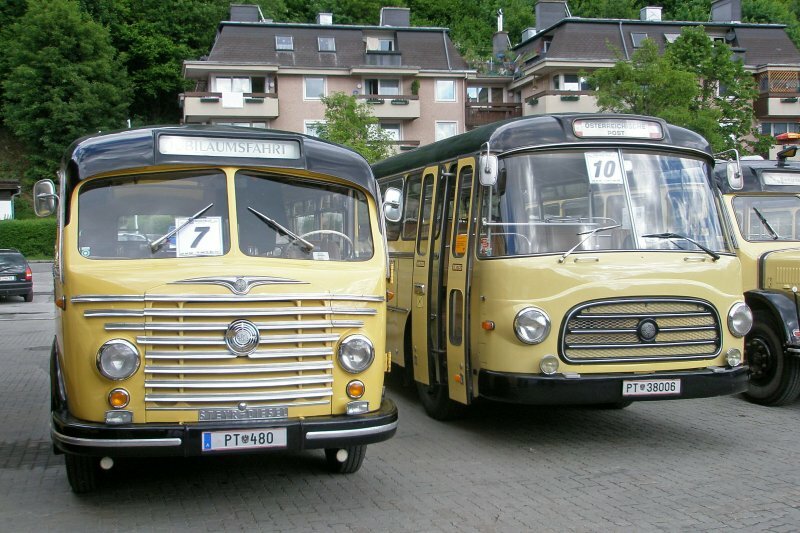 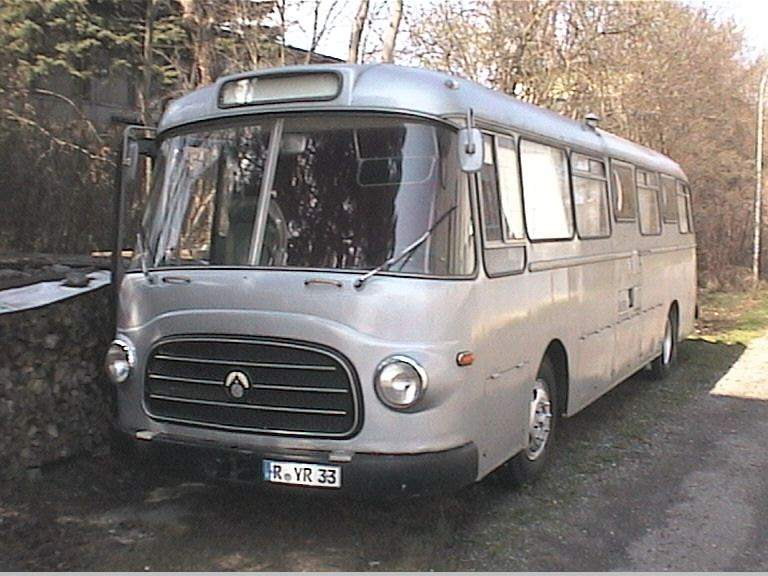 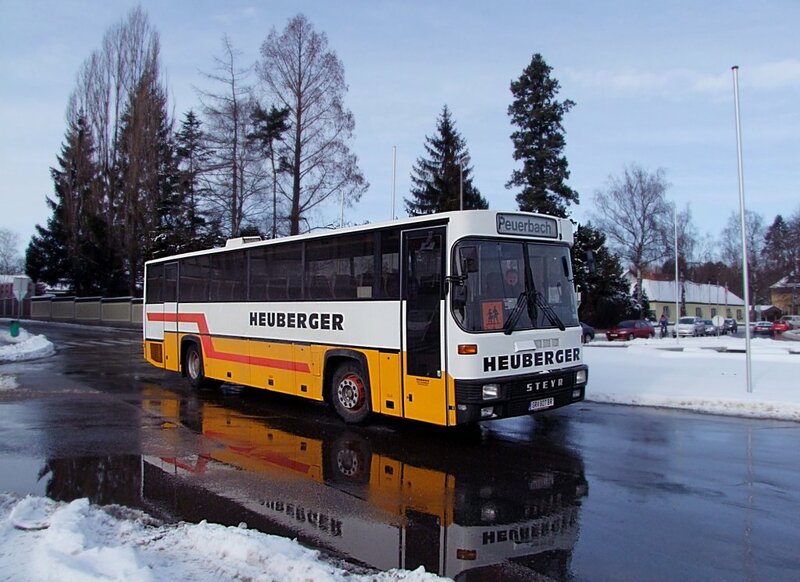 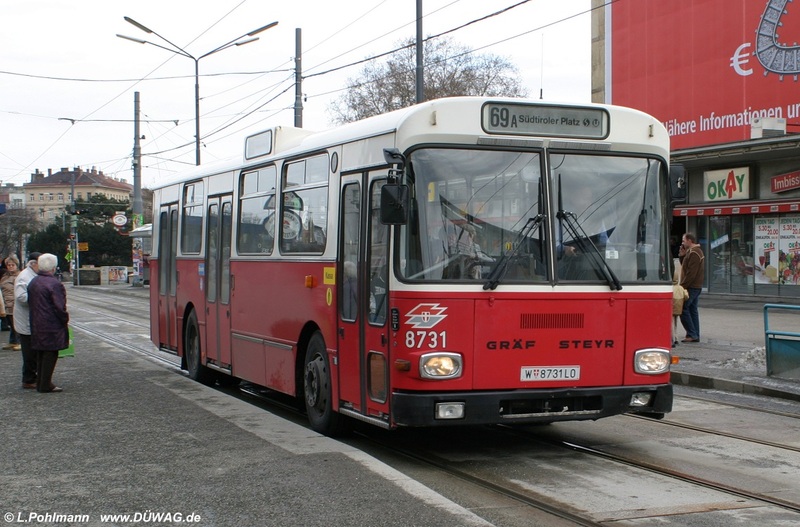 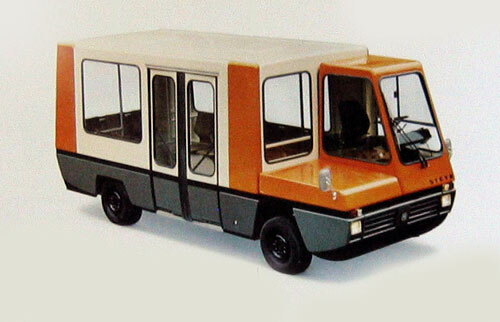 In 1987, Steyr-Daimler-Puch AG began selling portions of its different production lines to form separate companies, which included Steyr Nutzfahrzeuge AG (SNF) (still based in Steyr) for truck manufacturing, Steyr Bus GmbH (in Vienna) for bus manufacturing, Steyr-Daimler-Puch Fahrzeugtechnik AG (SFT) and the EUROSTAR joint venture in Graz-Liebenau for assembly of automobiles and, in 1990, Steyr Tractor (Steyr Landmaschinentechnik AG). 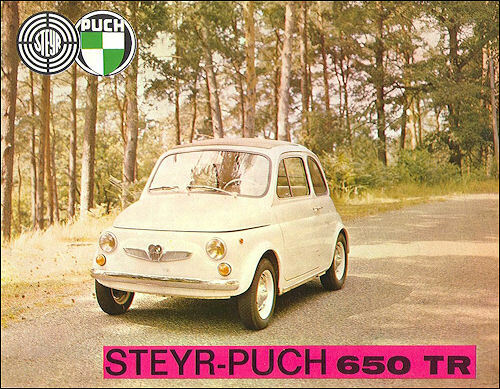 Other production lines were also spun off or sold outright to form independent companies, including Puch’s motorcycle division going to Piaggio and Steyr Mannlicher producing weapons. 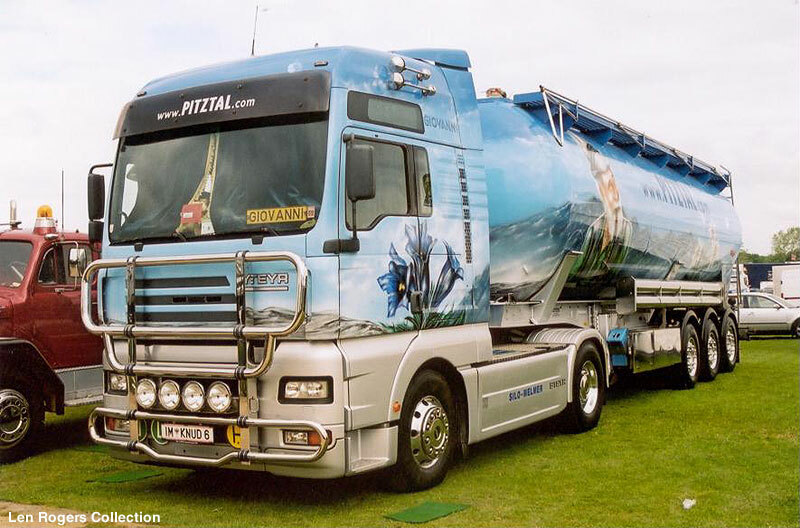 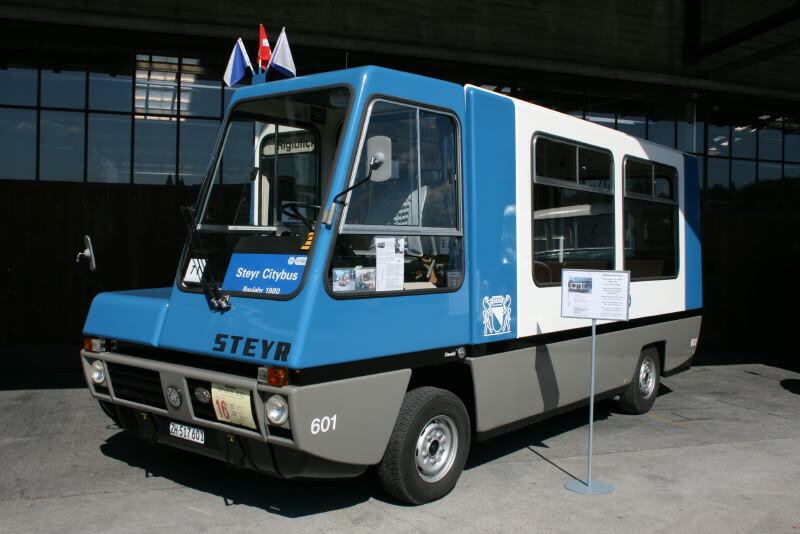 In 1990, the diesel engine division was spun off into Steyr Motorentechnik GmbH, which in 2001 became an independent company, renaming itself Steyr Motors GmbH. 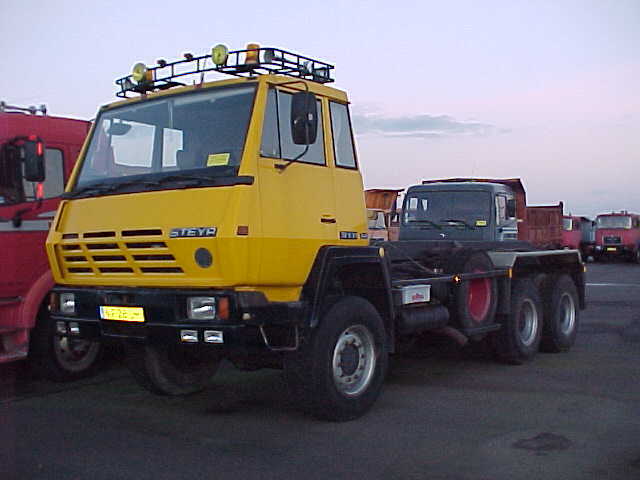 Steyr Landmaschinentechnik AG (Steyr Tractor) was sold to Case Corporation in 1996 and renamed Case Steyr Landmaschinentechnik (and is part of CNH since 1999). 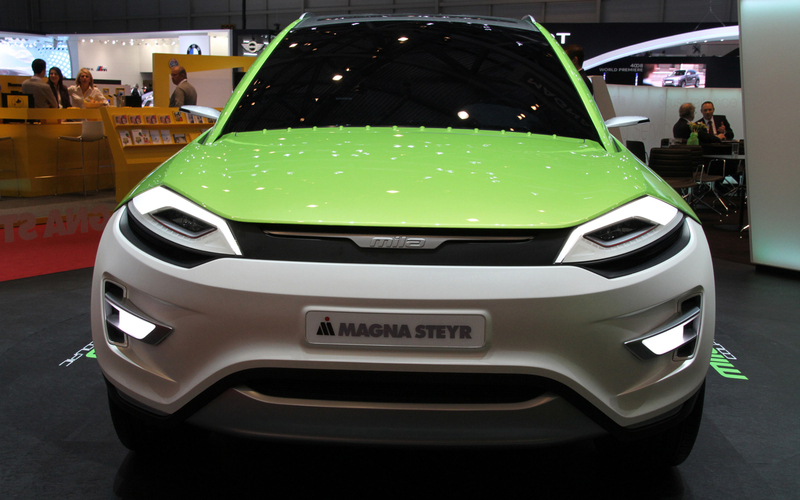 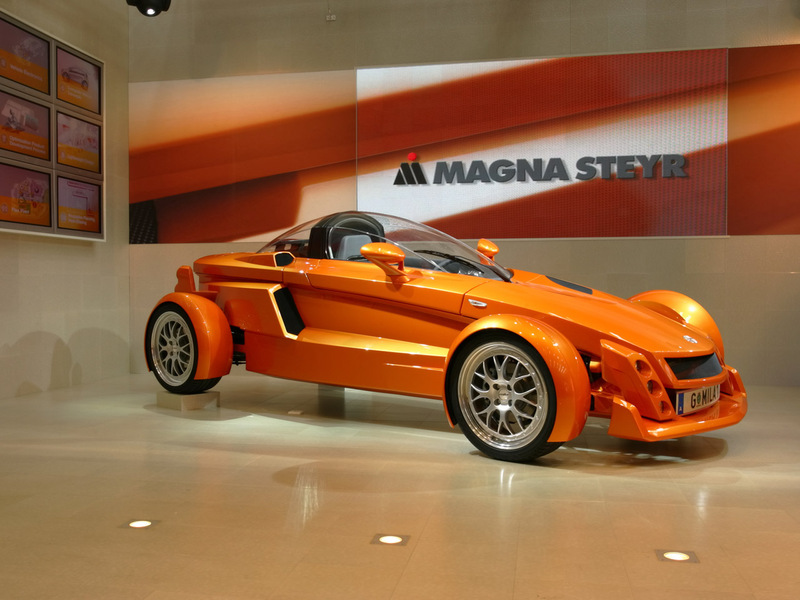 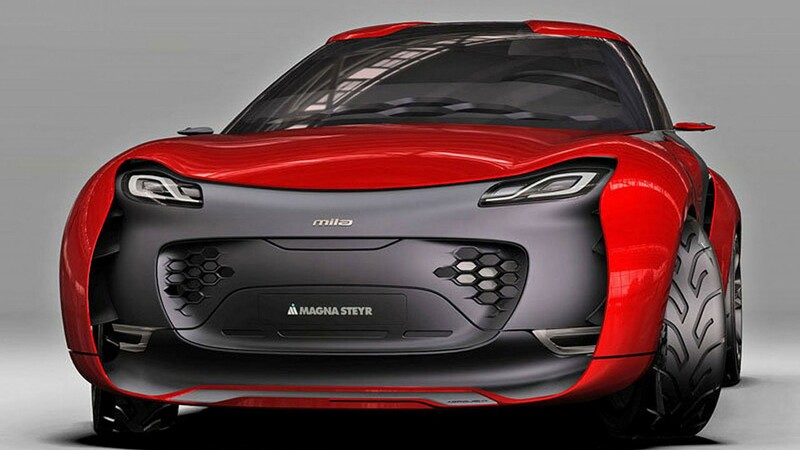 Automobile production remained with Steyr-Daimler-Puch Fahrzeugtechnik (SFT) until Magna International acquired a majority holding, in 1998, and in 2001–2 SFT was absorbed fully by Magna, becoming Magna Steyr. 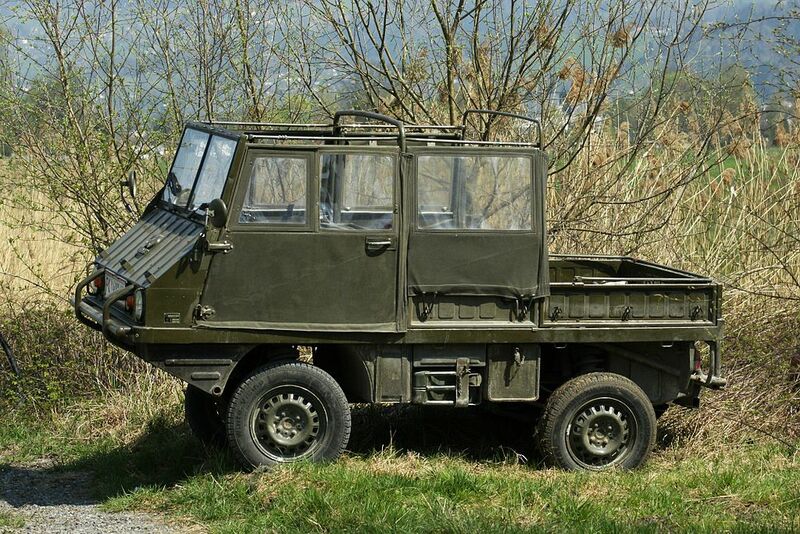 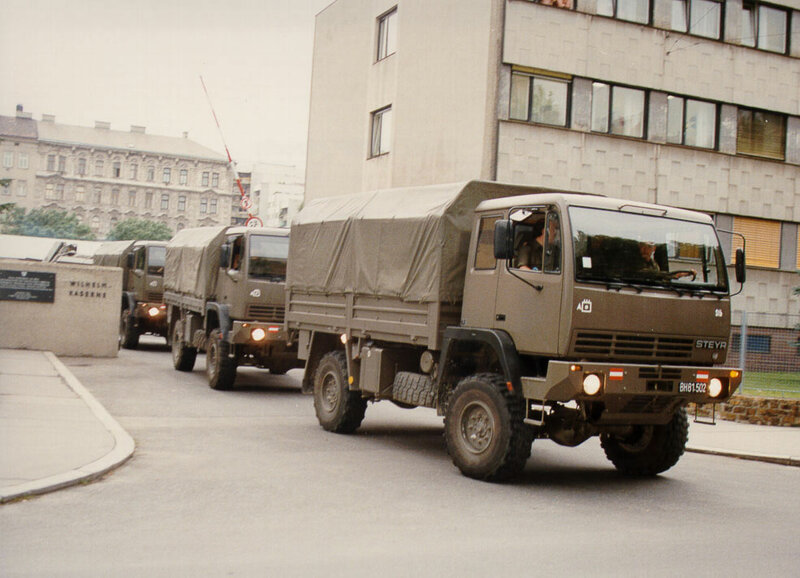 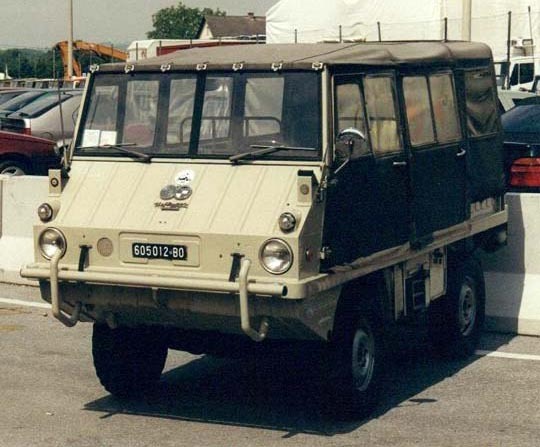 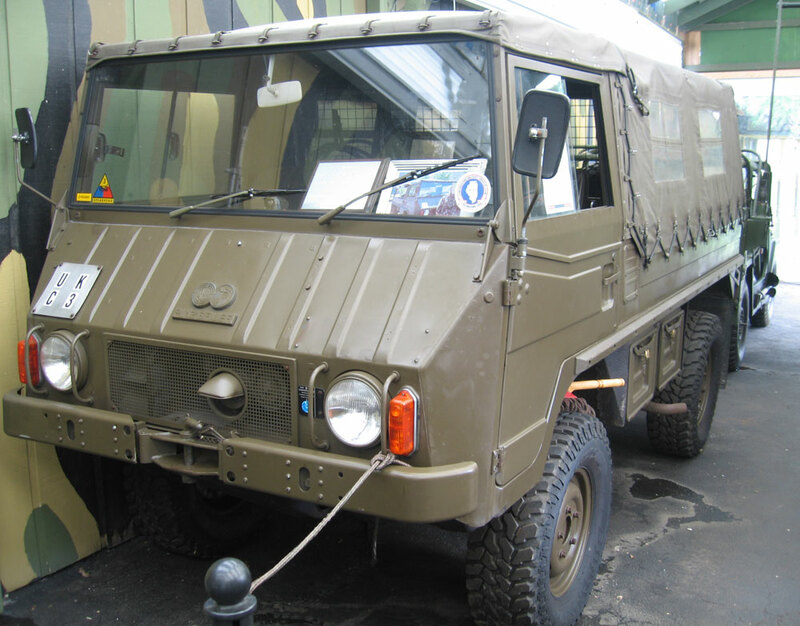 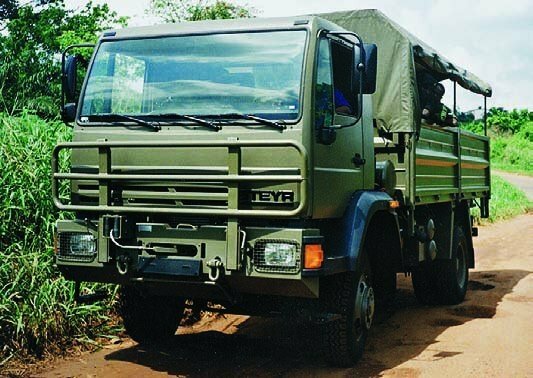 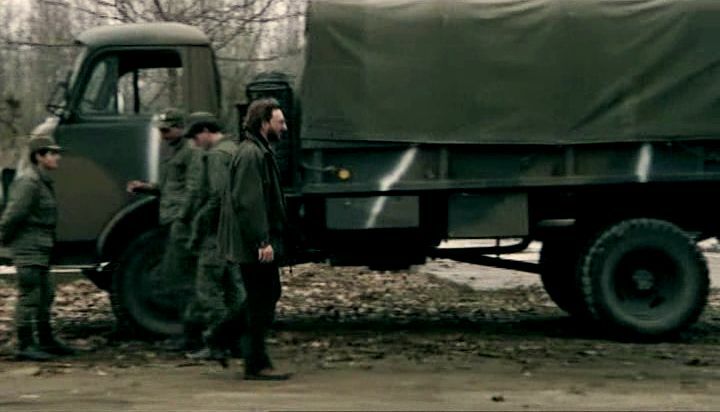 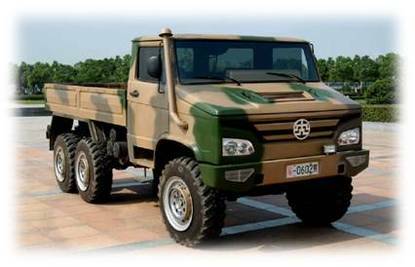 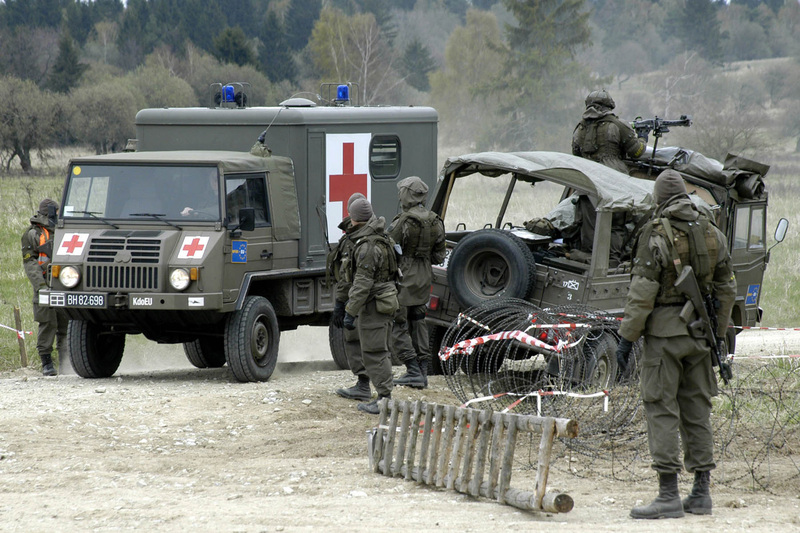 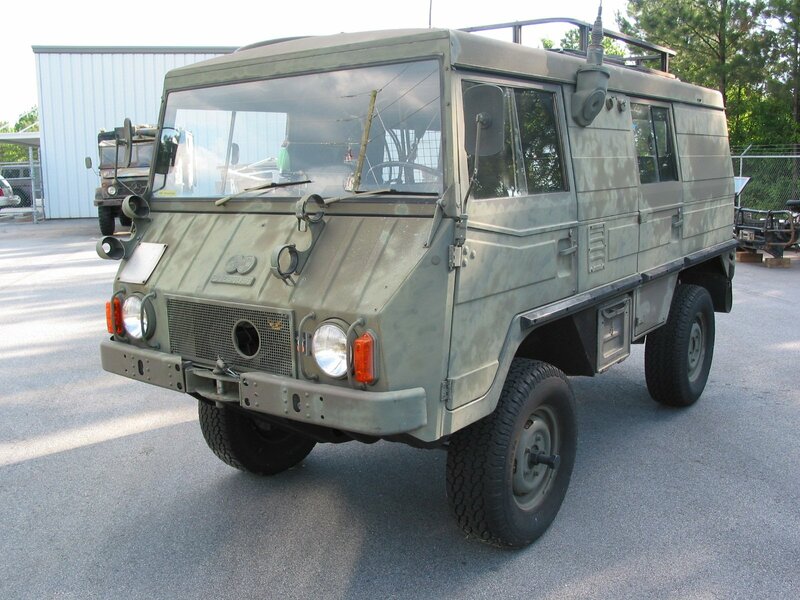 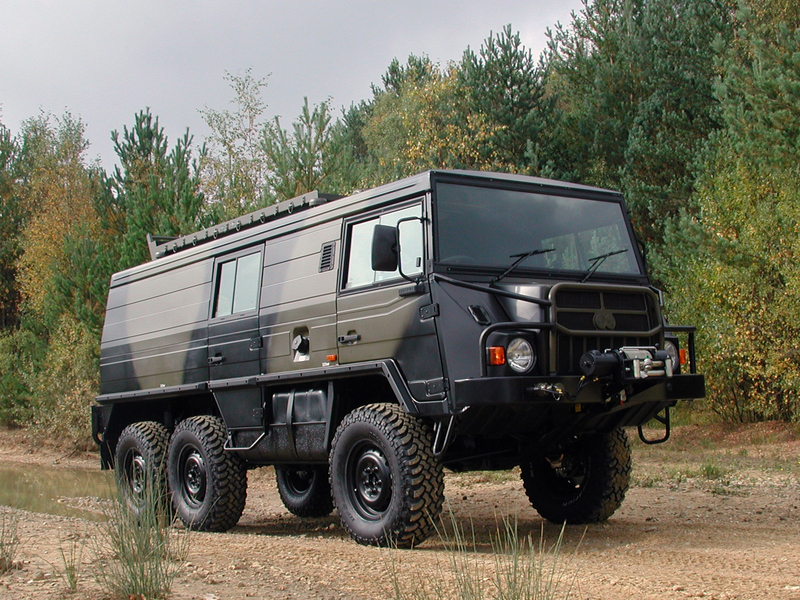 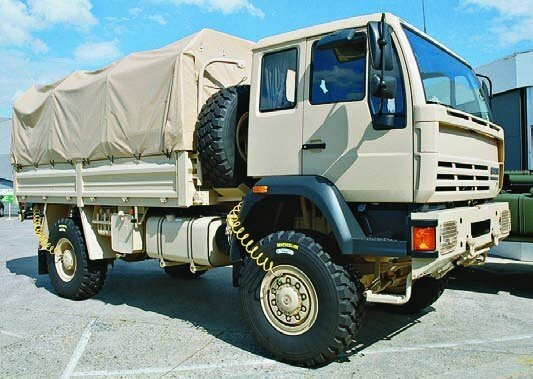 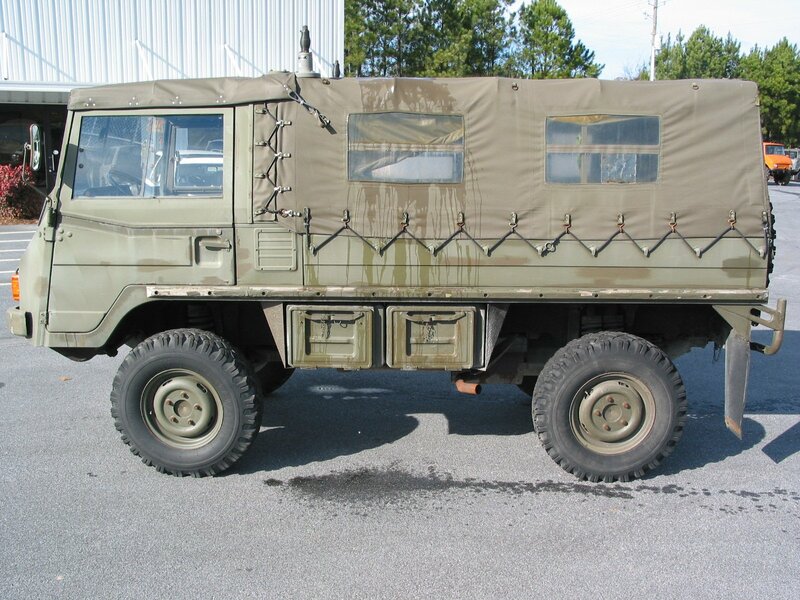 In 1998, the production of military vehicles was sold to an Austrian investor company, which named it Steyr-Daimler-Puch Spezialfahrzeug GmbH (SSF). 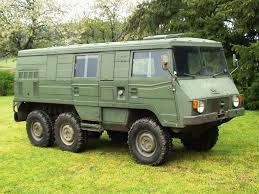 In 2003, SSF was sold to the U.S. company General Dynamics, a defence equipment manufacturer. 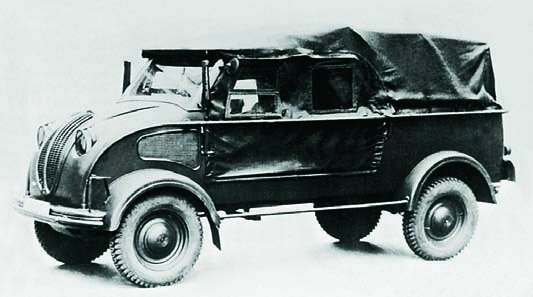 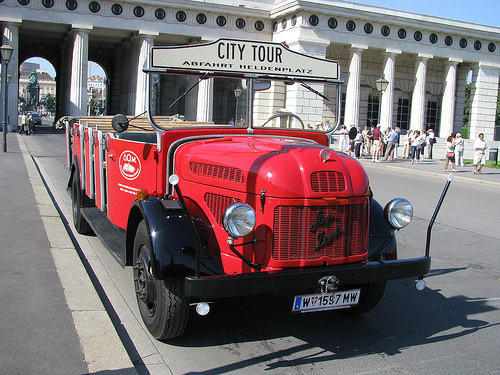 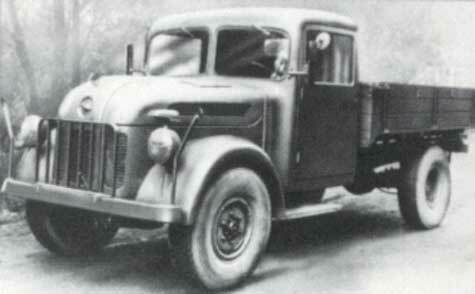 Steyr’s first truck was the Typ III, presented in 1920. 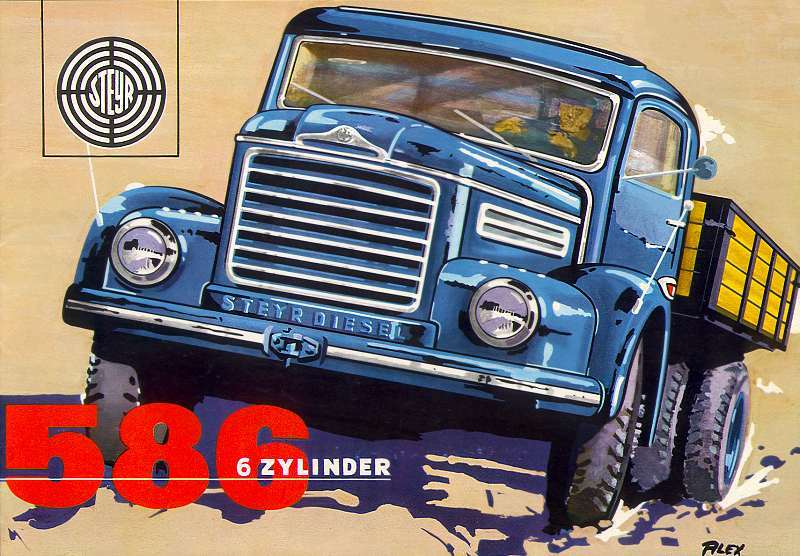 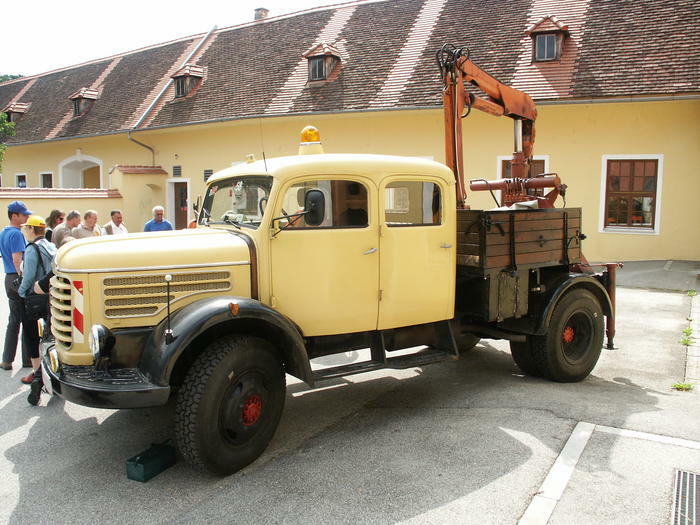 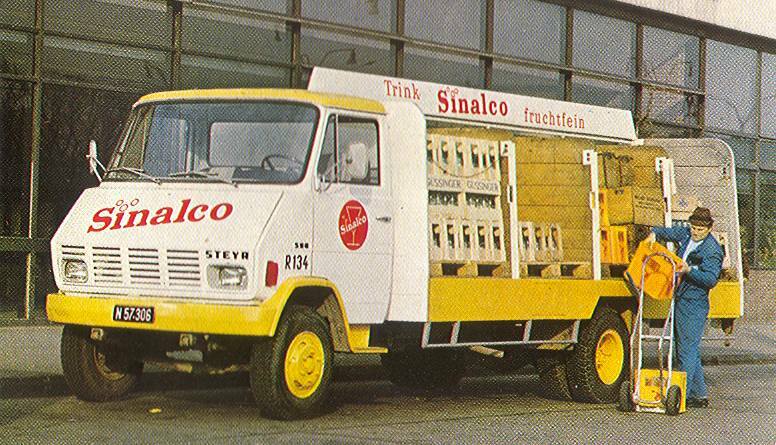 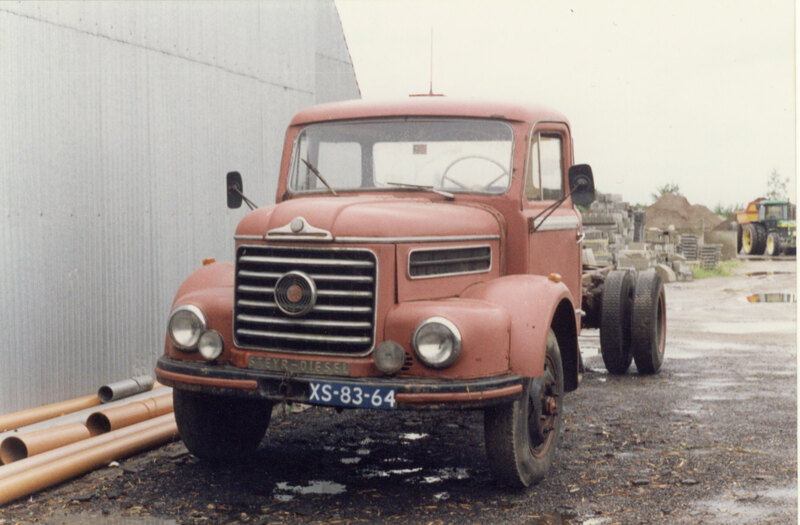 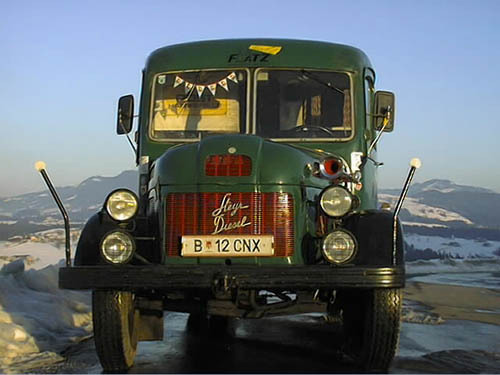 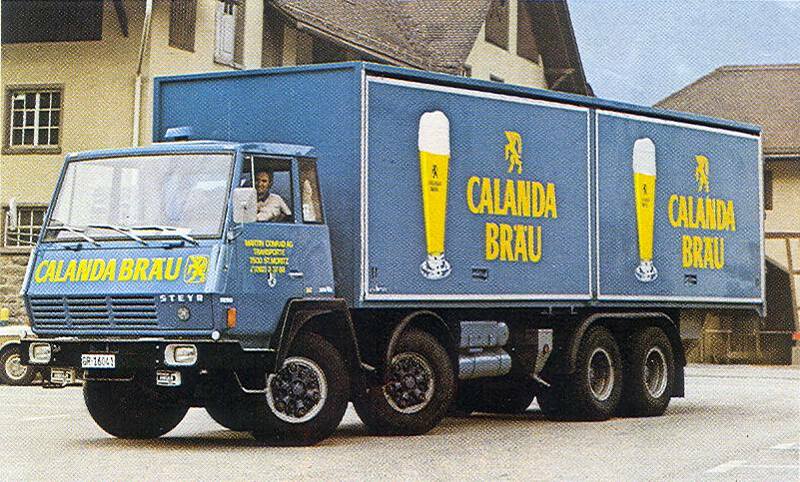 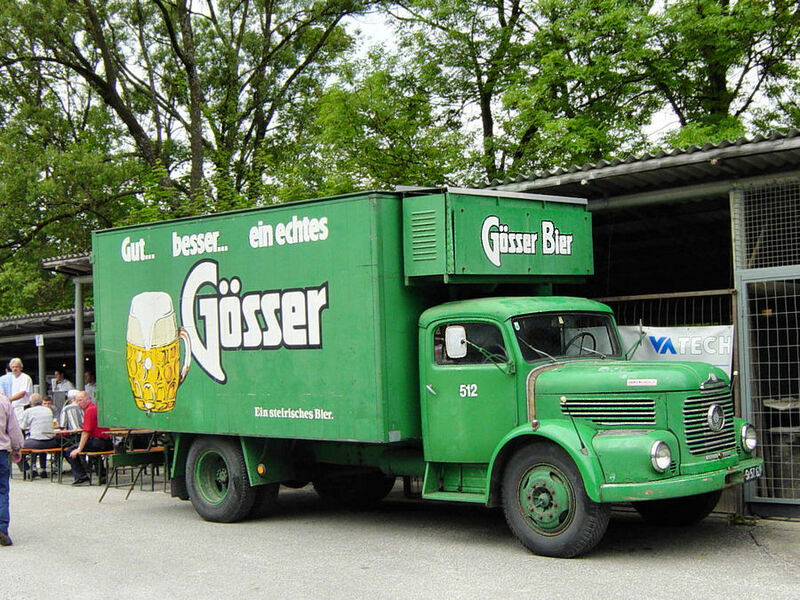 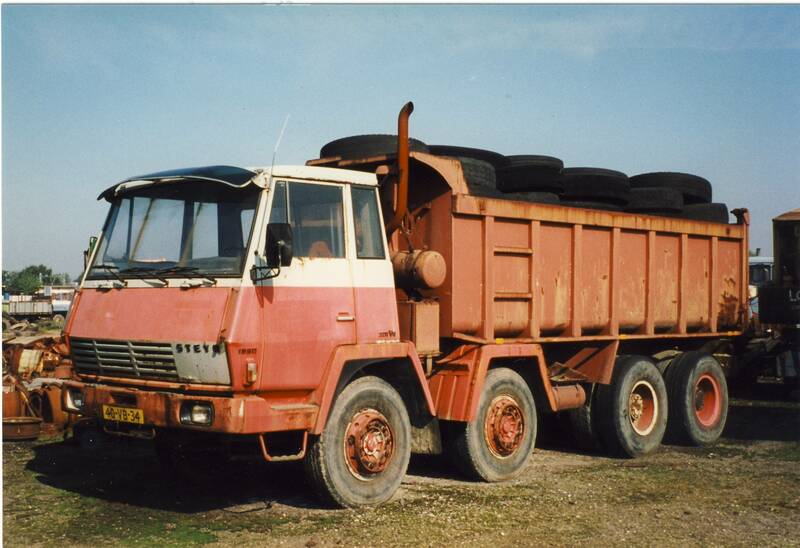 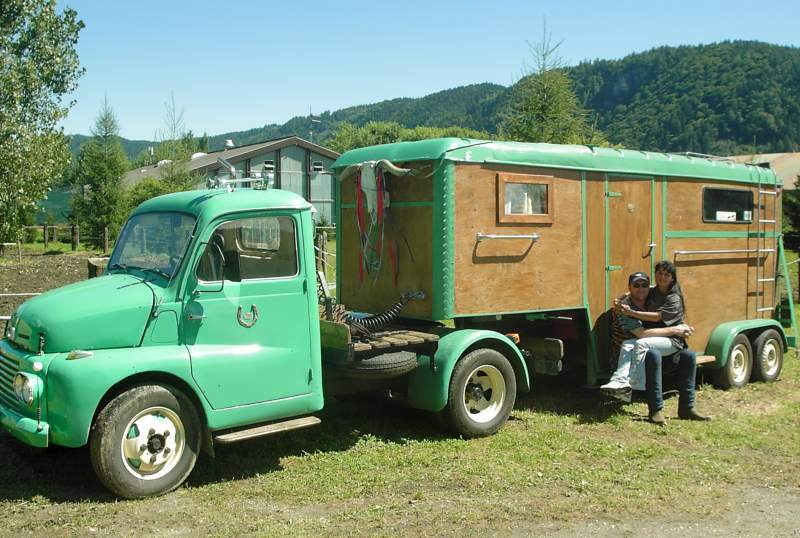 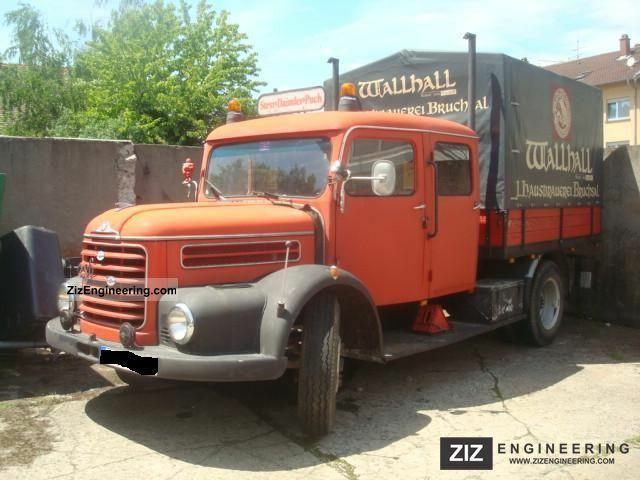 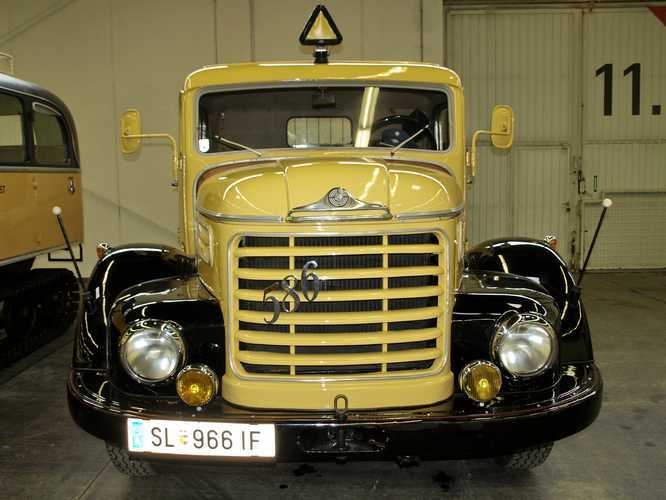 Steyr built traditional bonneted trucks in the post war years, but in 1968 the distinctive cab over Steyr 90 series was introduced. 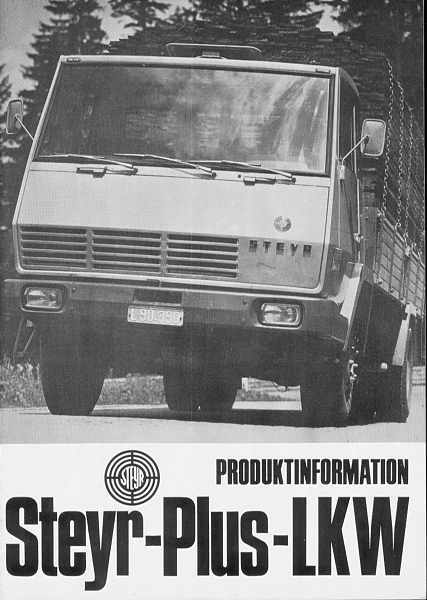 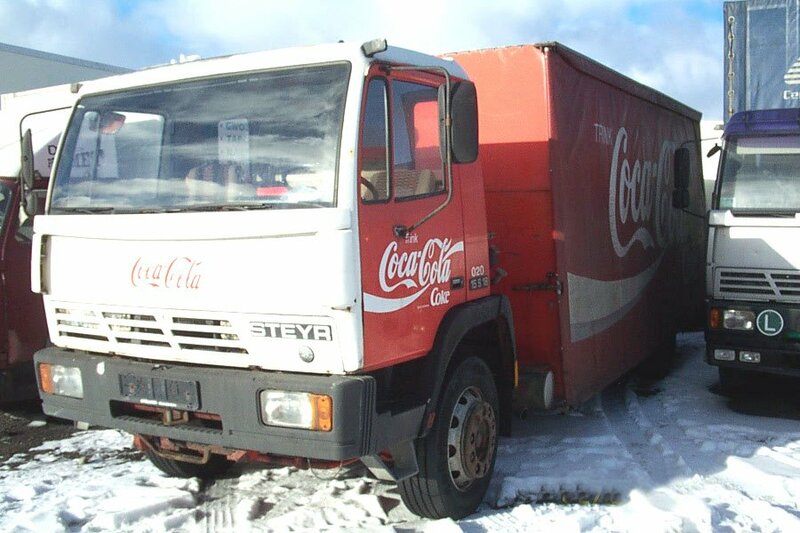 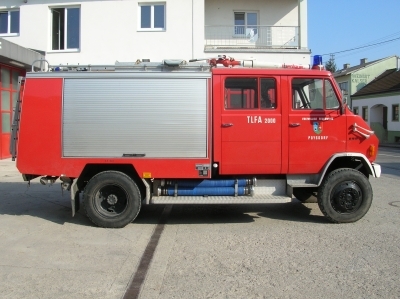 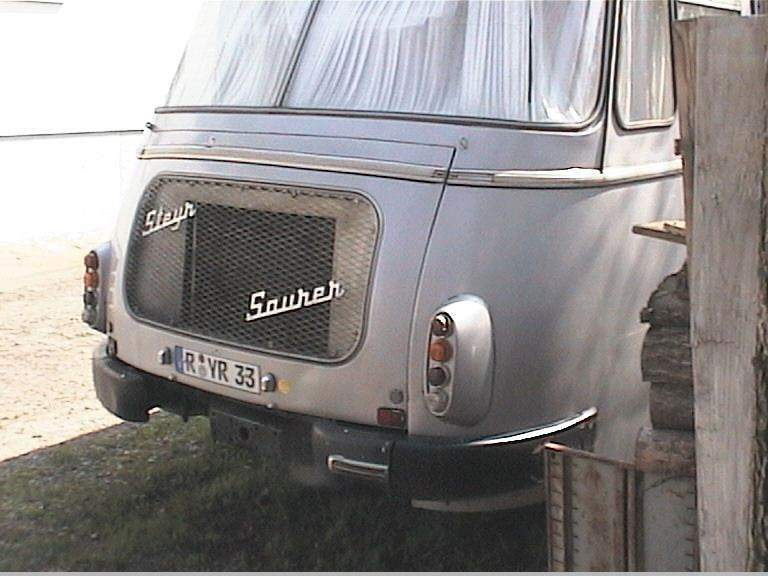 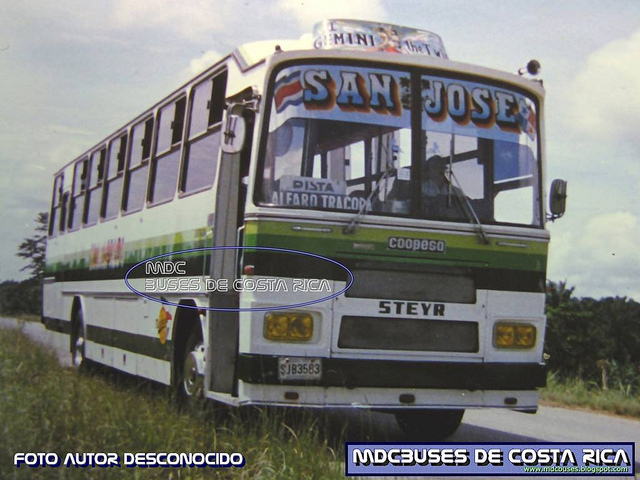 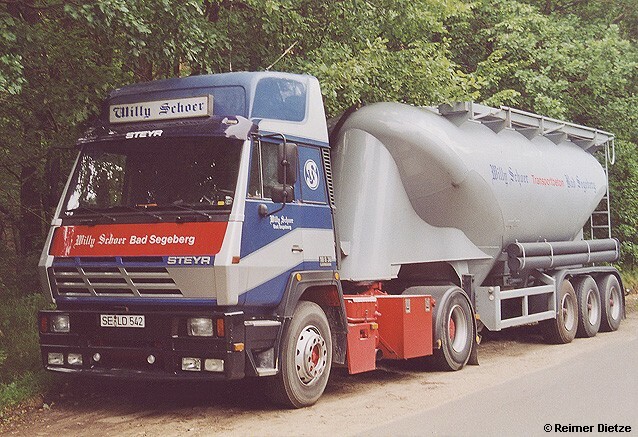 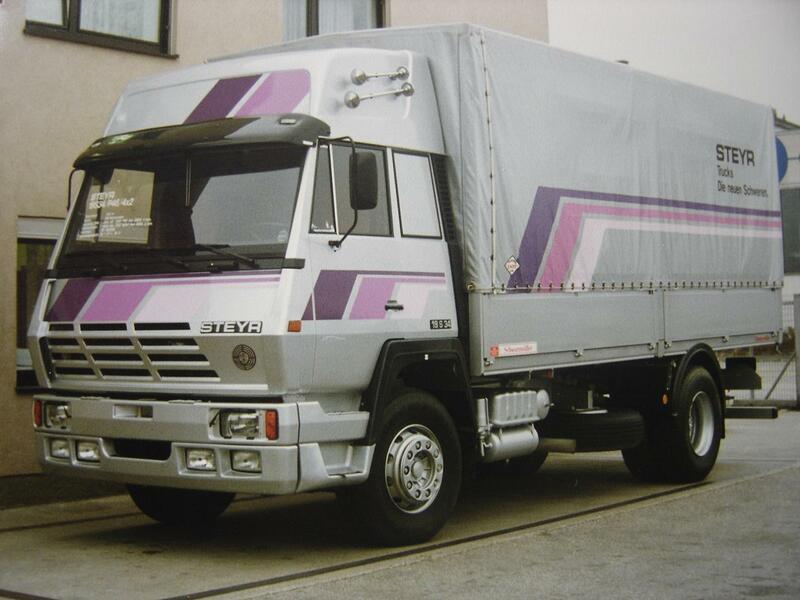 This was followed by the 91 and the 92 series, built until MAN took over Steyr’s truck production in 1990. 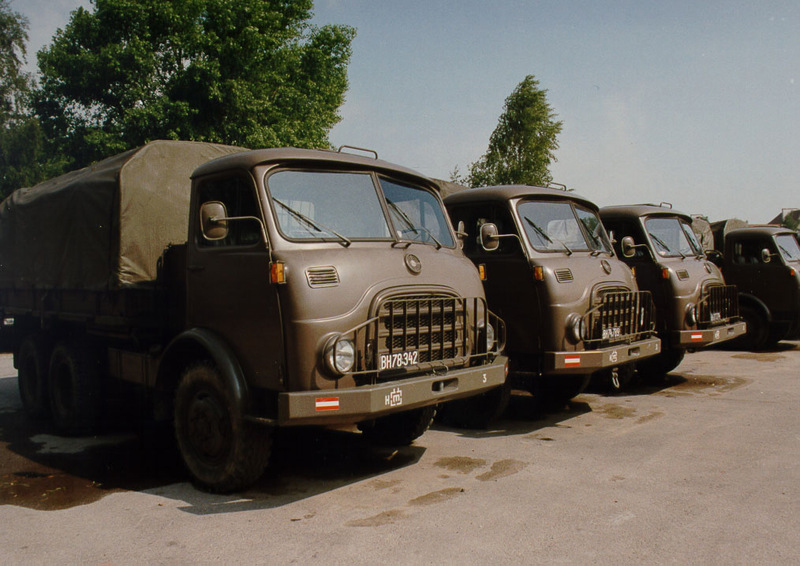 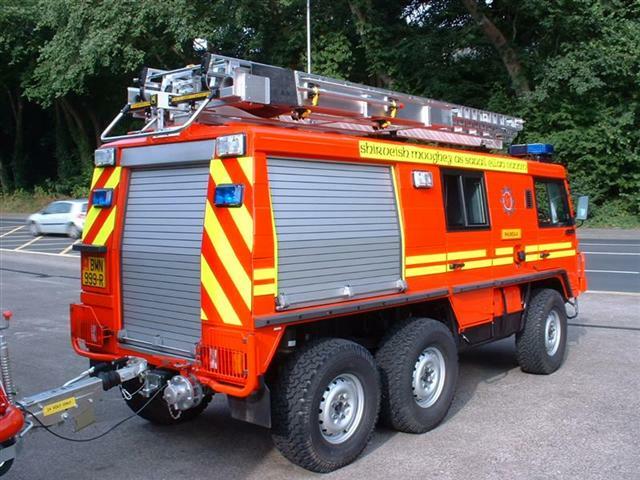 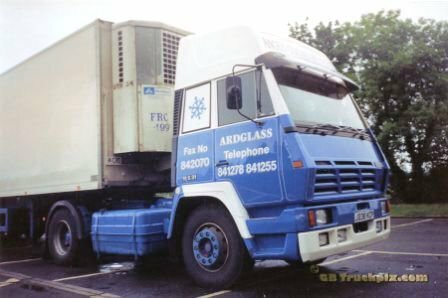 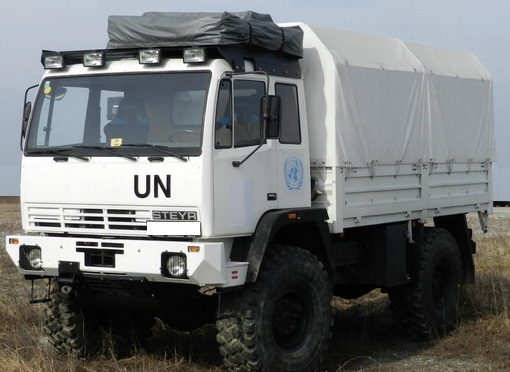 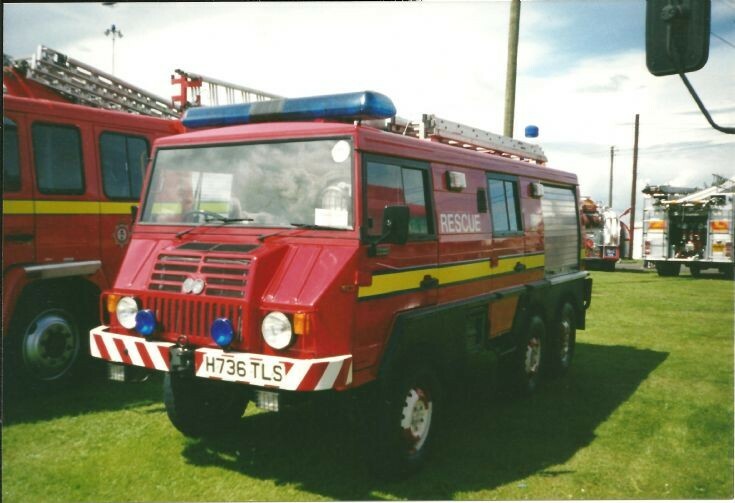 A version of the 92 series is still built as the 12M18/12S18 for a number of military users, and was also sold by Britain’s ERF as the ES-series. 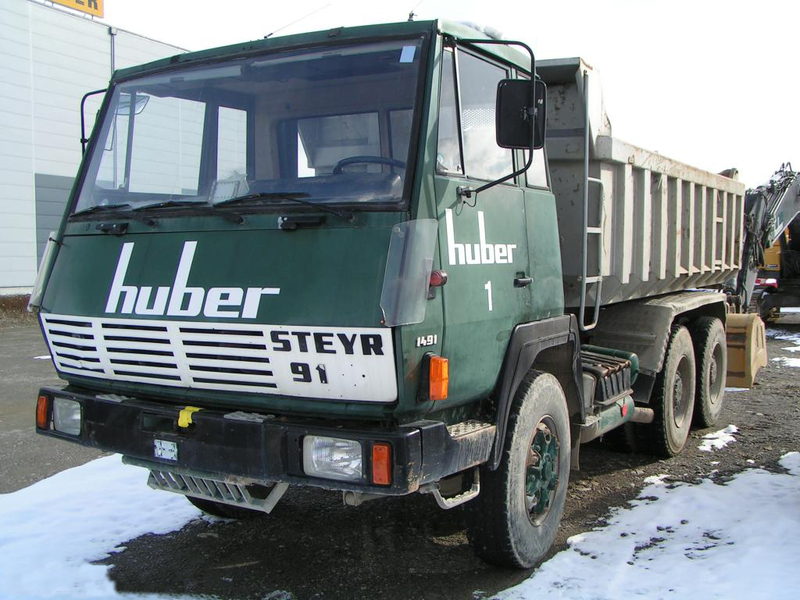 Some MAN trucks are still available with “Steyr” branding for the Austrian market. 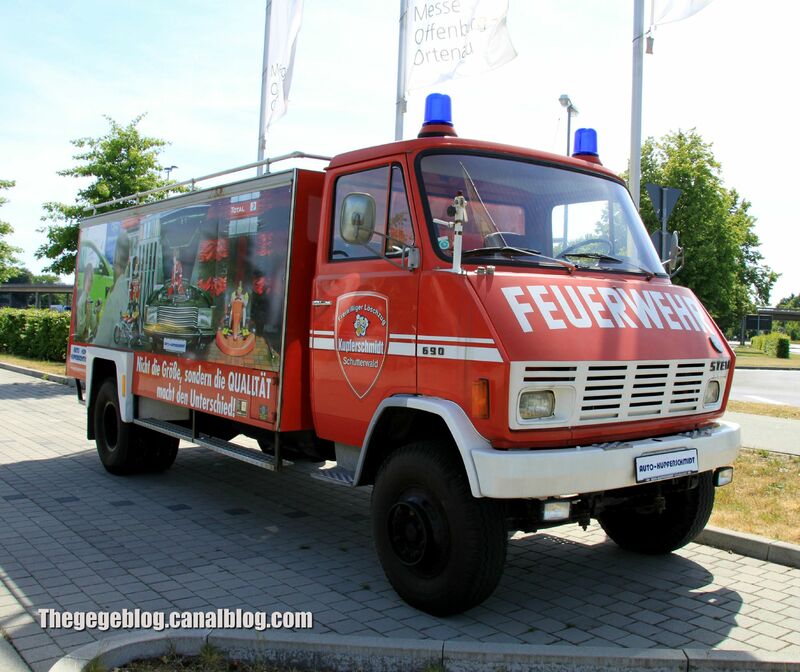 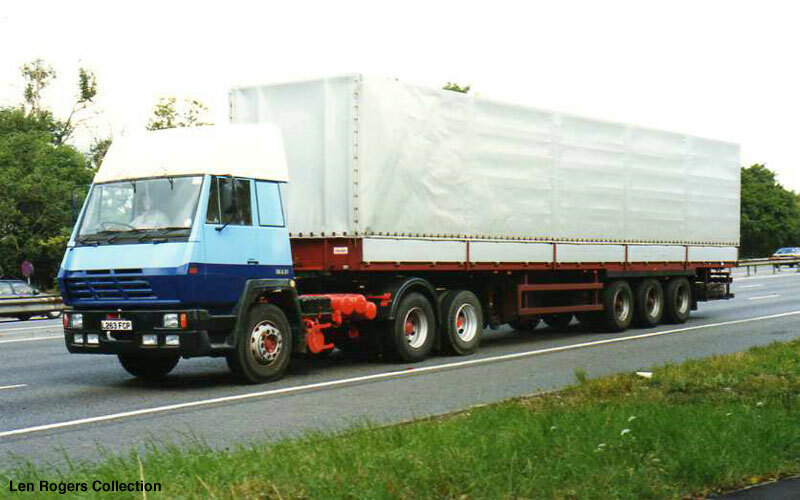 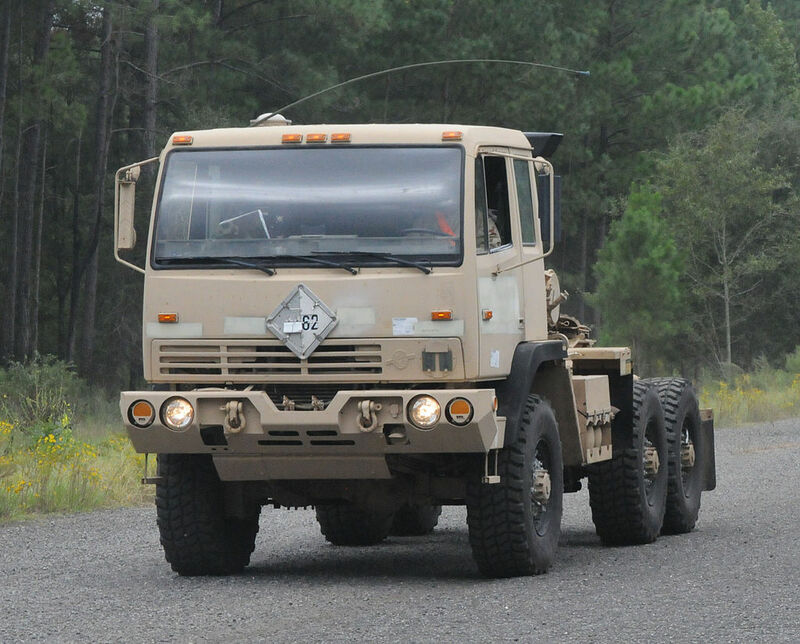 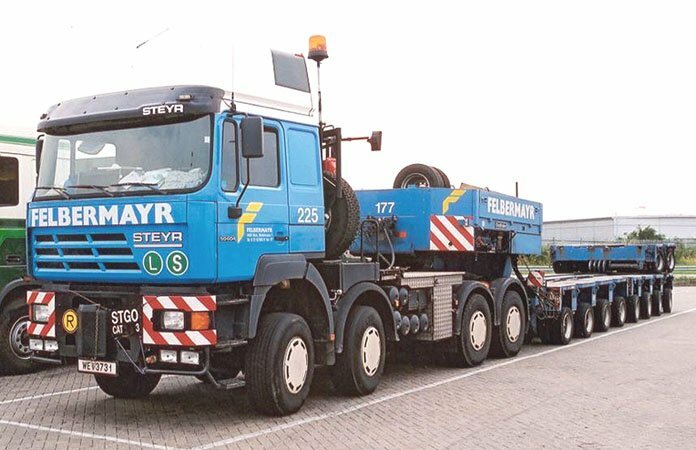 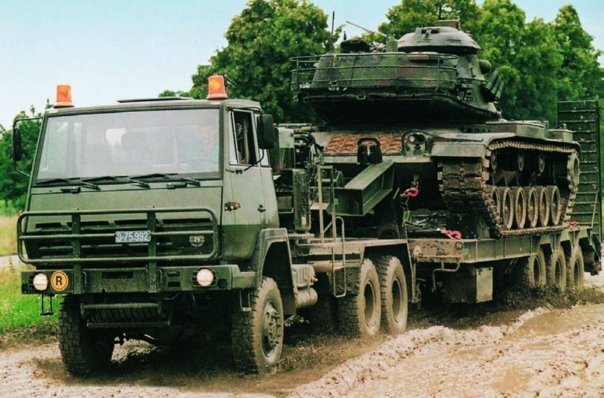 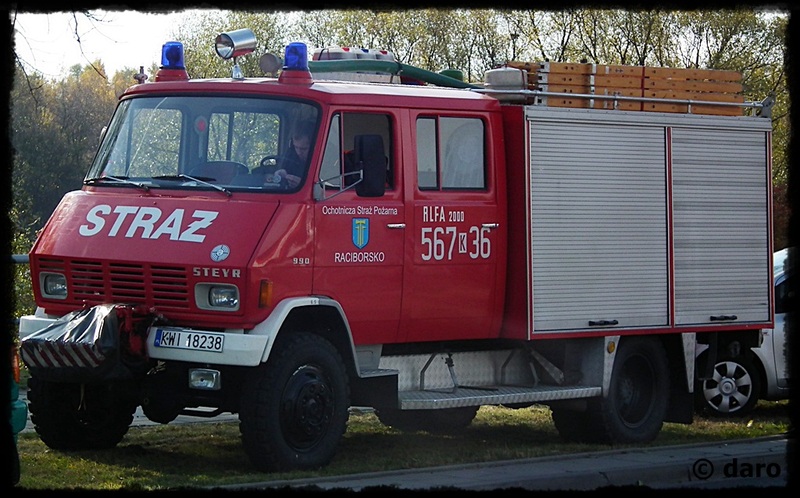 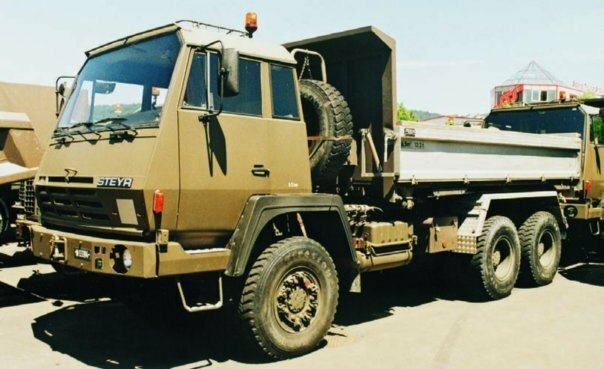 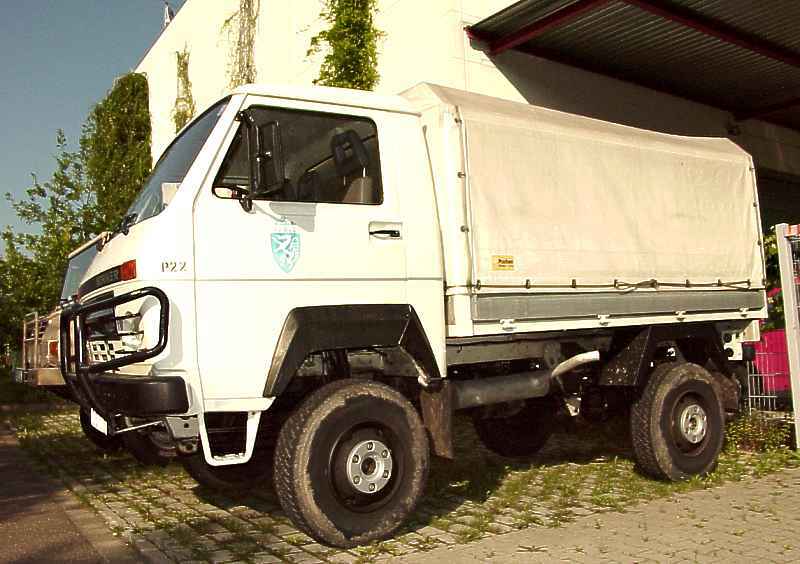 Beginning in 1994, Steyr used MAN’s F2000 cab for the NSK series (Neue Schwere Klasse, or “new heavy class”), while the light and medium duty trucks were the NLK and NMK (Neue Leichte Klasse and Neue Mittlere Klasse), based on MAN’s similarly situated L2000 and M2000 ranges respectively. 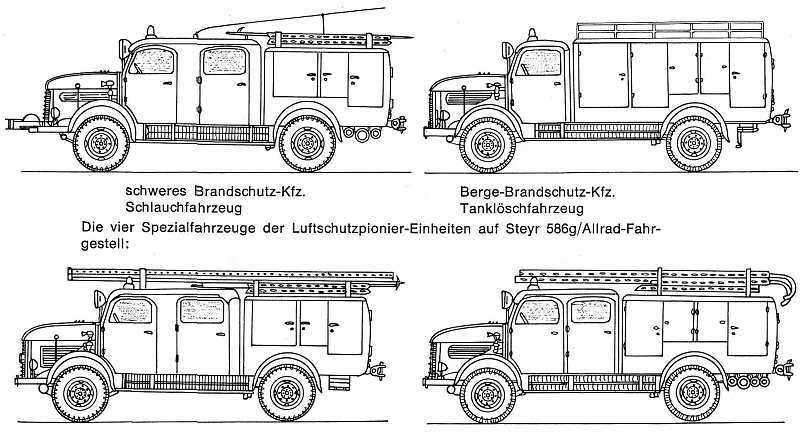 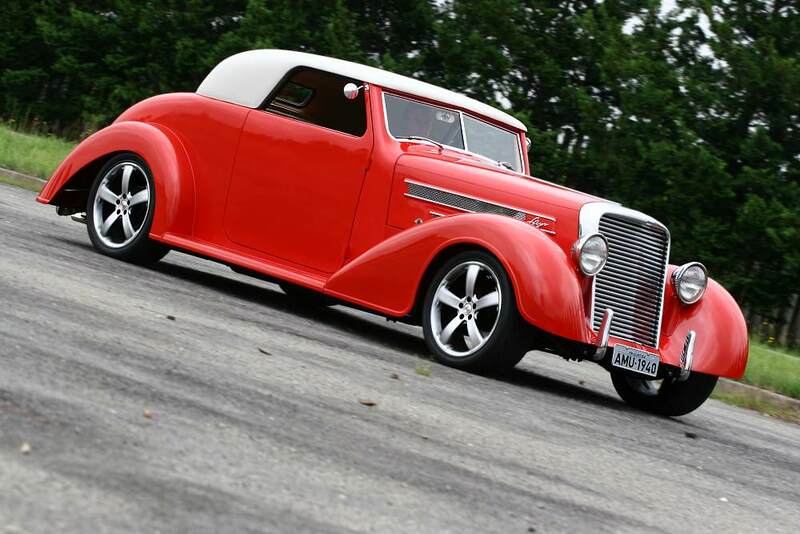 The NLK ranged from the 6S10 (6.5 tons, 102 PS) to the 11S23 (11 tons, 233 PS). 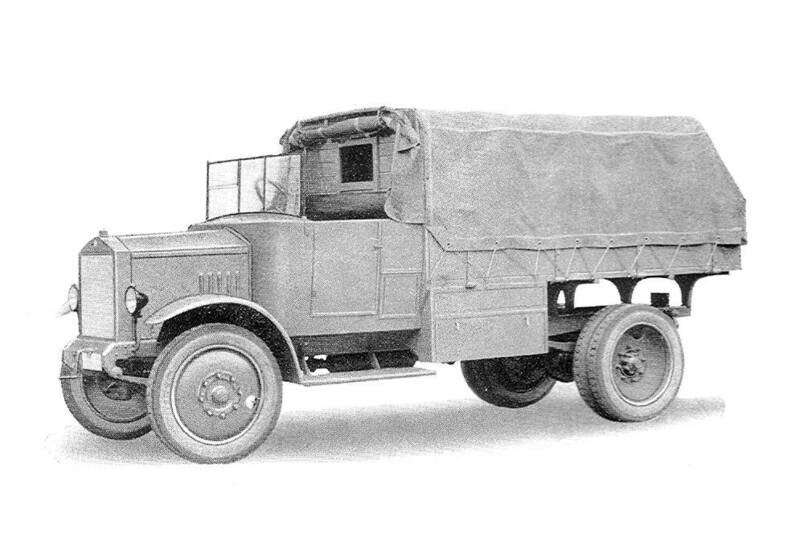 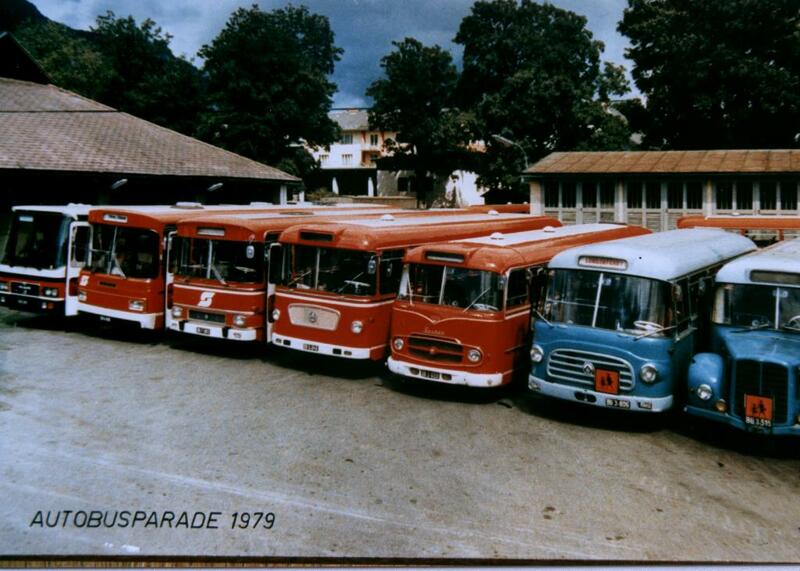 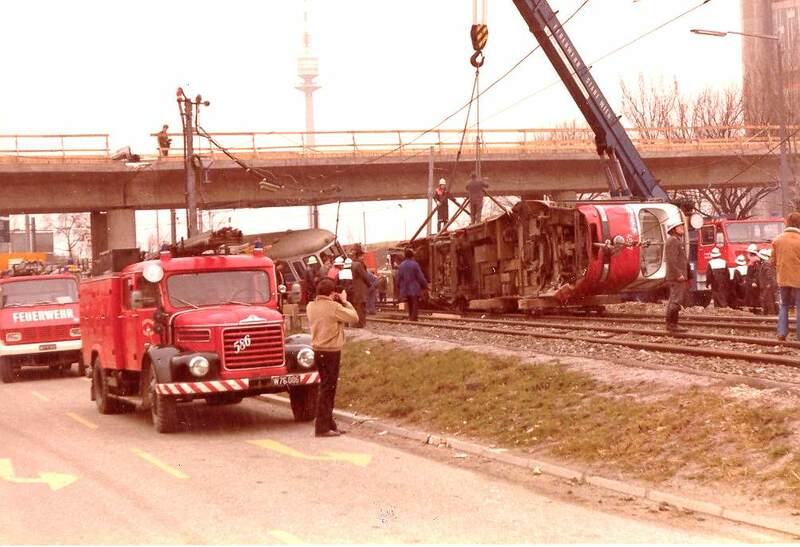 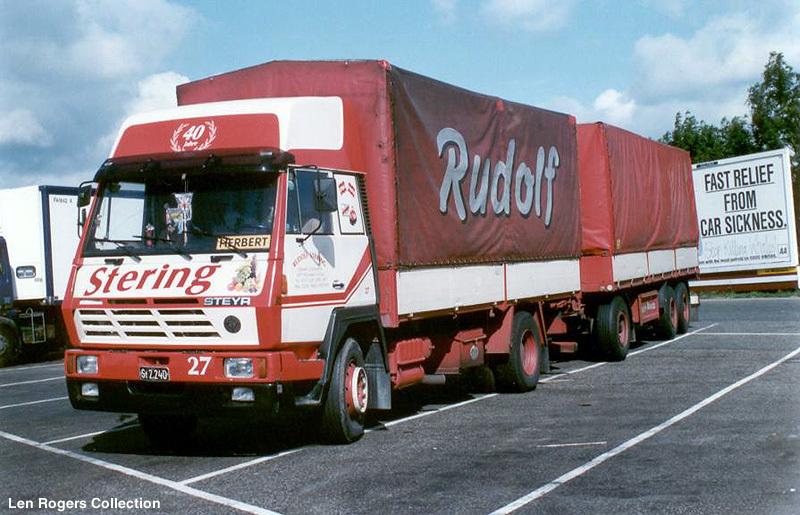 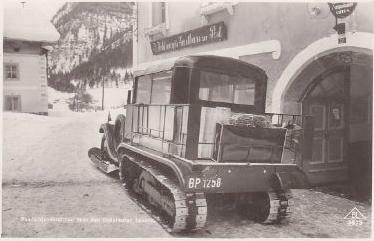 The NMK range was from 12 tonners up to the three-axle 25S26. 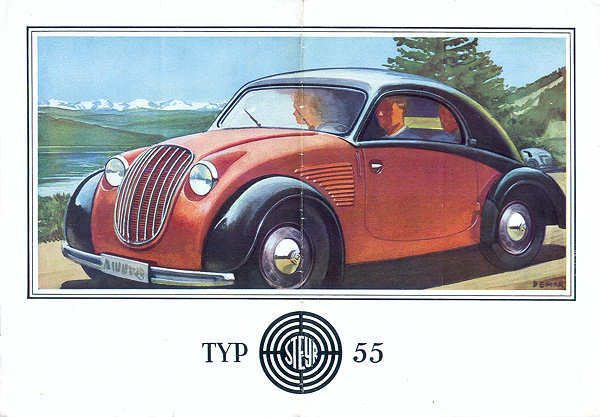 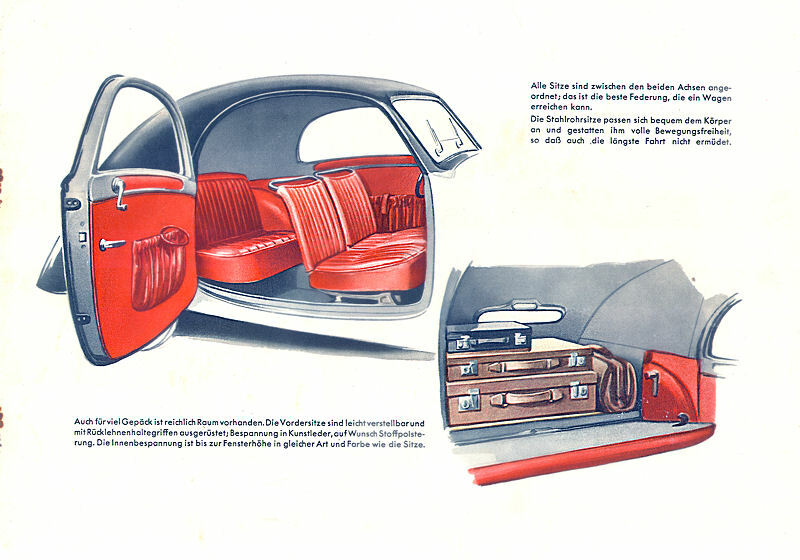 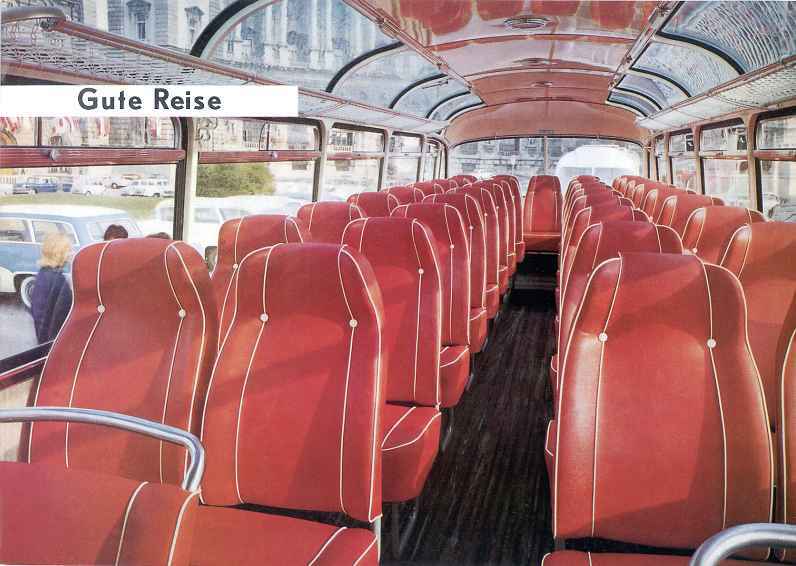 These cabins were referred to as “Typ 152” in Steyr’s internal parlance. 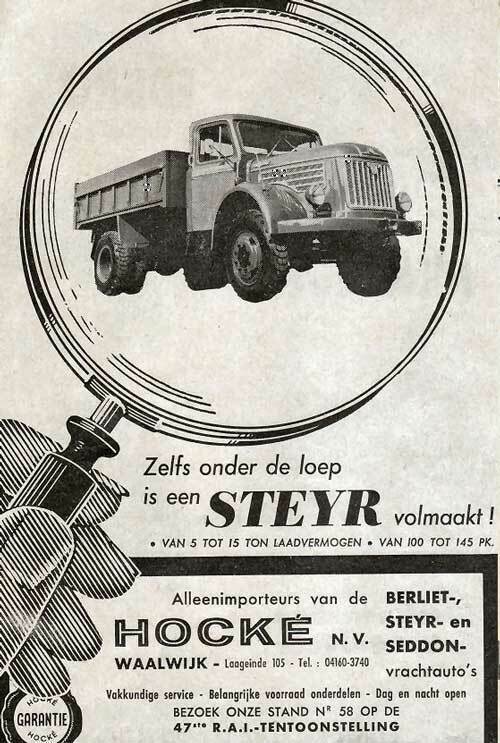 Ek gaan maar in Afrikaans skryf, my Nederlands is erg oud. 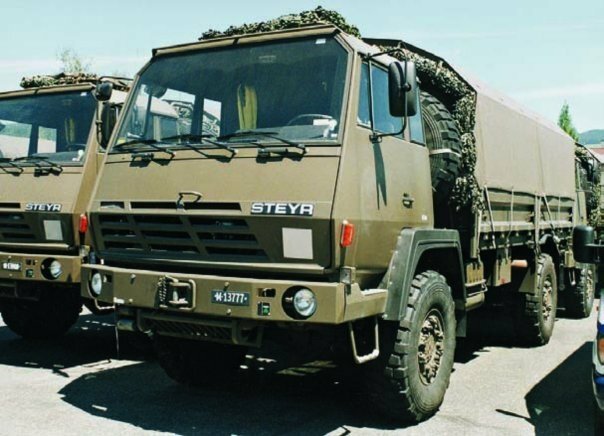 Jou artikel oor Steyr Puch is baie interessant. 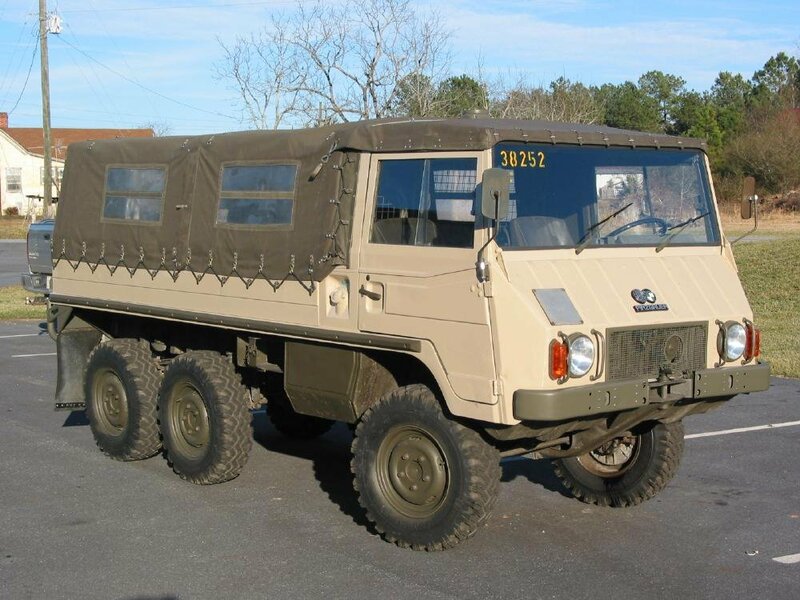 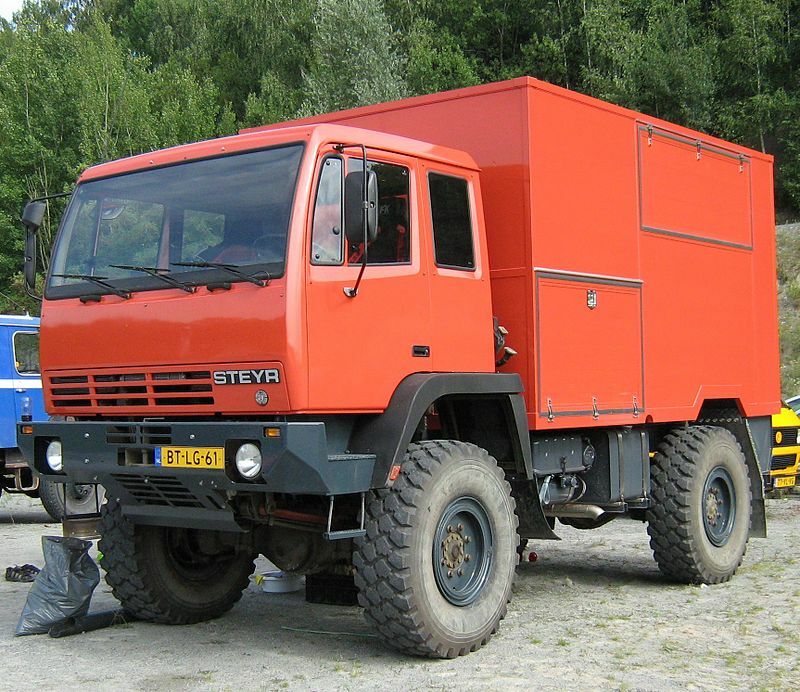 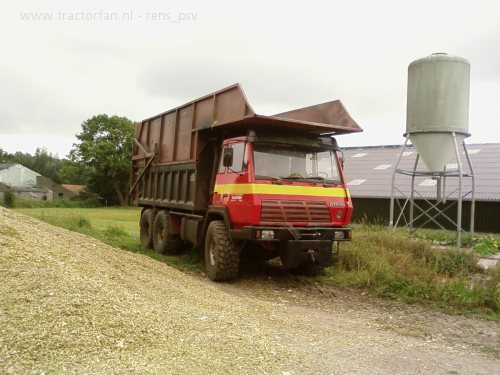 Laasweek het een van ons lede hier ‘n 1971 Pinzgauer 710 M in baie goeie toestand gekry. 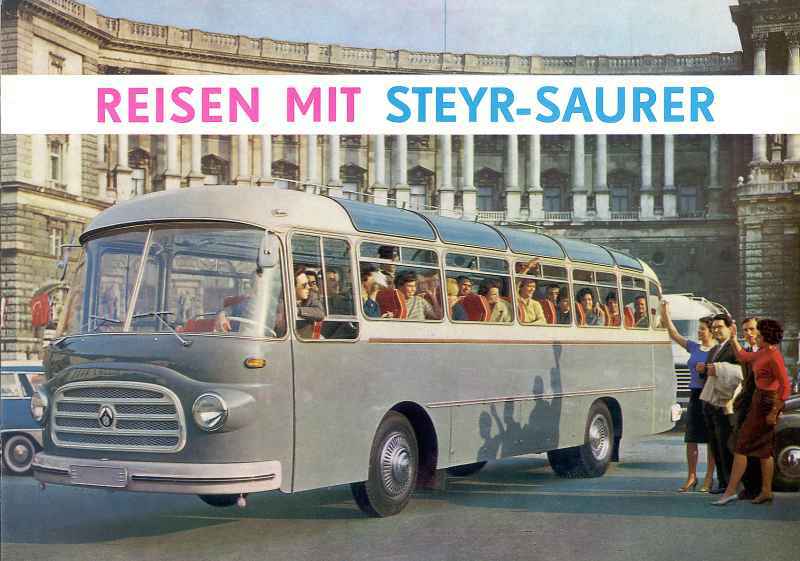 Sy blog is hier, miskien kan jy waardevolle inset lewer. 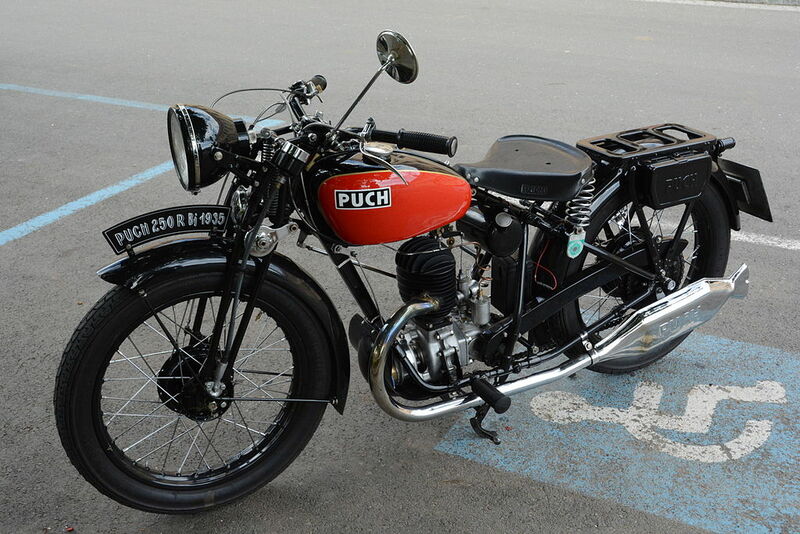 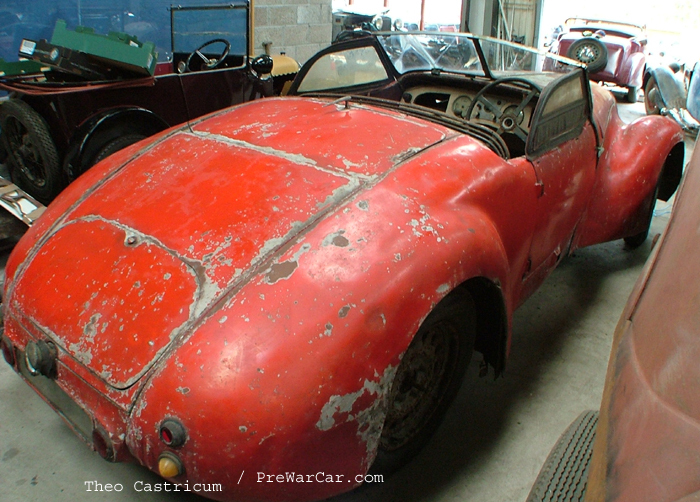 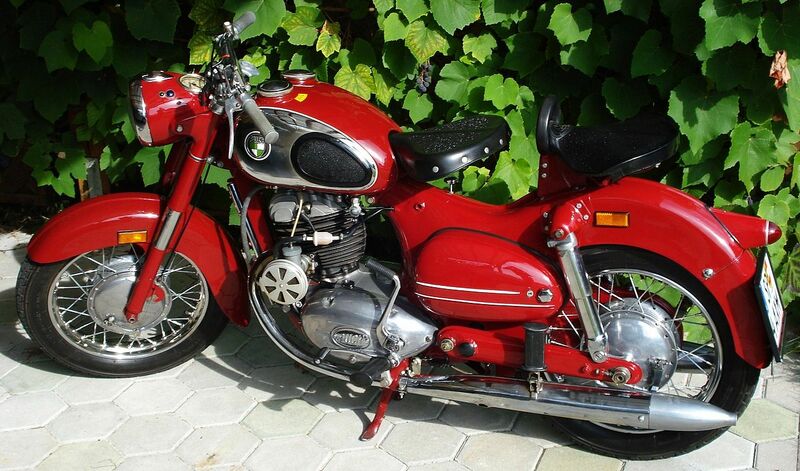 Hi, I recently located a 1964 Steyr-Daimler Puch AG-Graz VZ60R (220kg) motorcycle and want to try obtain parts to include a set of keys and advise on restoring it. 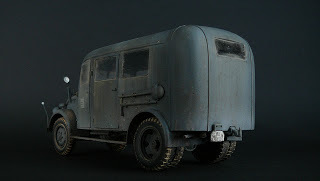 Sorry, I can’t but I put your question on my site. 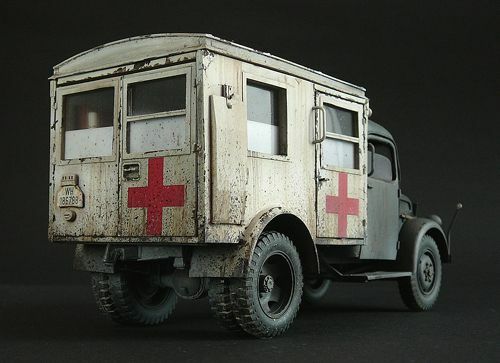 Maybe someone else can help you. 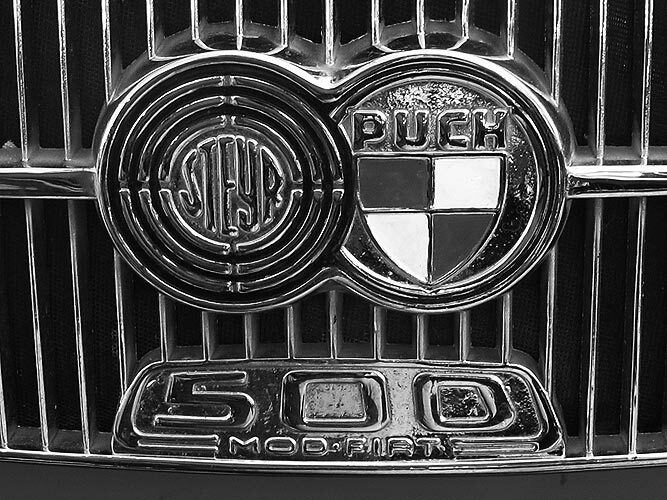 Greetings and good luck.